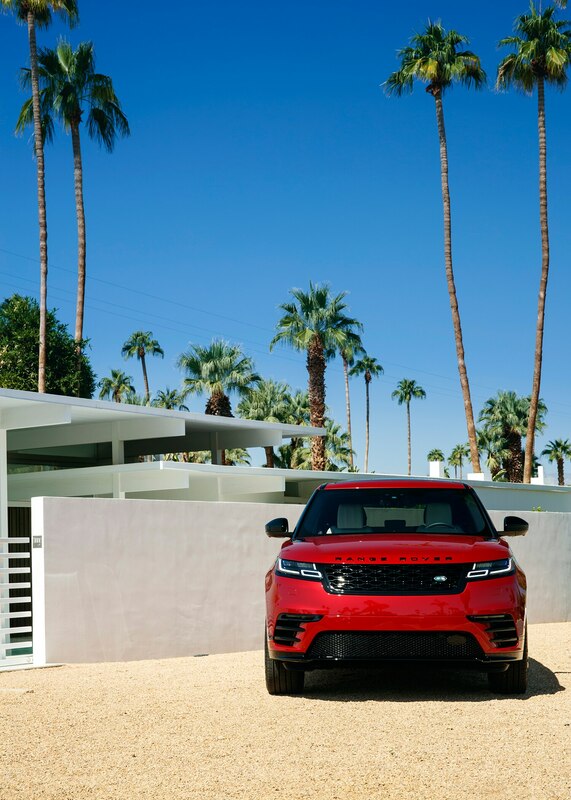 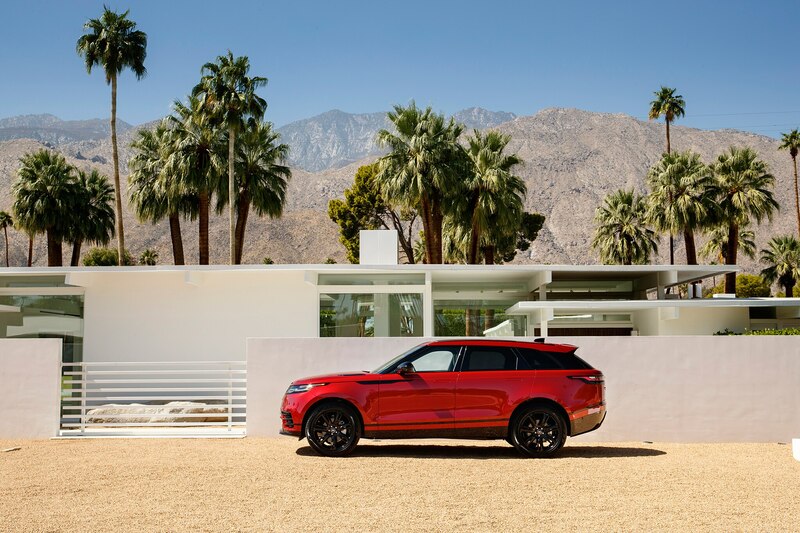 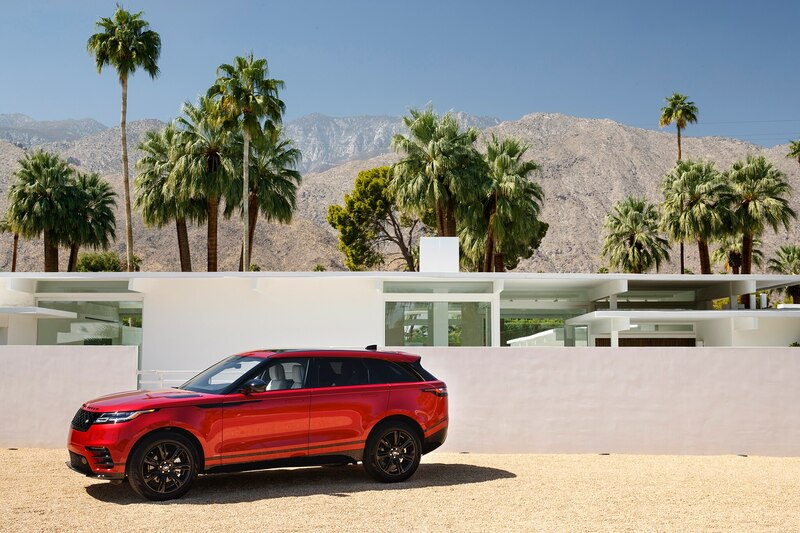 PALM SPRINGS, California — You’ll be forgiven if the 2018 Range Rover Velar seems like a head-scratcher at first. 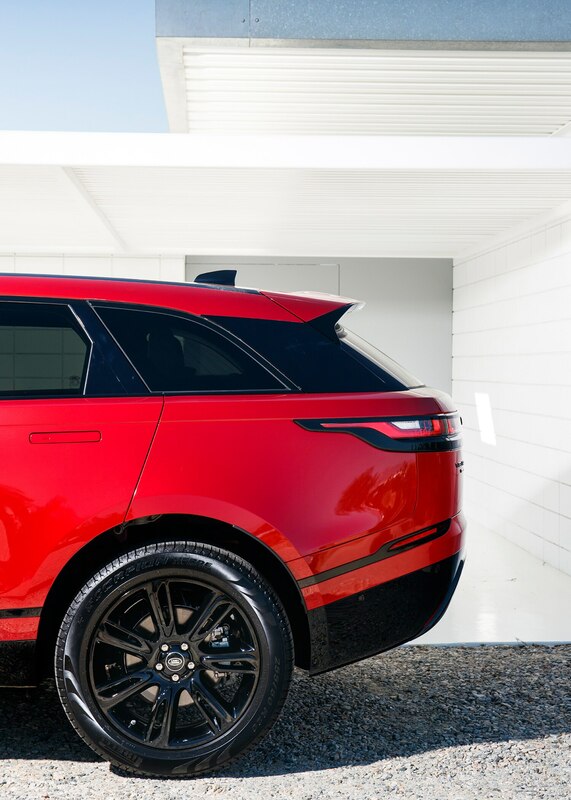 After all, the newest member of the Land Rover family is about the same size as the extant and more expensive Range Rover Sport. 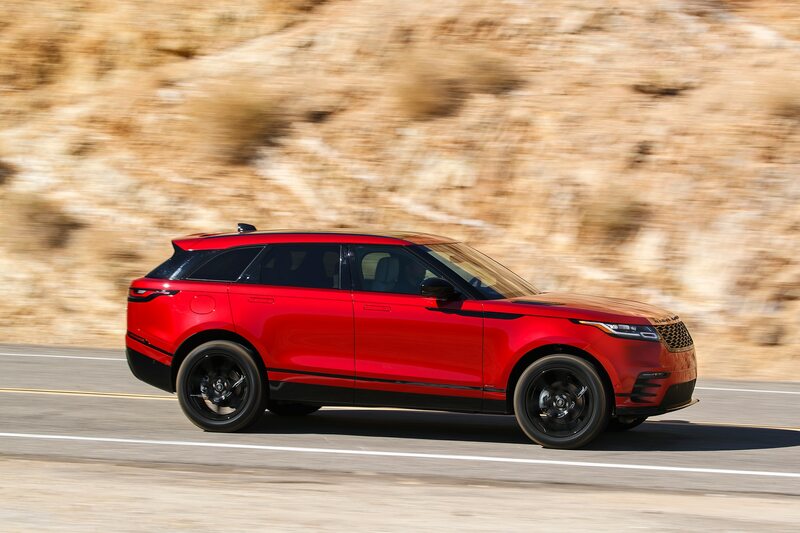 It’s also almost identical in stature to its Jaguar F-Pace cousin, with which it shares more than a handful of components, including details like the platform (down to matching wheelbase lengths) and powertrains. 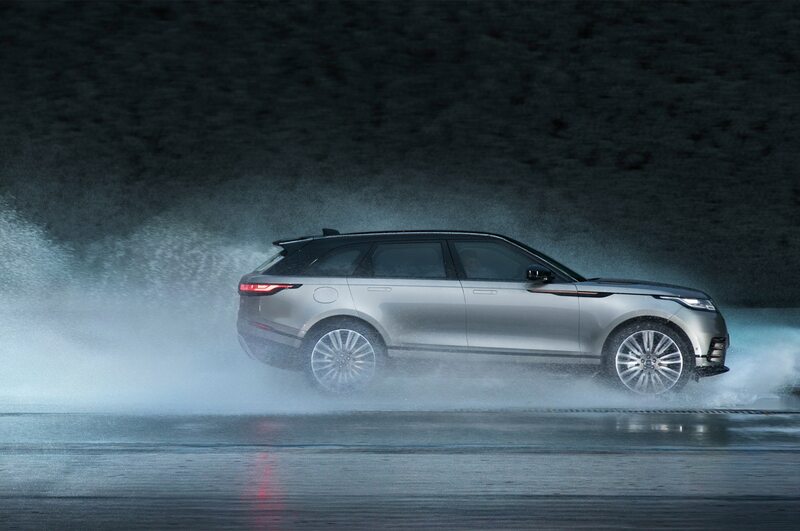 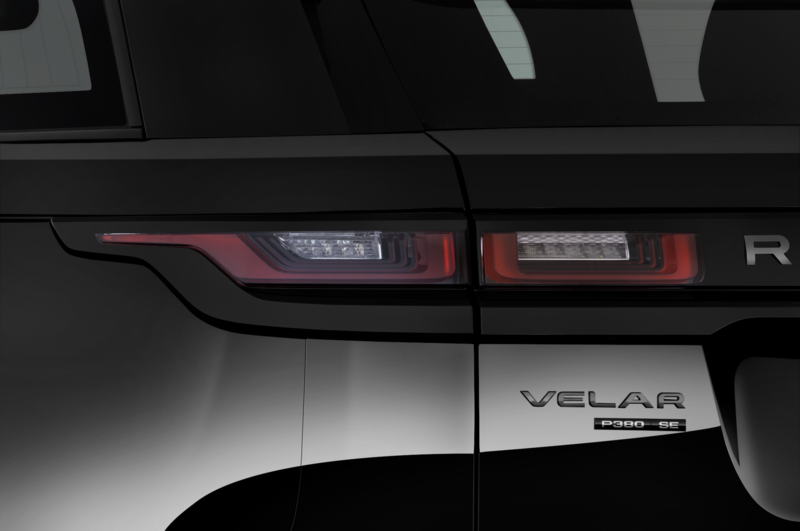 But when given more than just a cursory look, the Velar starts to make a lot of sense. 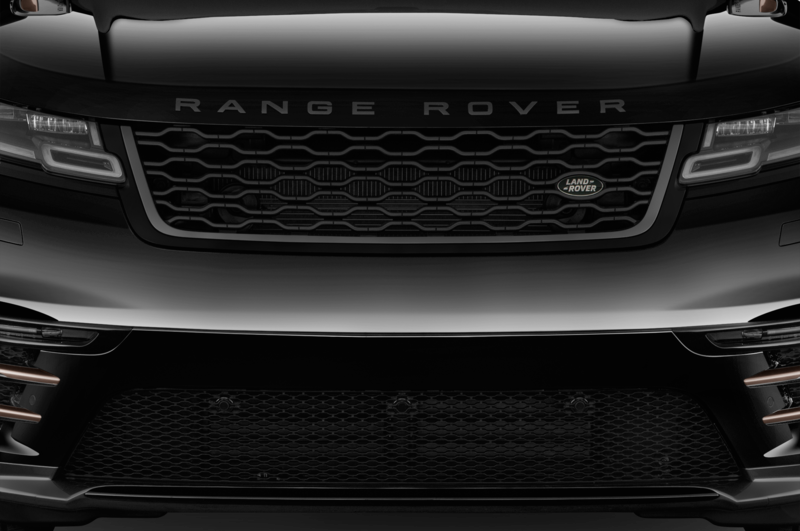 Let’s get the Range Rover Sport out of the way first. 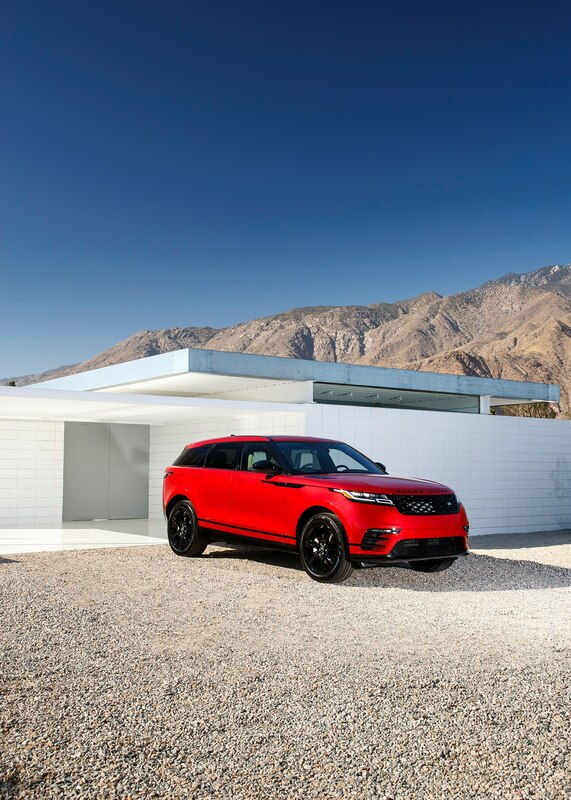 While its footprint and that of the Velar are similar, the Sport is some 1,000 pounds and $16,850 more substantial. 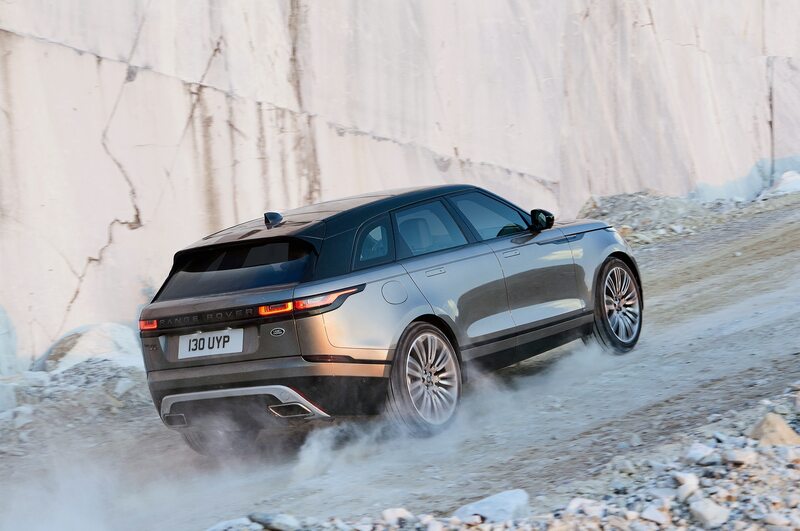 Some would say you get most of a Sport with a Velar, and if you look purely at objective metrics like engine specs and feature lists, it’s hard to argue they’re wrong. 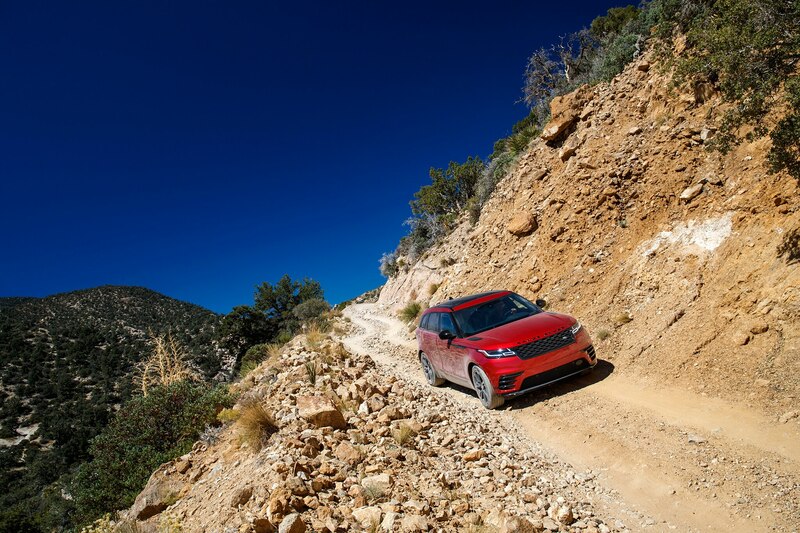 But there’s more to cars than just the objective, and subjectively the Velar is a kinder, gentler soul that’s more likely to get someone to step up from the smaller Evoque than to step down from a Sport. 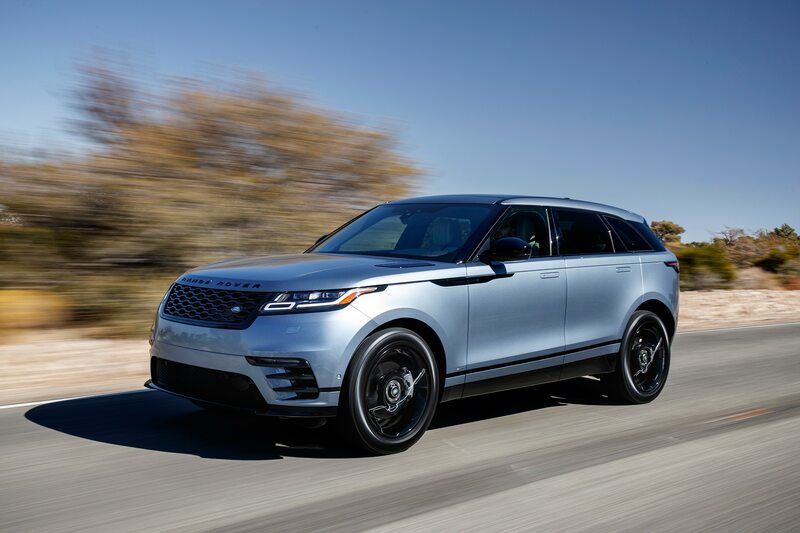 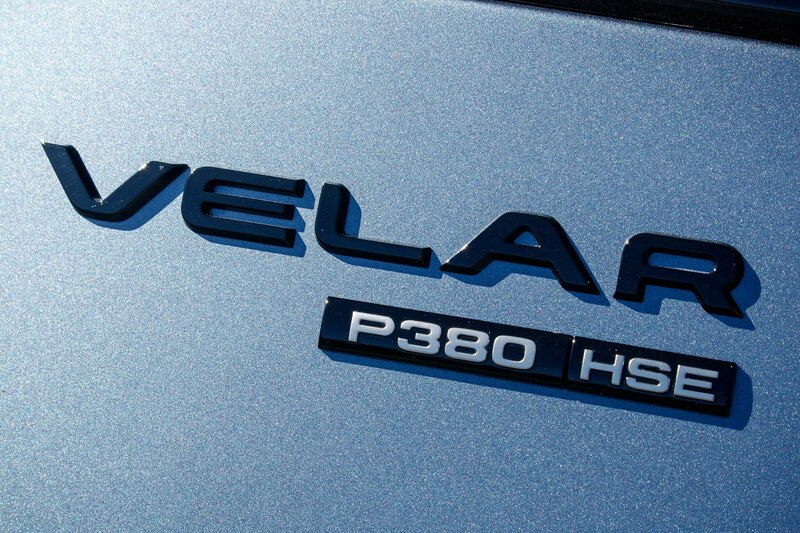 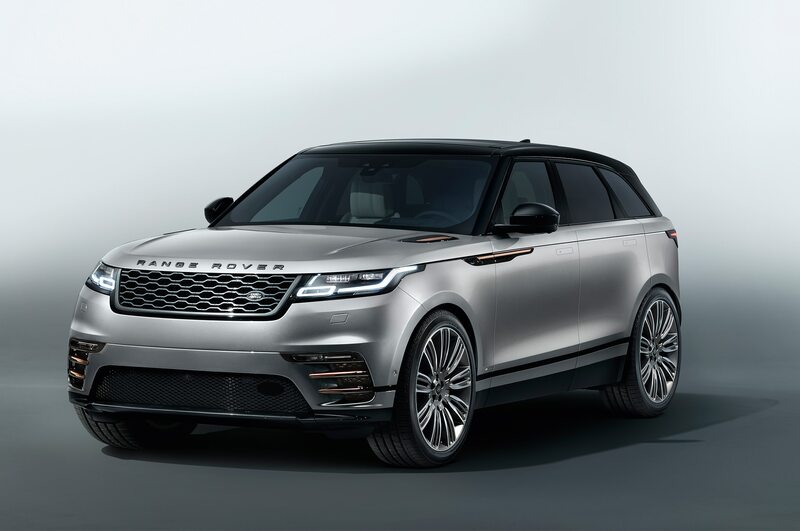 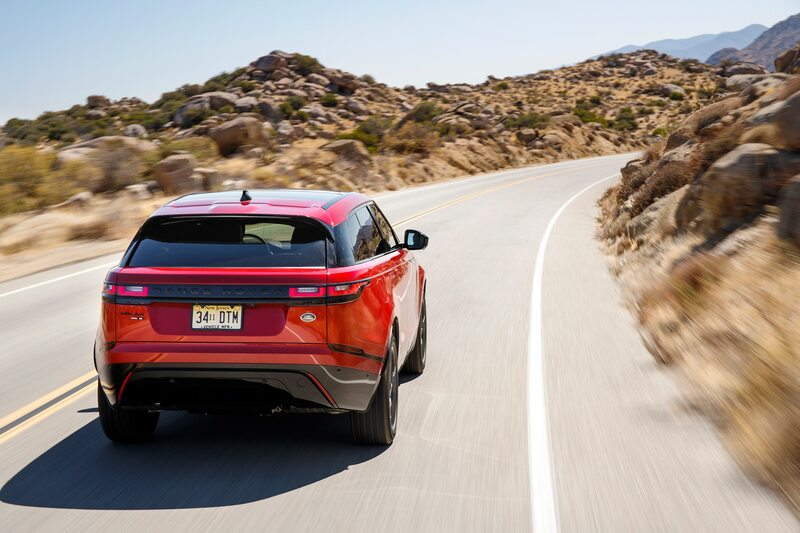 Land Rover itself is confident that cannibalization will be minimal and early returns—the first full month of sales—show that 85% of Velar customers are new to the brand. 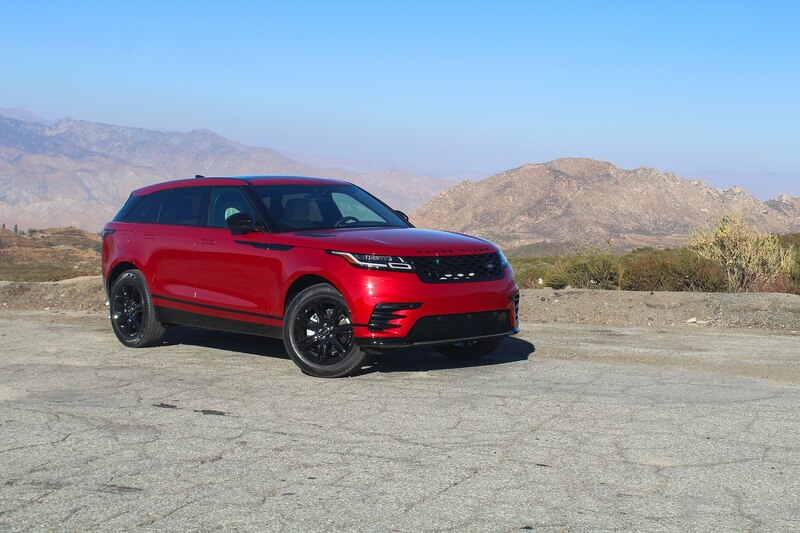 It’s a similar story with regards to the Jaguar F-Pace, which is closer in price to the Evoque than the Velar. 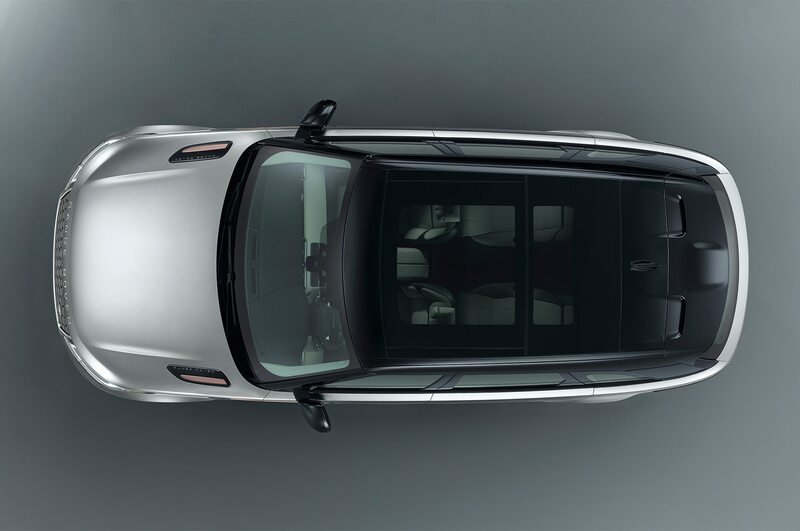 Despite the sharing of platforms, wheelbases, and engines, the Jaguar is slightly lighter—and noticeably more agile, but more on that later. 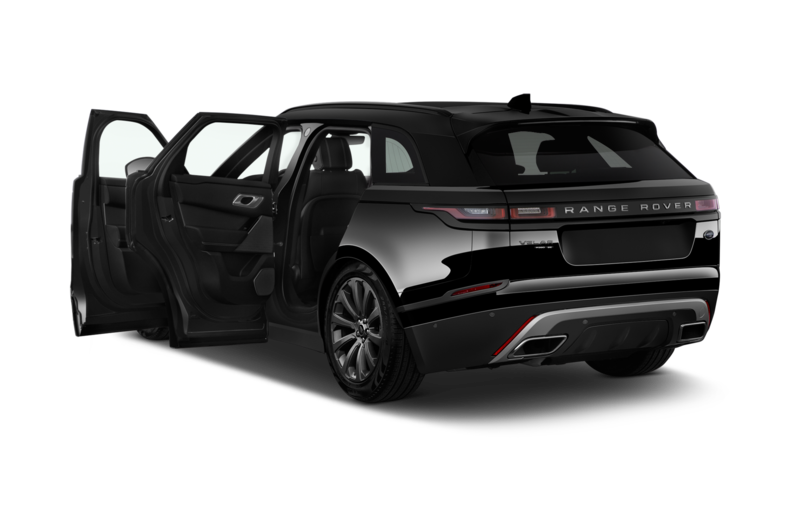 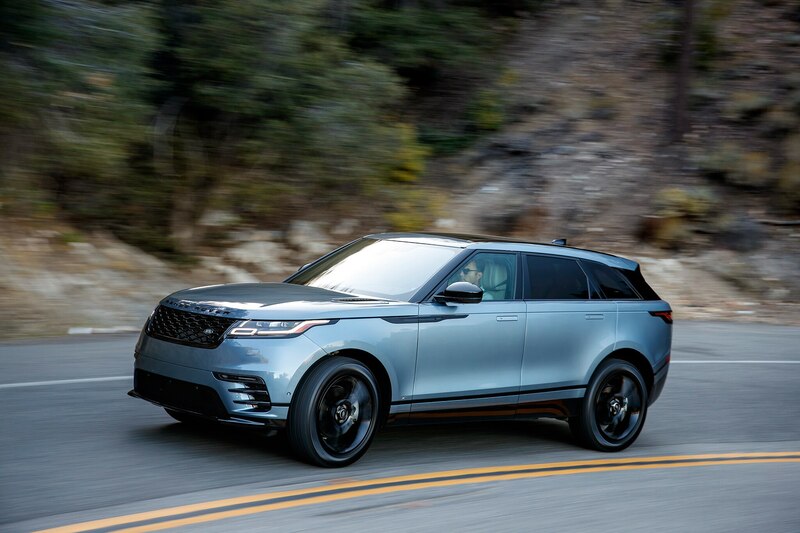 Then there’s the small matter of the drastically different designs inside and out, with the Velar’s leaning toward sophisticated and luxurious while the F-Pace tilts heavily toward the sporty side of things—befitting their respective personas. 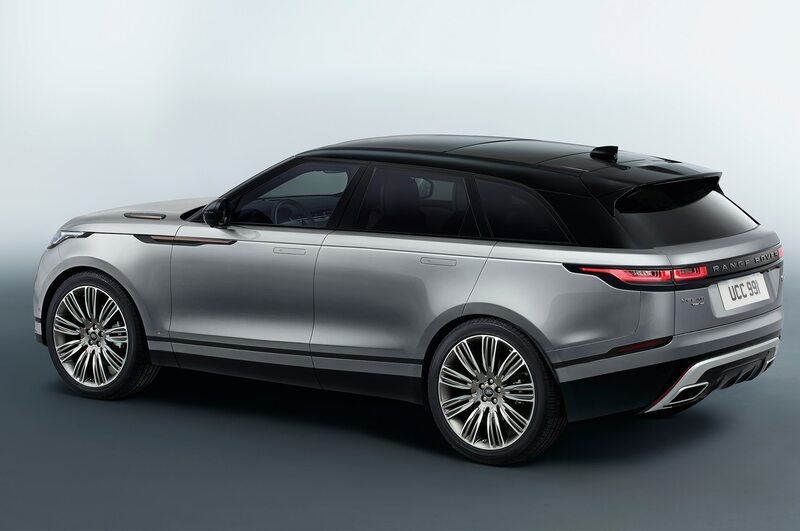 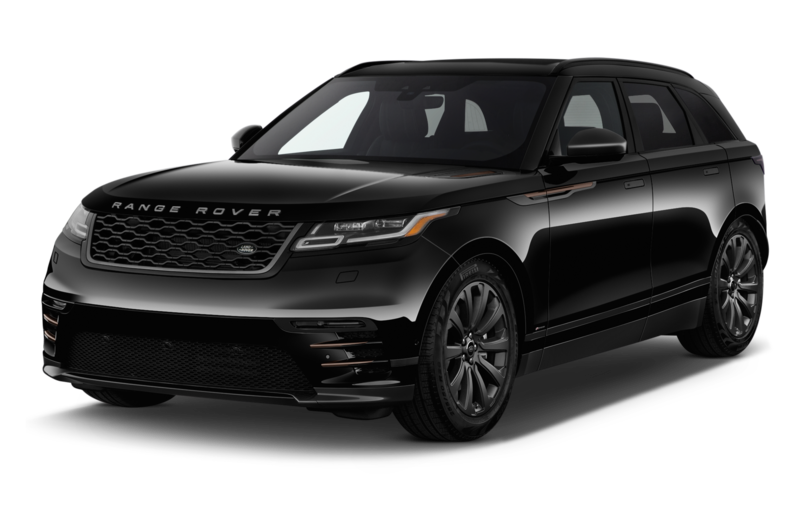 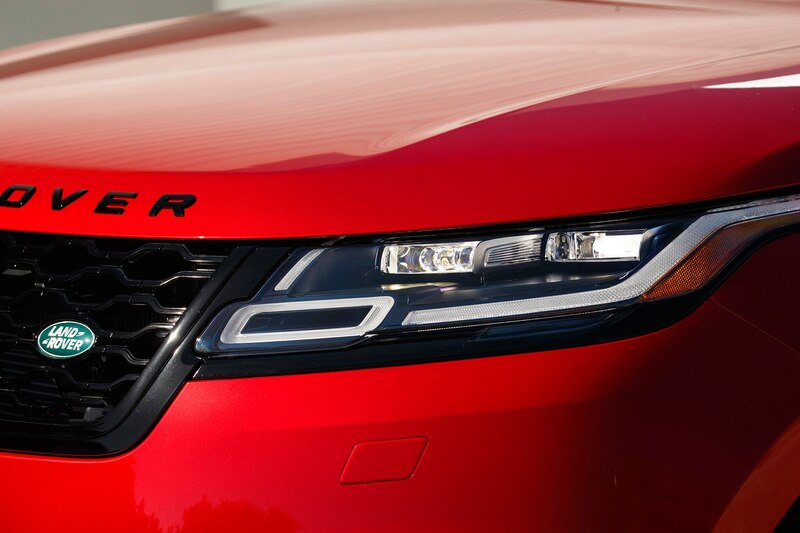 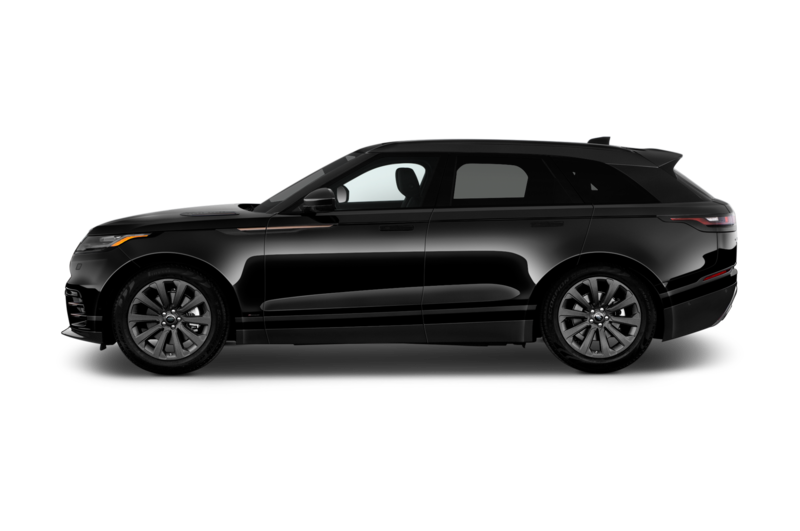 Speaking of design, the Velar’s is the cleanest and prettiest expression of Range Rover’s contemporary design language. 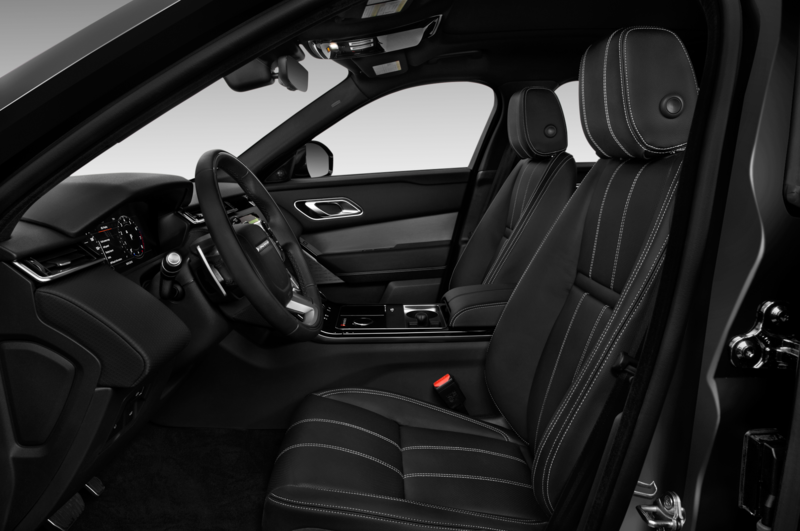 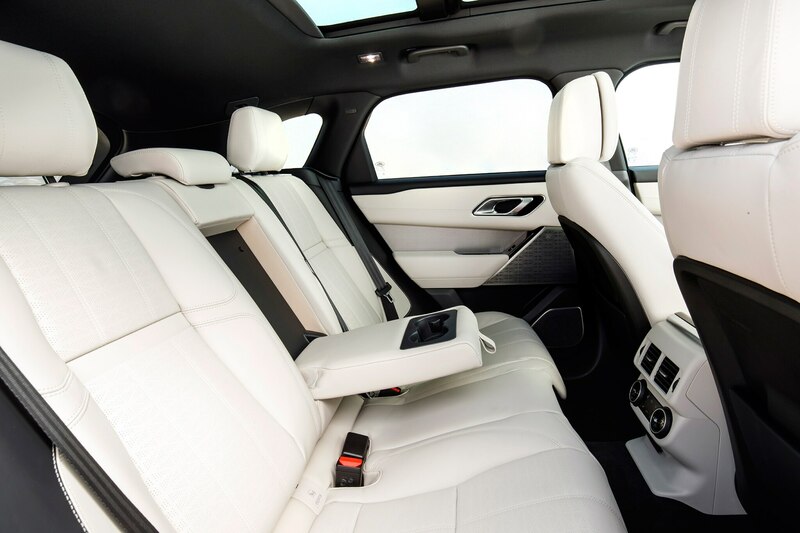 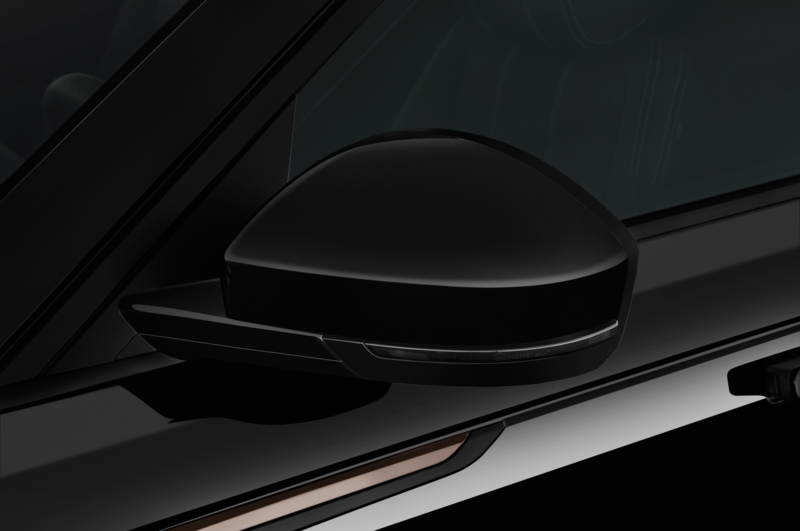 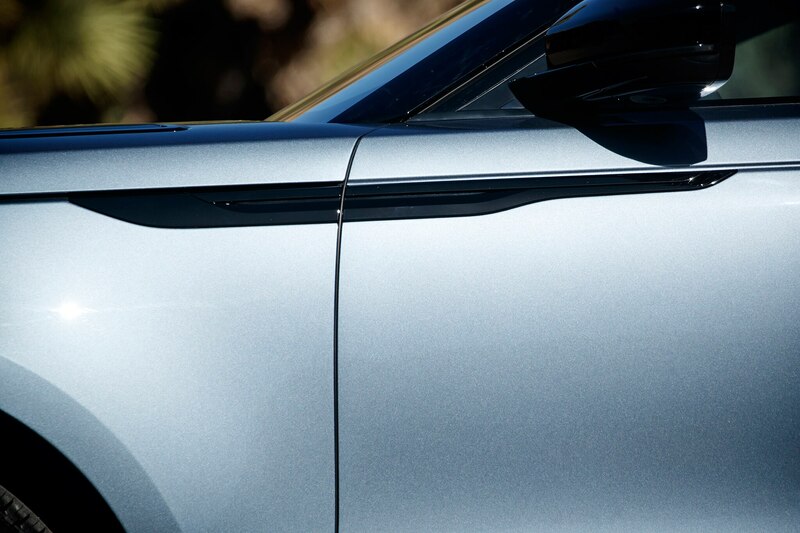 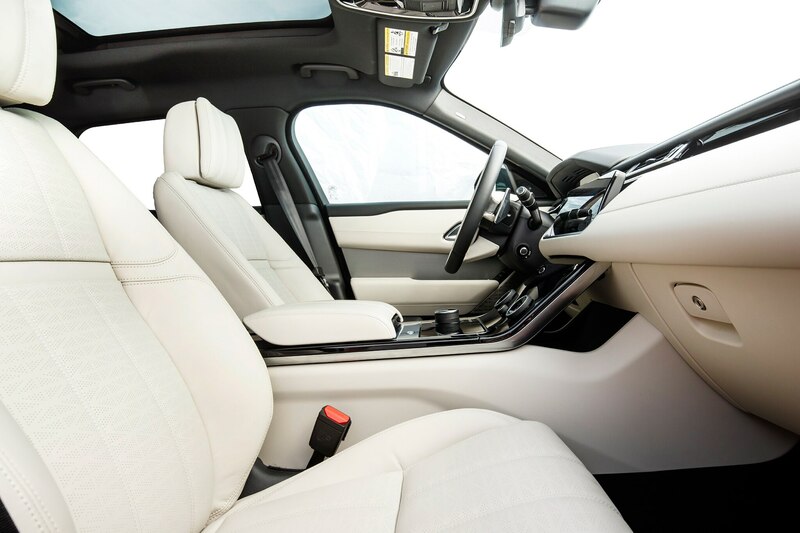 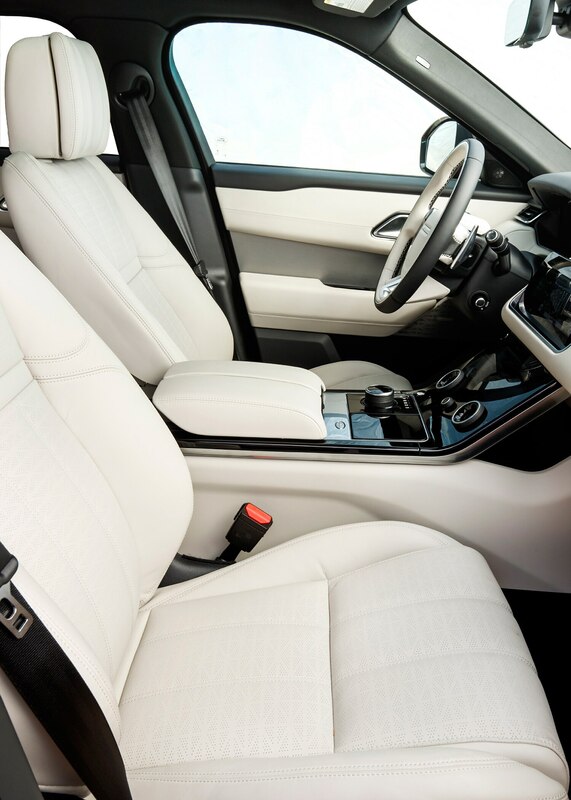 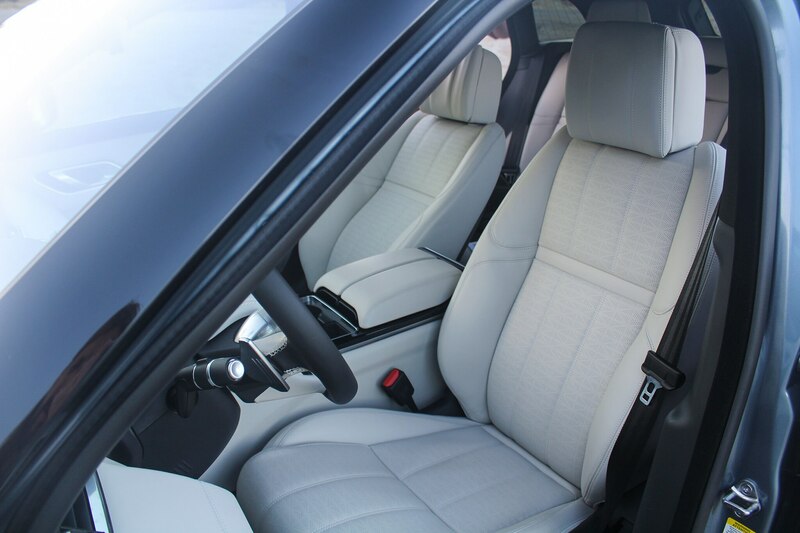 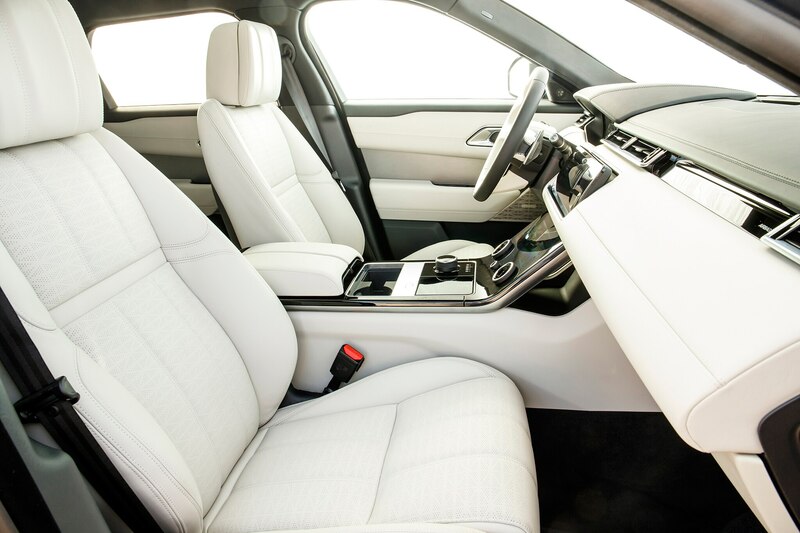 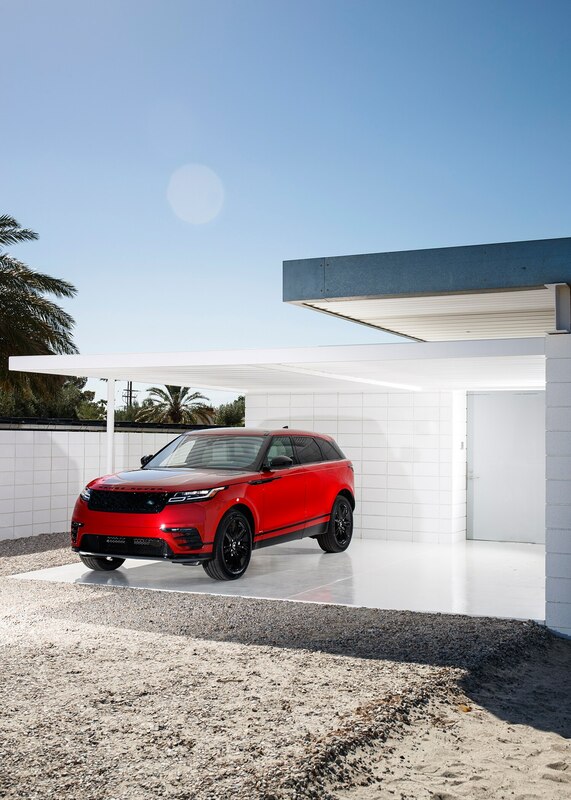 Almost devoid of hard edges, the Velar boasts minimal lines on the side, and the cleanliness is amplified by the trick retracting door handles. 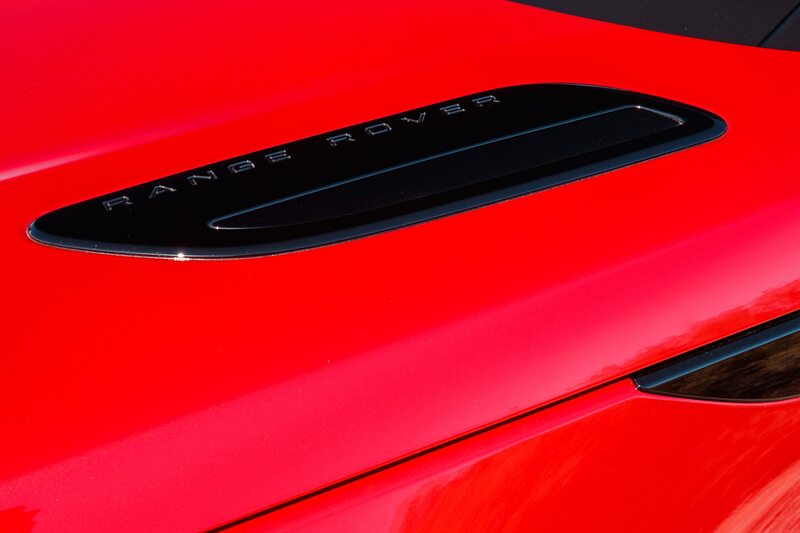 In a way, the sheetmetal is almost too smooth, at least to eyes used to busy fascias and excess creases that do little but create visual noise. 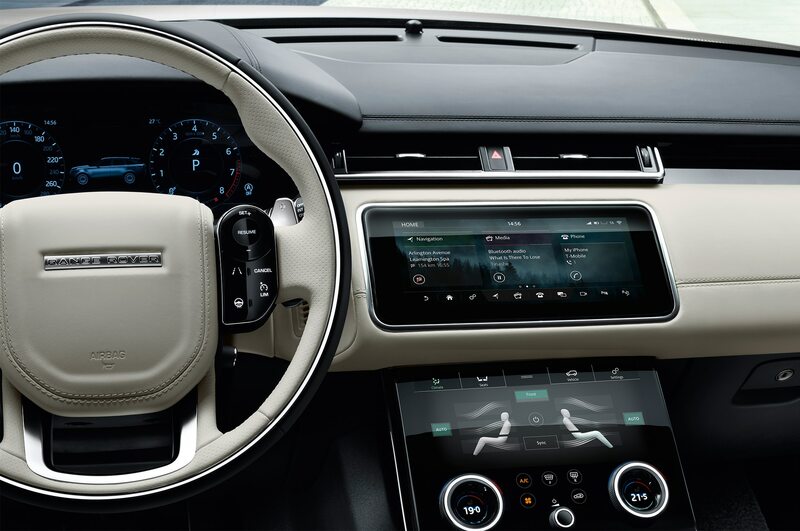 The minimalist saga continues inside the airy cabin, which packs the latest in touchscreen technology. 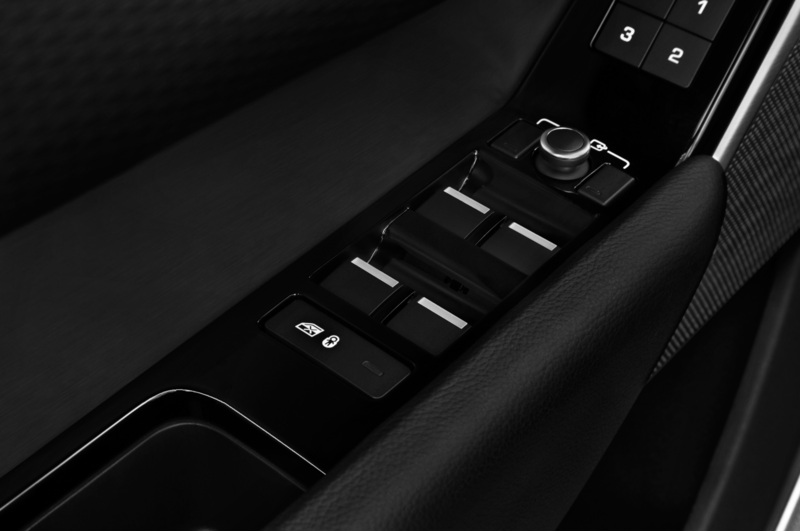 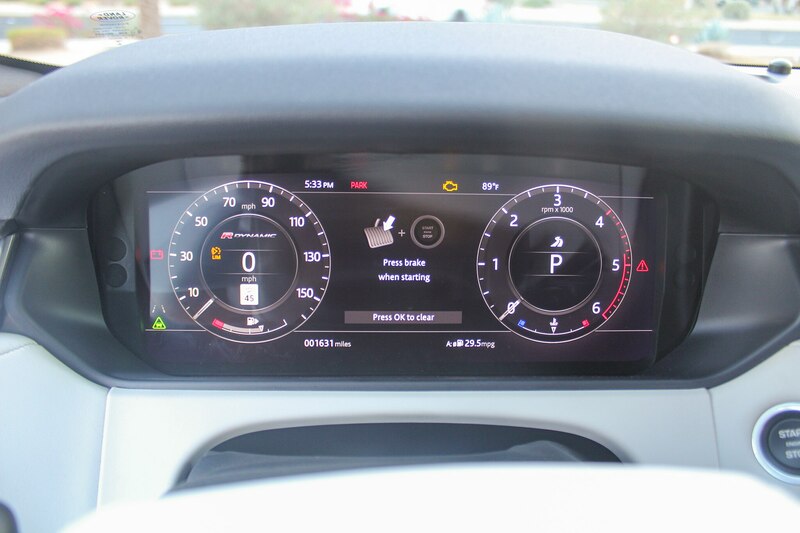 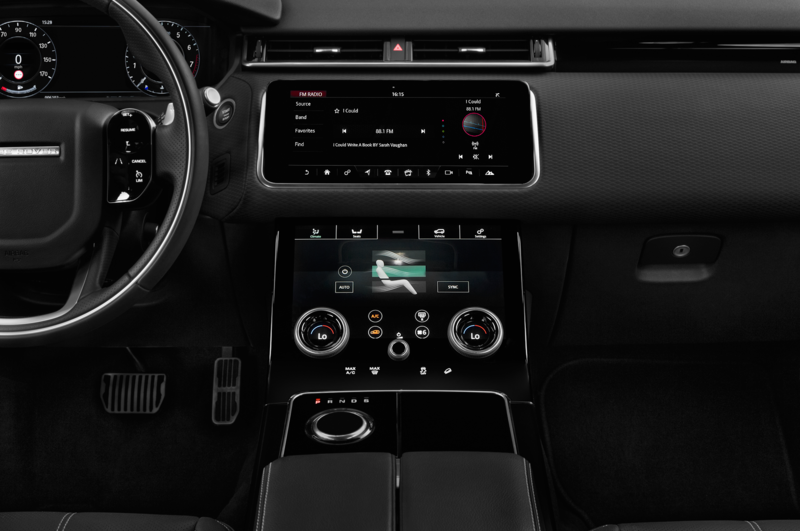 The dash is clean and elegant, and physical controls have been reduced to the bare necessities—a volume knob and a pair of rotary dials that resemble temperature switches, but actually control multiple functions, depending on which screen you select. 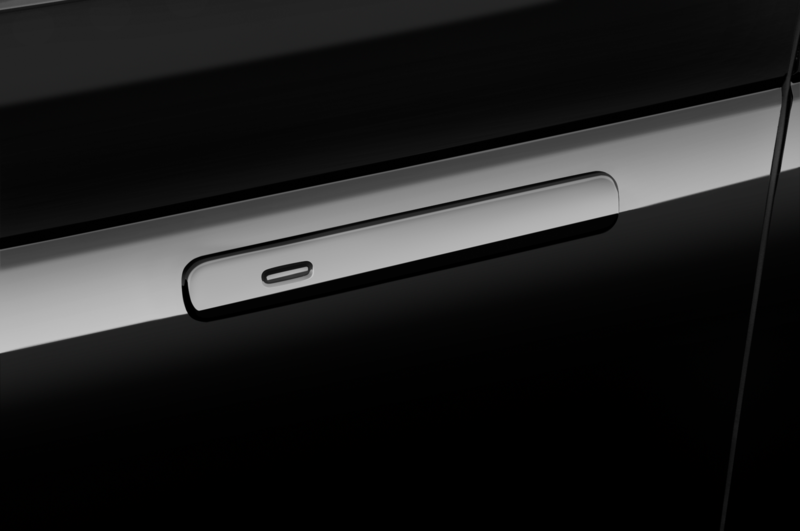 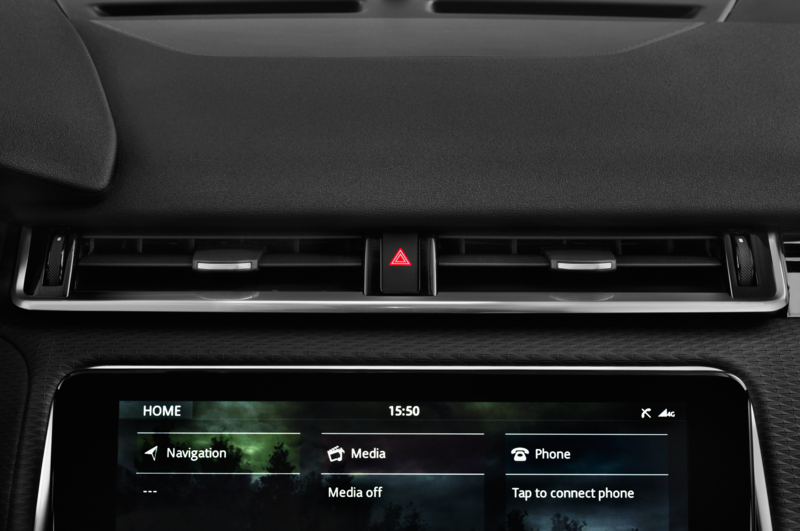 Everything else is a touchpoint that simulates the button experience (think the button on the iPhone7) via force feedback, as are the steering wheel-mounted controls. 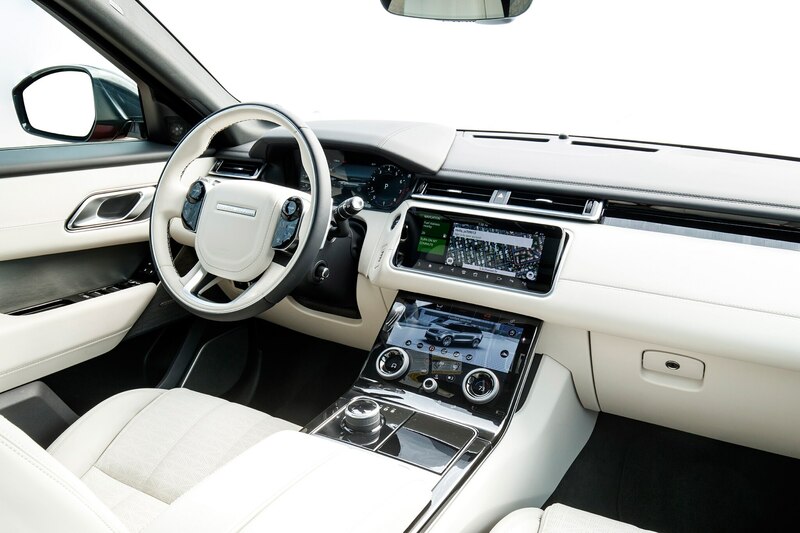 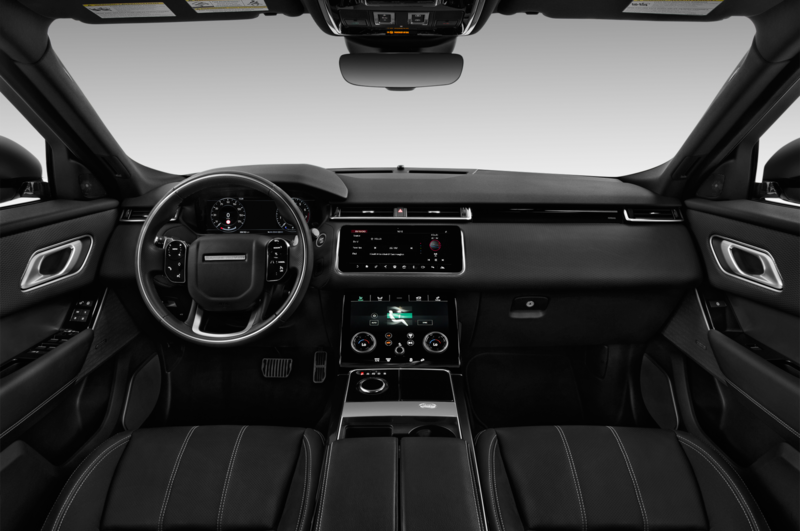 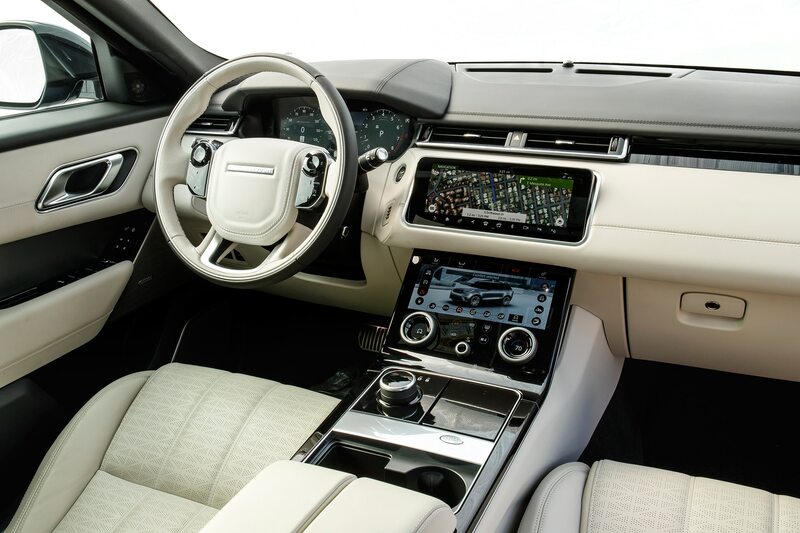 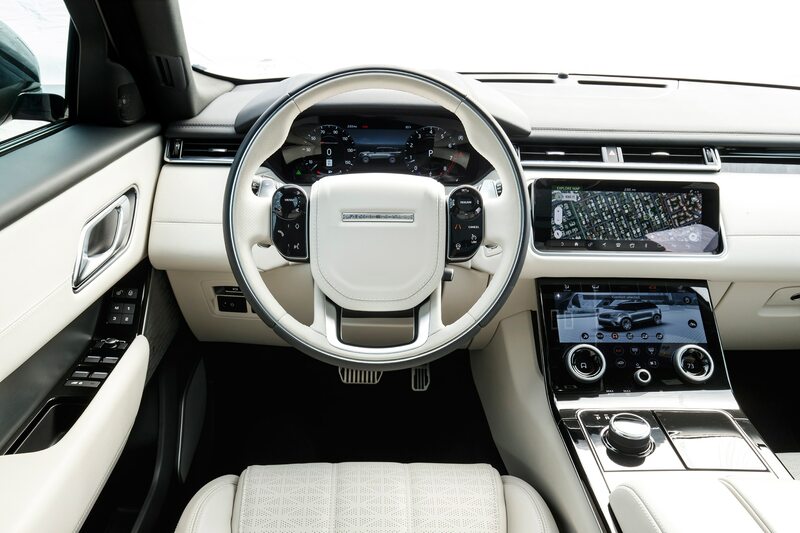 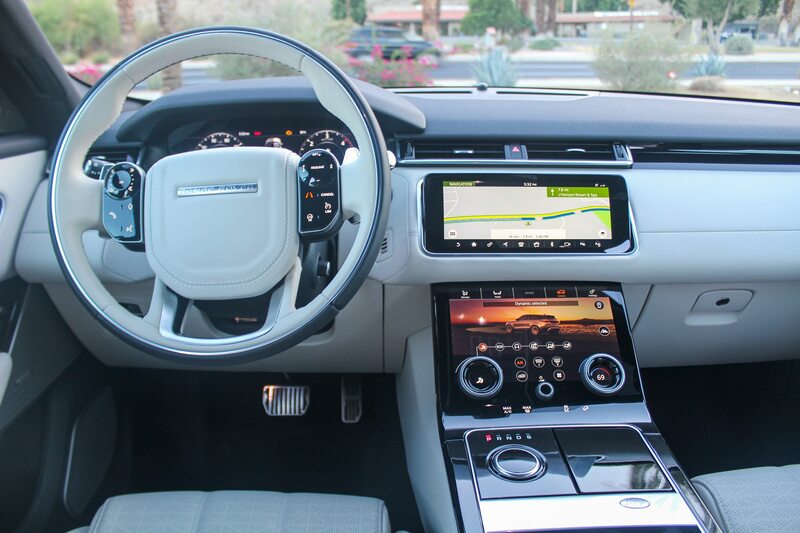 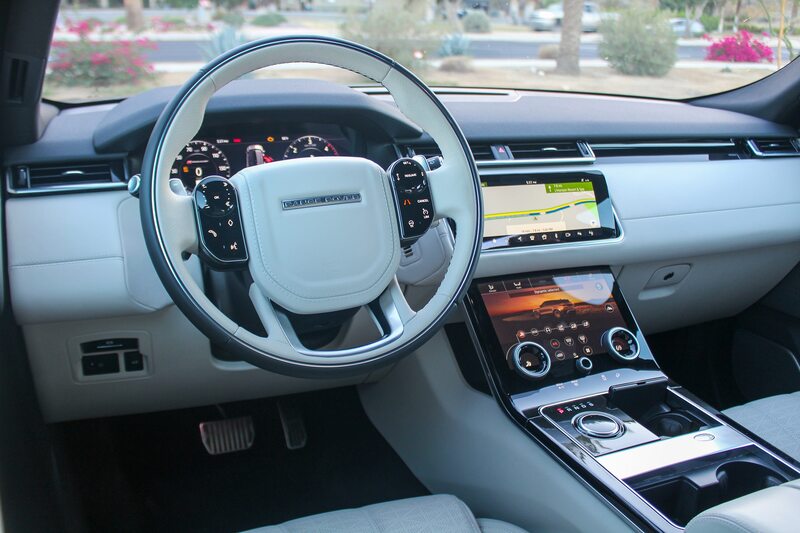 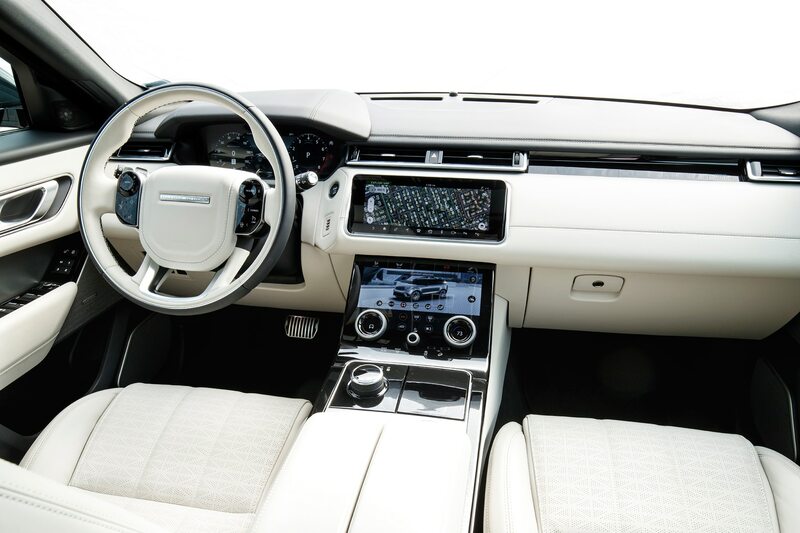 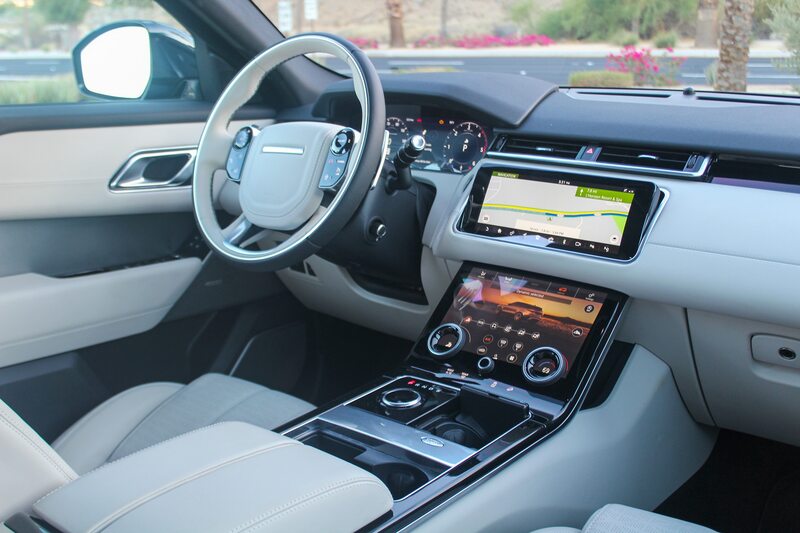 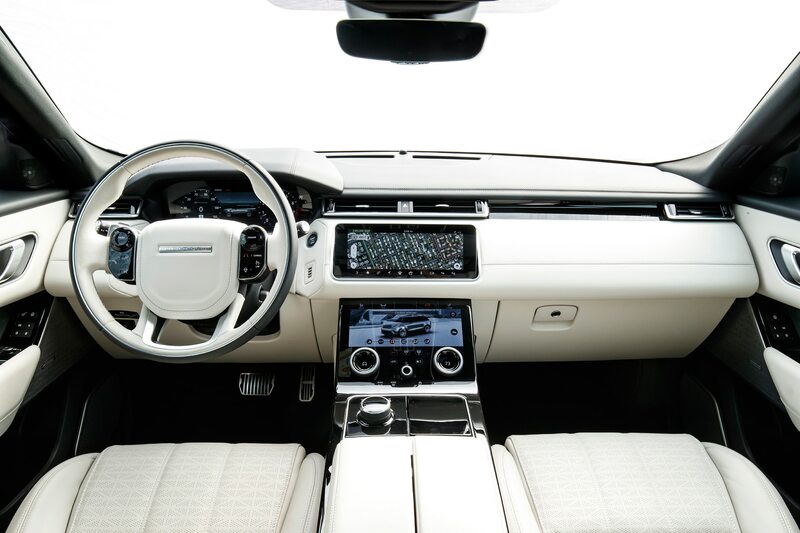 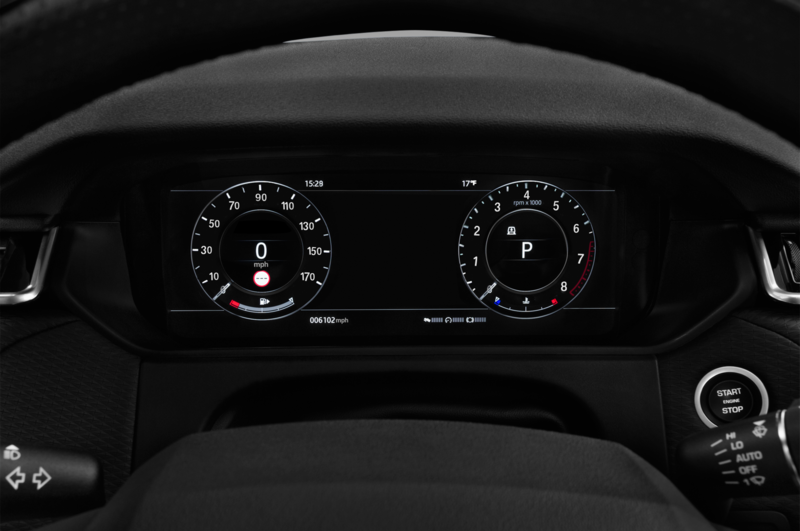 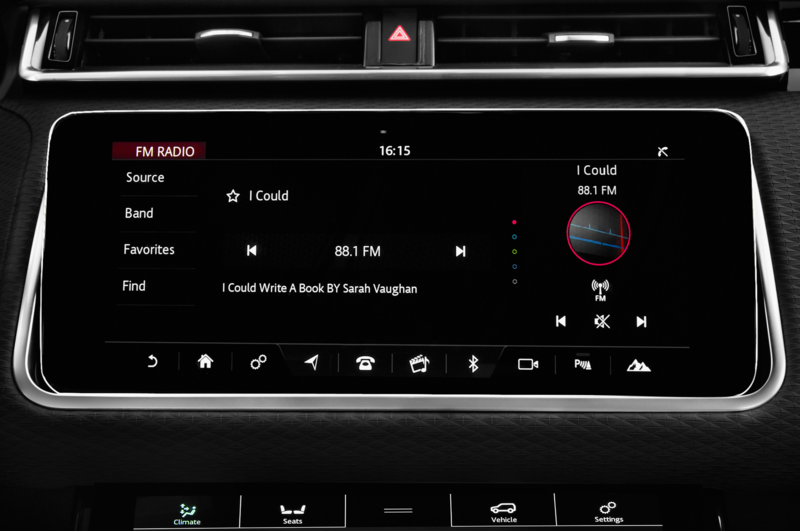 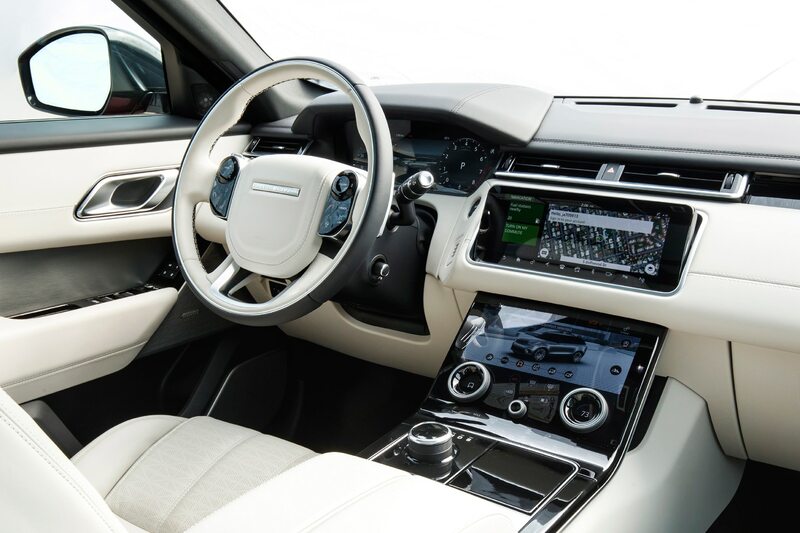 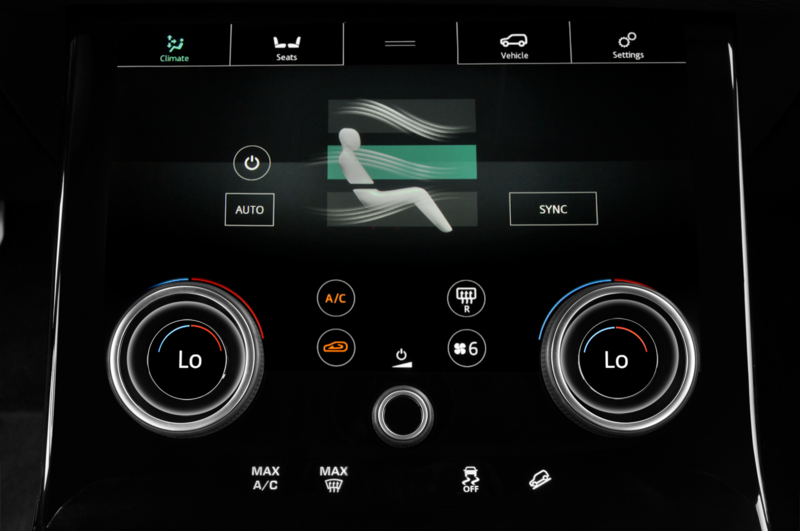 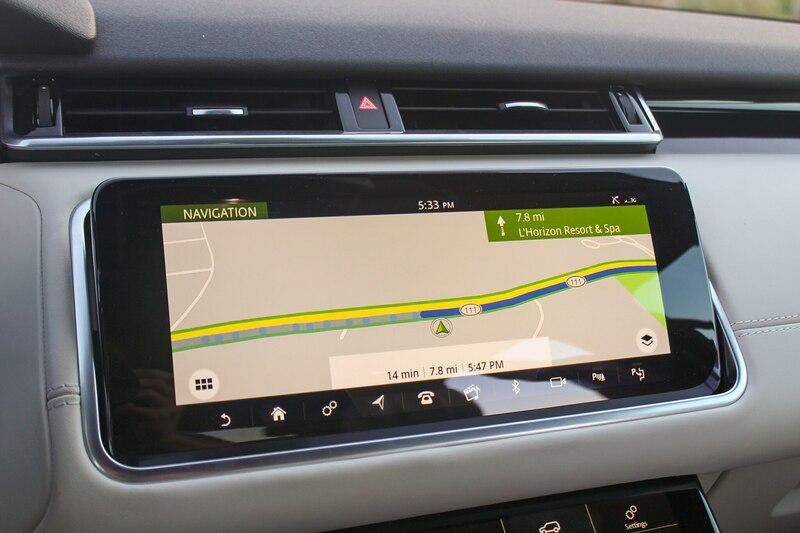 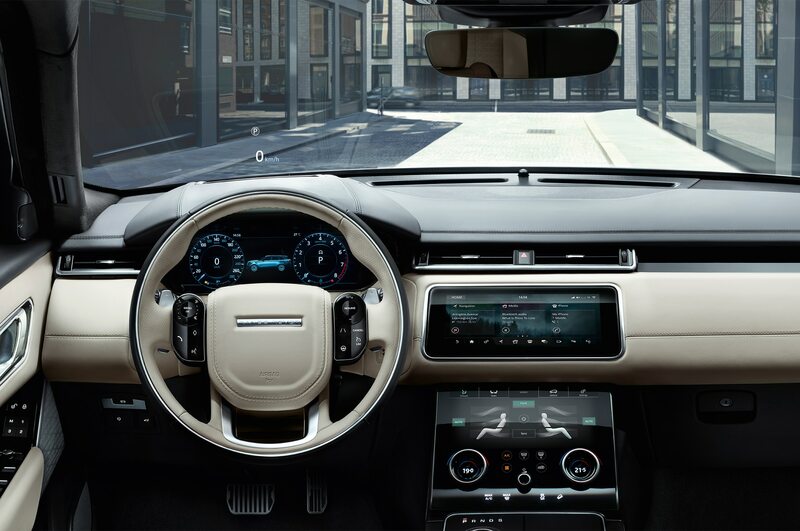 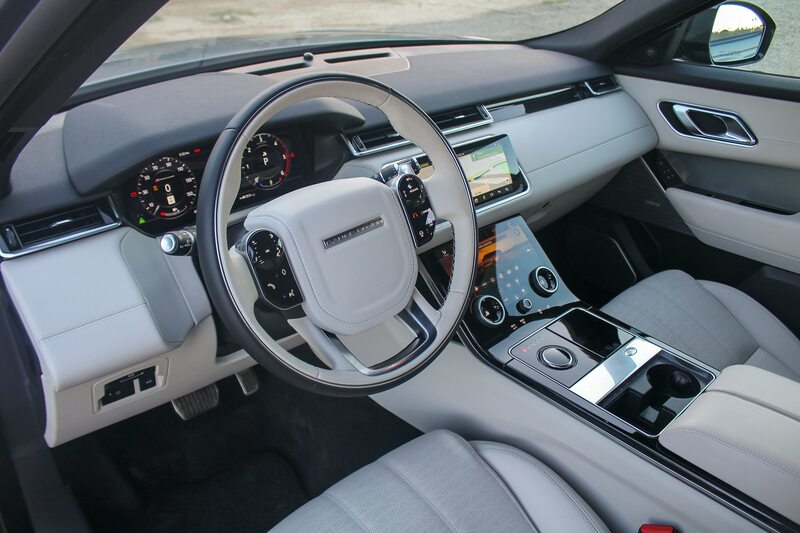 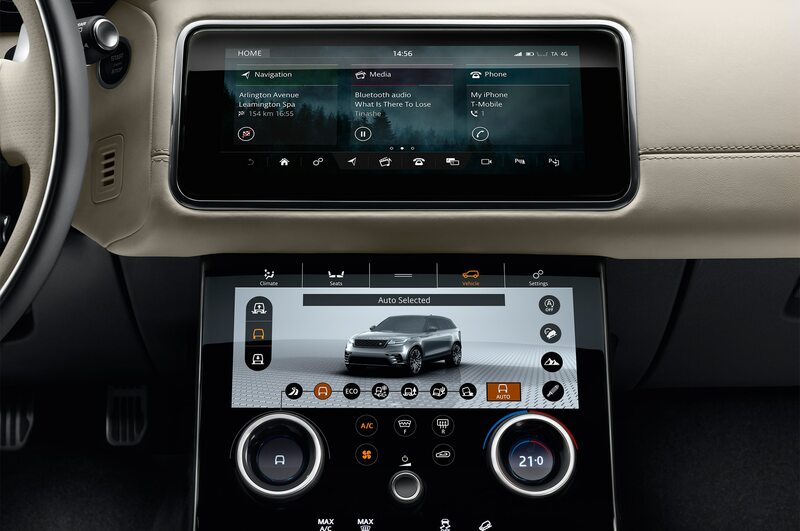 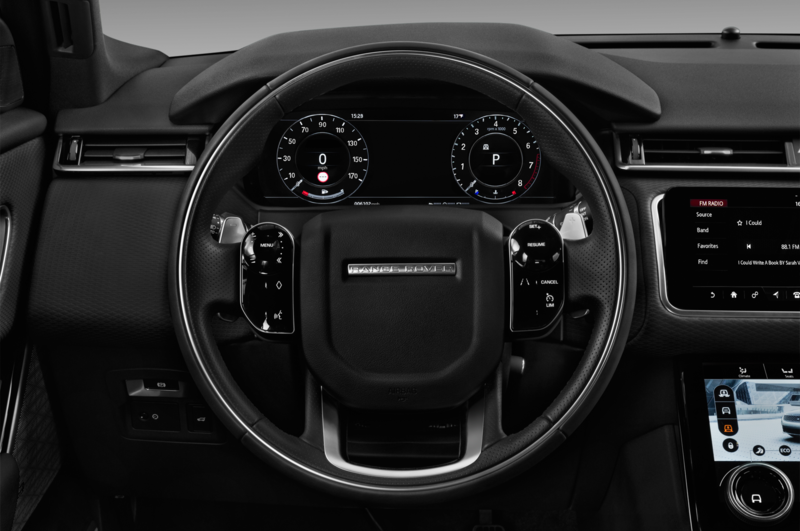 Land Rover’s interface designers made the most out of the new Touch Pro Duo system’s twin 10-inch screens, intelligently separating navigation and entertainment functions (top screen) from climate control and vehicle settings (bottom screen). 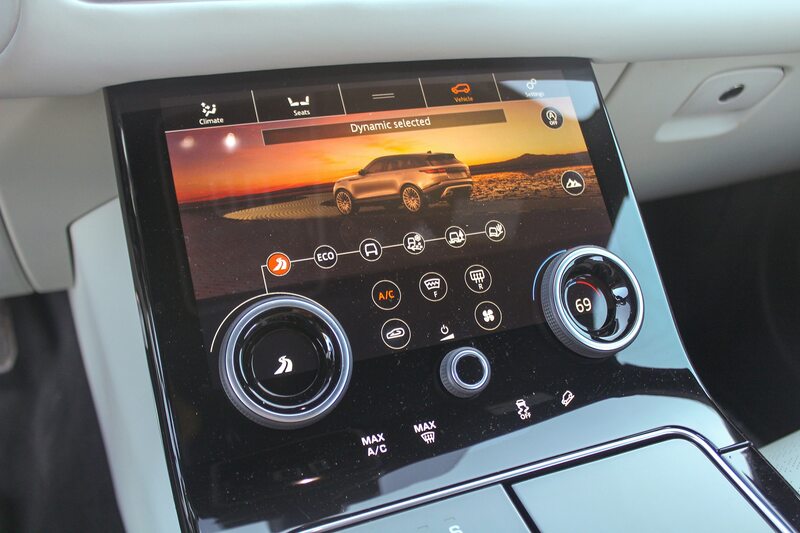 It’s quick and responsive—better than the setup in our Four Seasons Jaguar F-Pace—and the only gripe possible is the lack of Apple CarPlay and Android Auto. 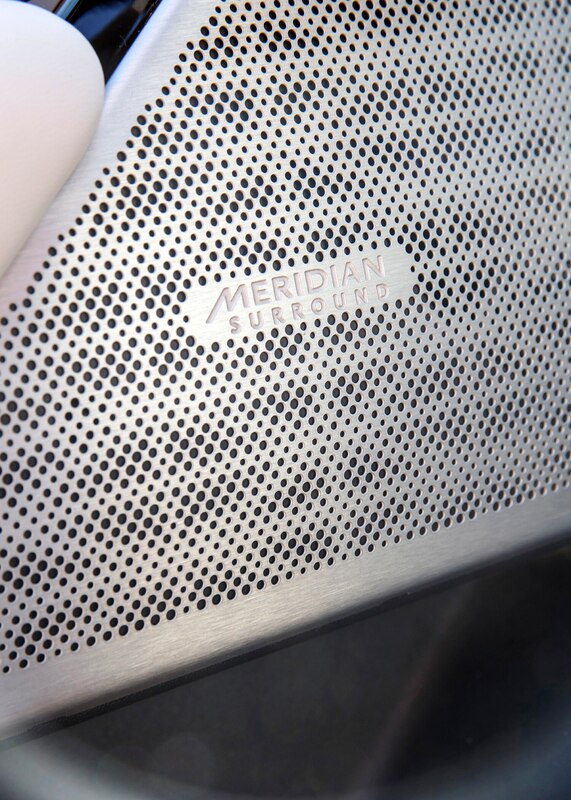 Be sure to spring for the 1600-watt, 23-speaker Meridian sound system, which will massage your ears as pleasantly as the seat’s massager will work your back—or execute a violent and brutal aural assault on your neighbors, if that’s more your thing. 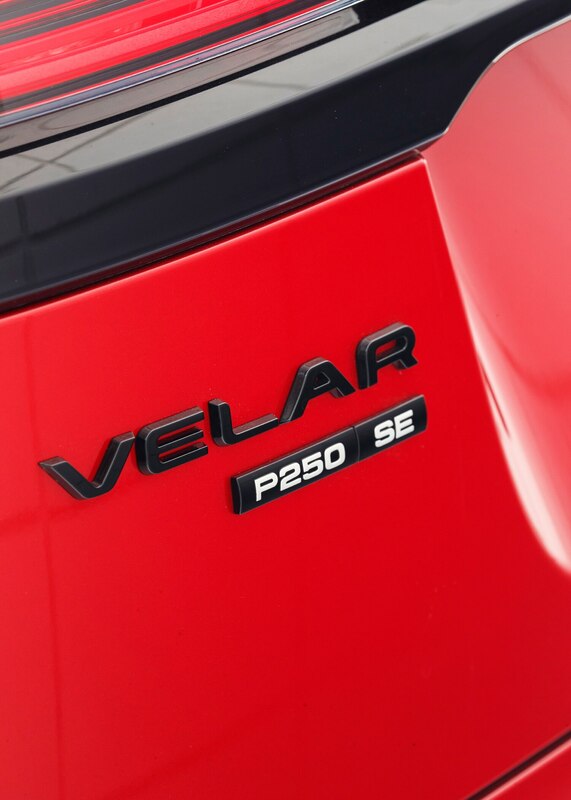 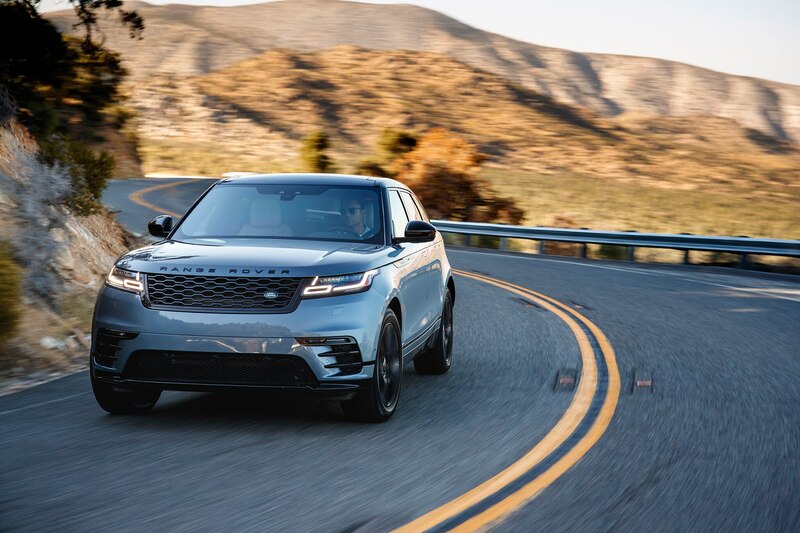 When it comes to the mechanical soundtrack, Velar buyers have three choices, two gasoline and one diesel. 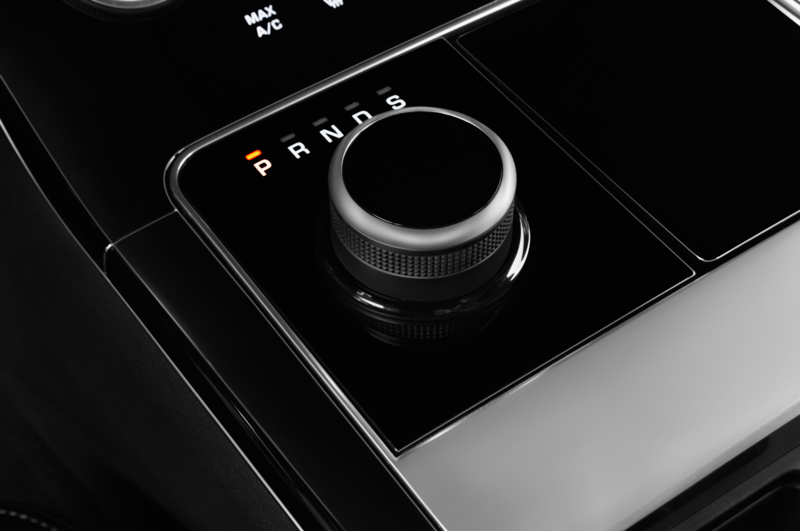 All are mated to a ZF-source eight-speed automatic, which does an excellent job of managing ratios regardless of which powerplant drives it. 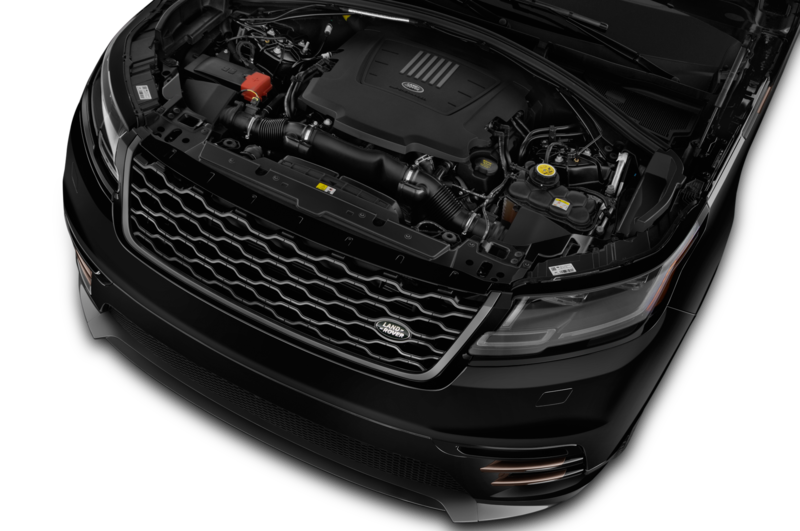 Option two is the diesel-powered version of that 2.0-liter turbo-four, which makes 180 hp and 317 lb-ft of torque. 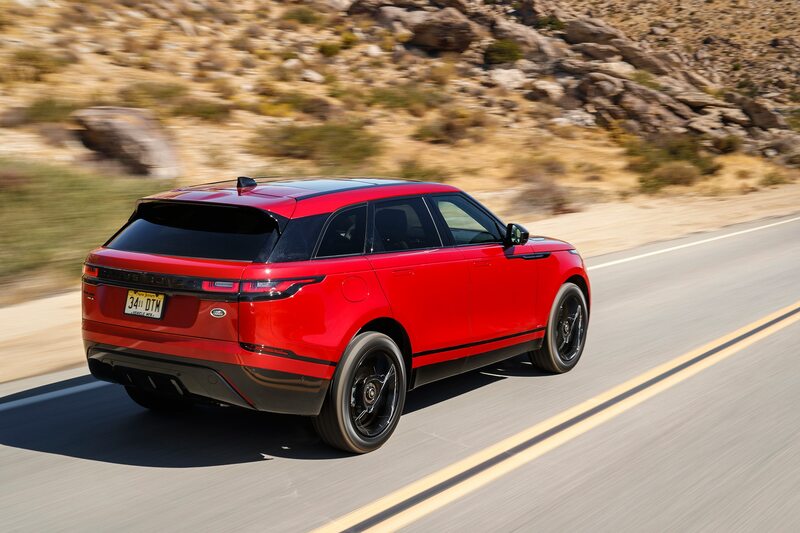 It would be a stretch to call it quick, or even spry, as hitting 60 mph takes 8.4 seconds, but it does get 26 mpg city and 30 mpg highway, per the EPA. 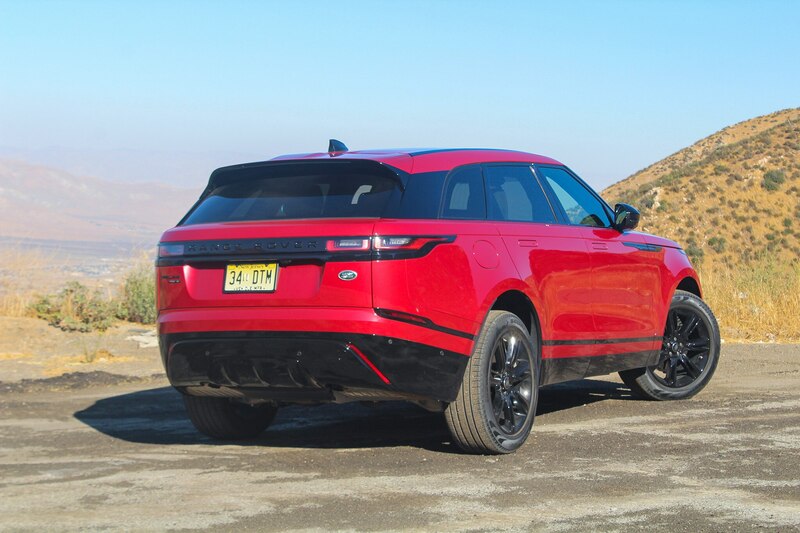 And its quite quiet to the point that it doesn’t really sound like a diesel at all, so don’t expect to pick one out of a lineup just by listening for the clatter. 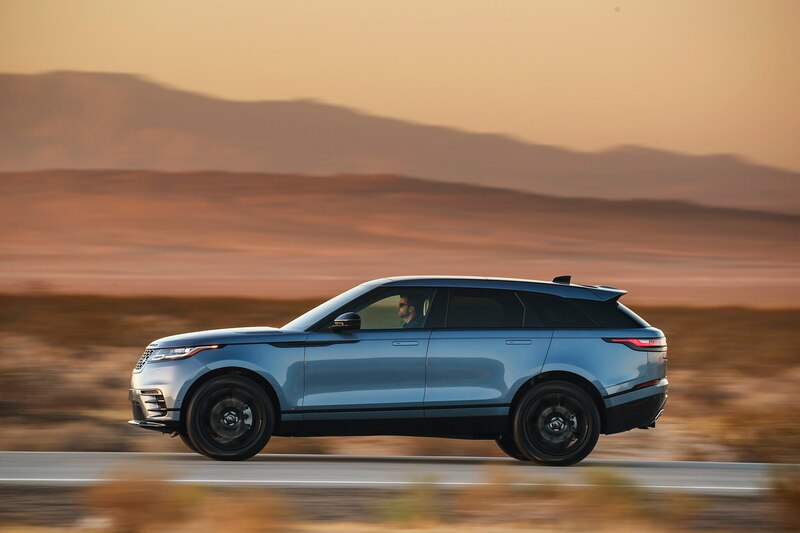 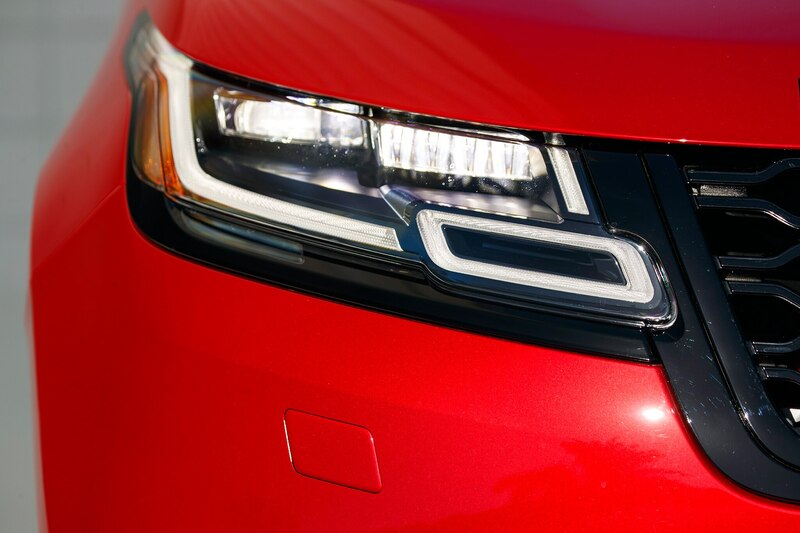 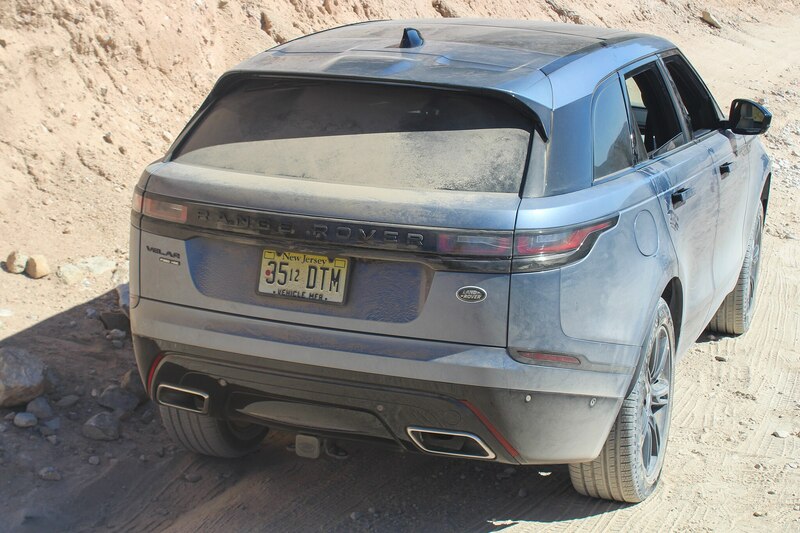 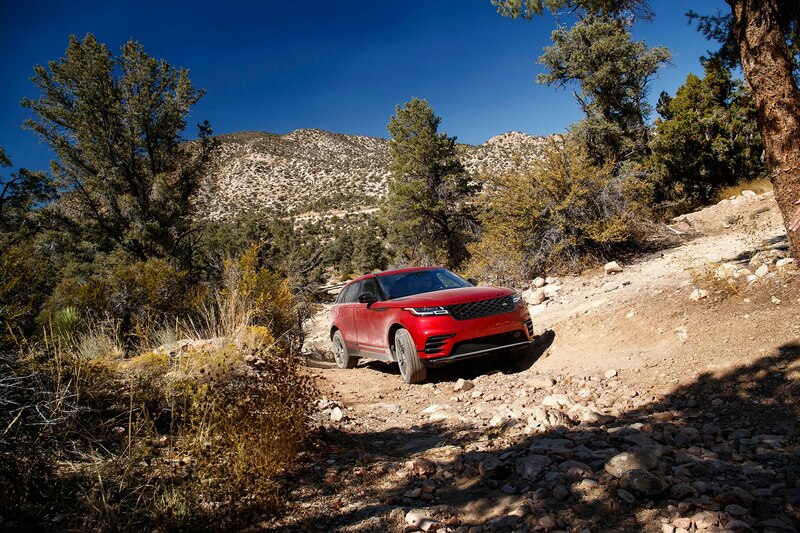 Most of our time, including the off-road portion, was spent in a Velar powered by the third engine offering, the stalwart 3.0-liter supercharged V-6. 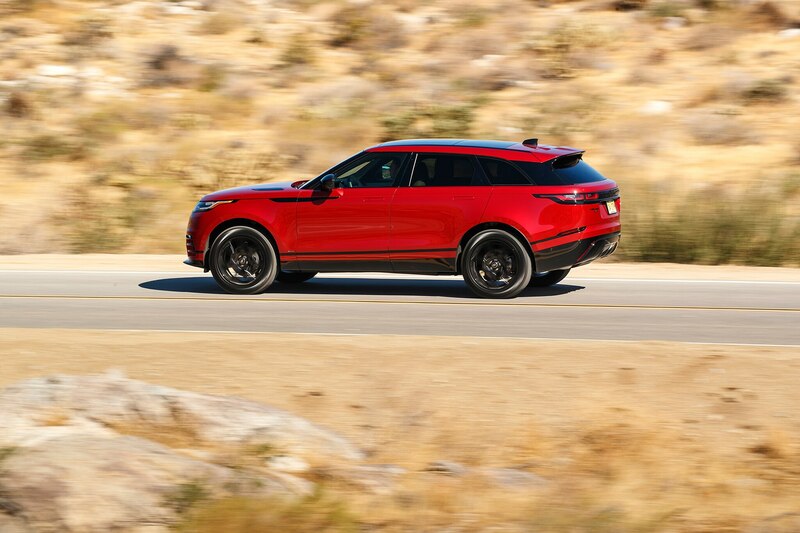 It combines 380-hp with 332 lb-ft, propelling the 4,471-pound SUV—the V-6 is the heaviest of the three variants, outweighing the gasoline four by 254 pounds and the diesel four by 112—to 60 mph in 5.3 seconds, about on par with the Mercedes-AMG G65, to pick one random example. 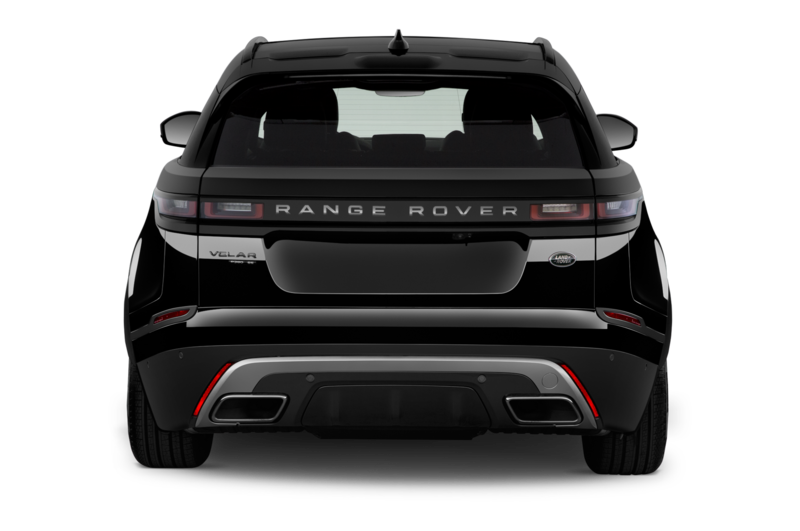 The six can also tow a bit more, being rated to pull 5,512 pounds, while the fours are rated to pull 5,291 pounds. 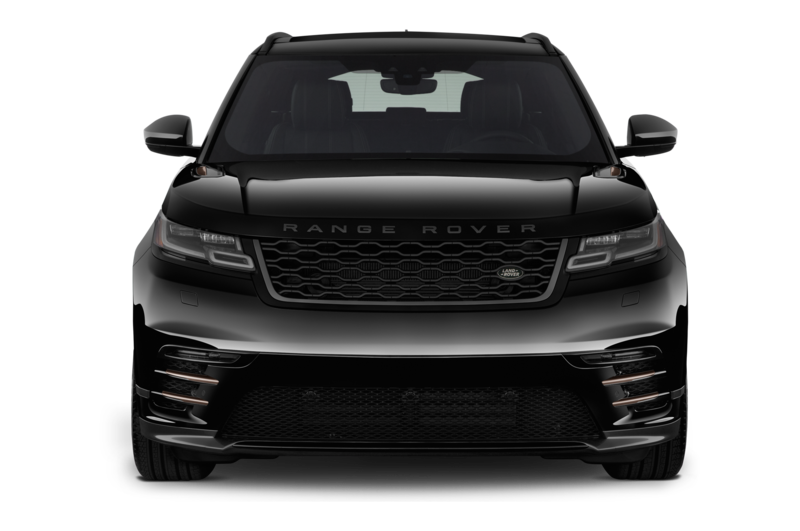 Its droning soundtrack isn’t for everyone, however, and unless you really want the extra zip or plan on getting your Range Rover dirty and possibly beat up, you’ll be well-served by one of the two four-cylinder engines. 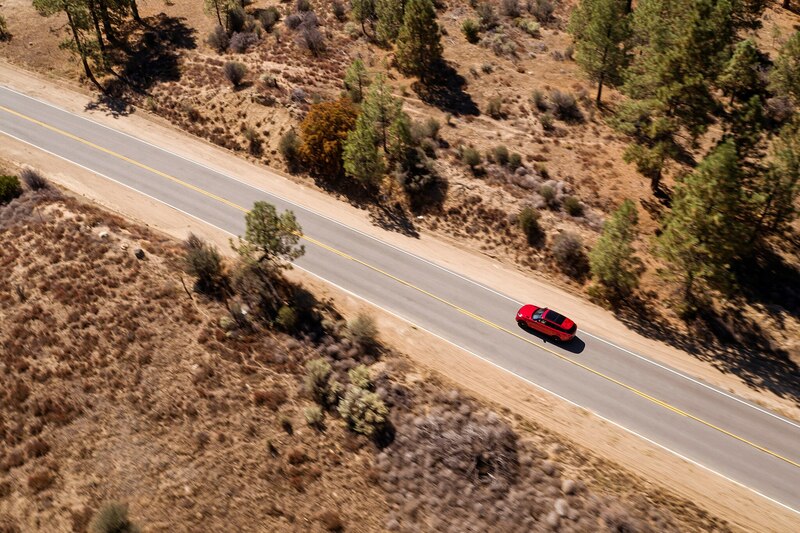 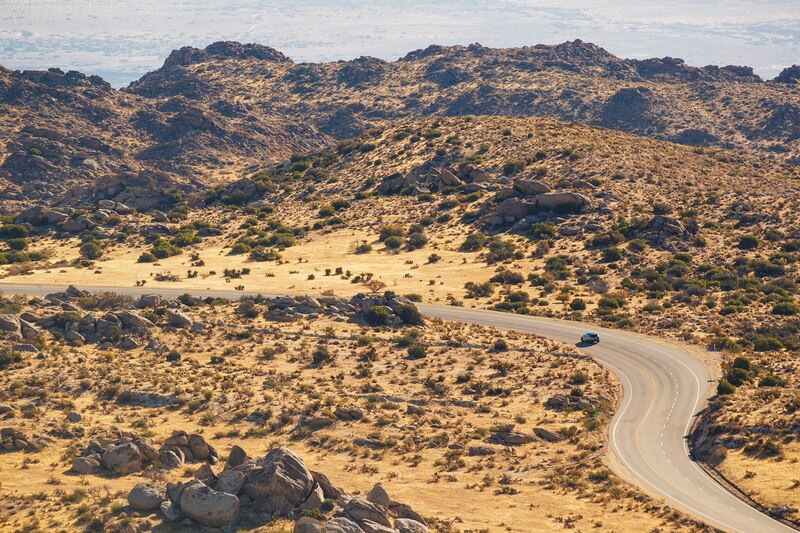 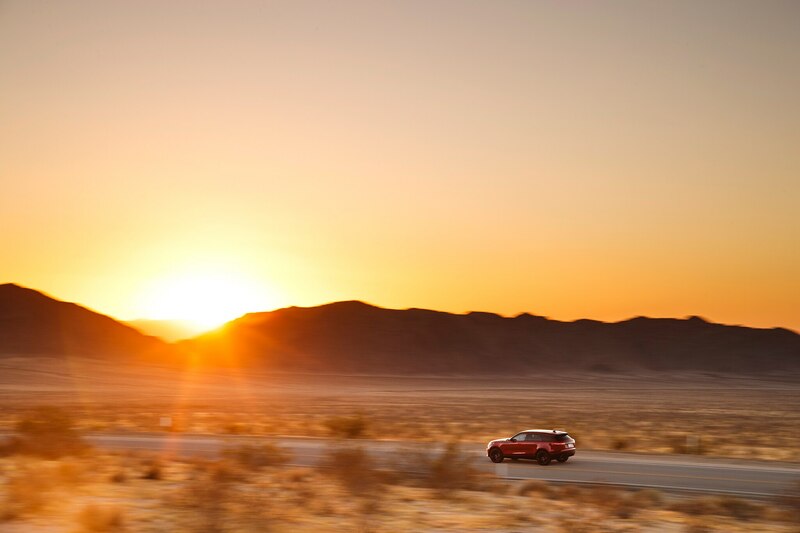 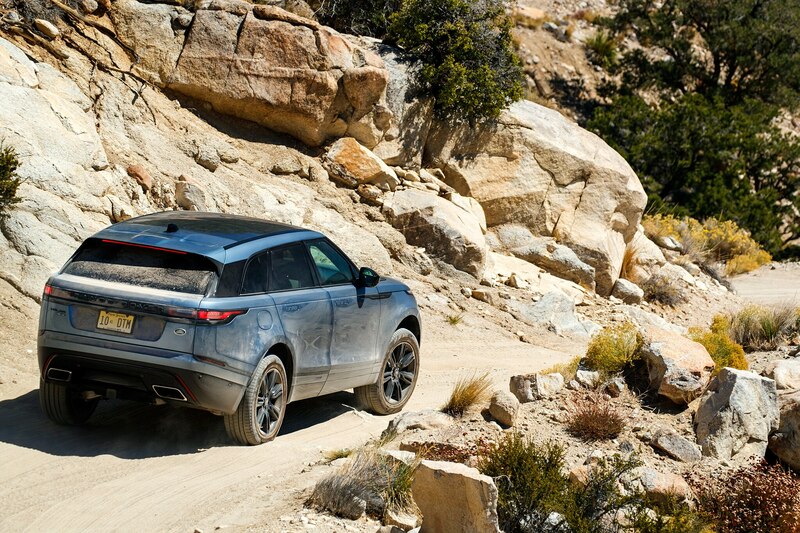 There are several elements that make the V-6 the engine of choice for would-be off-roaders. 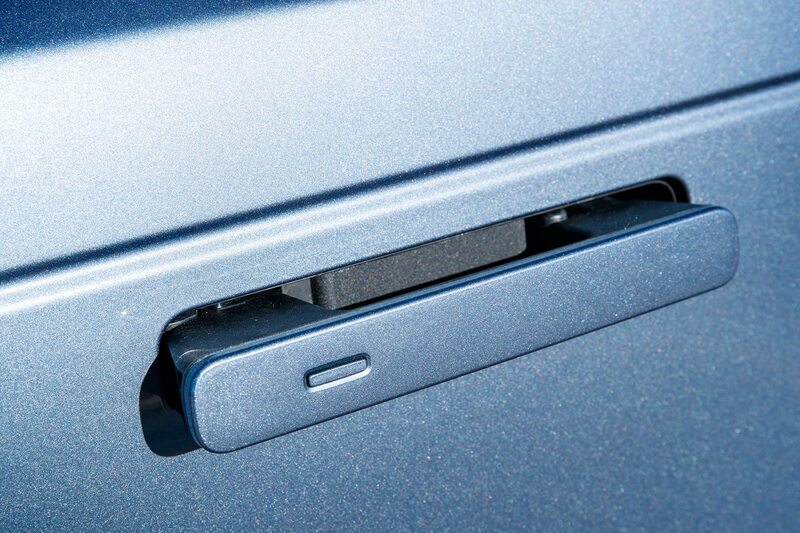 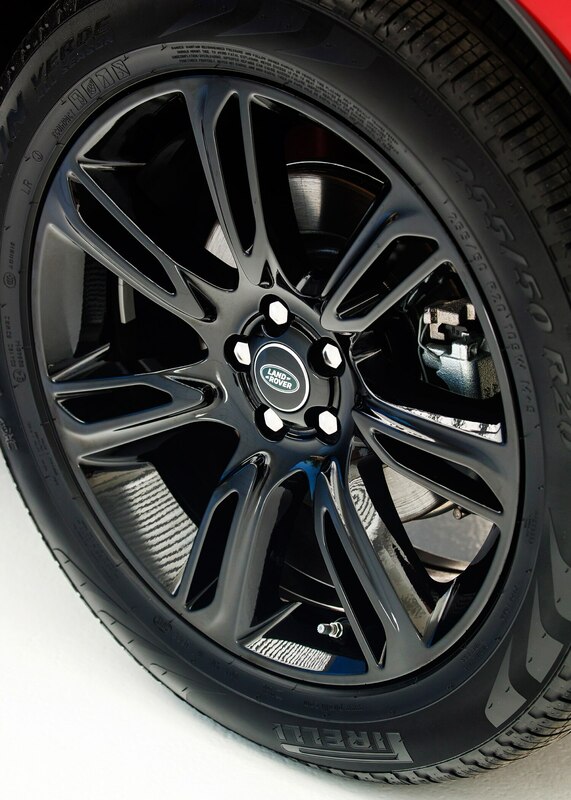 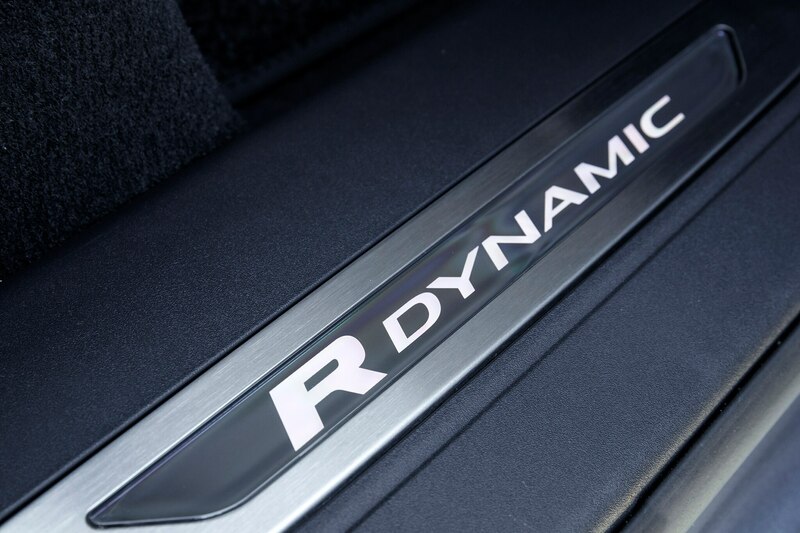 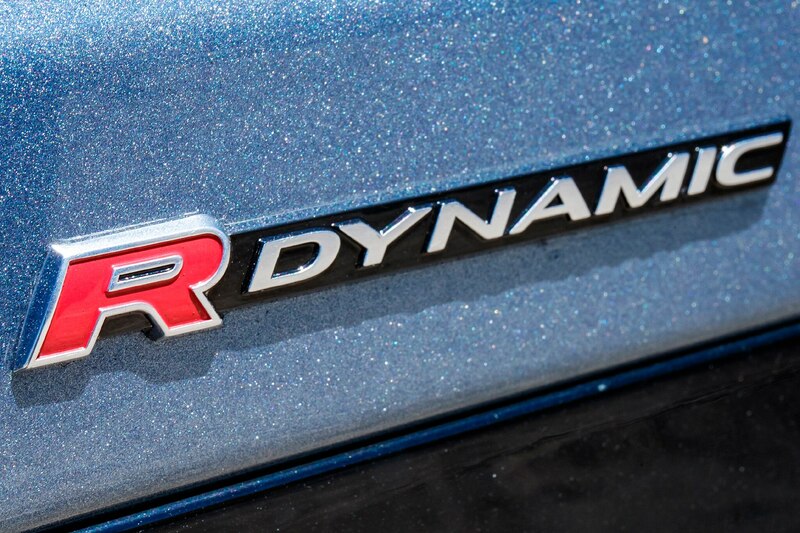 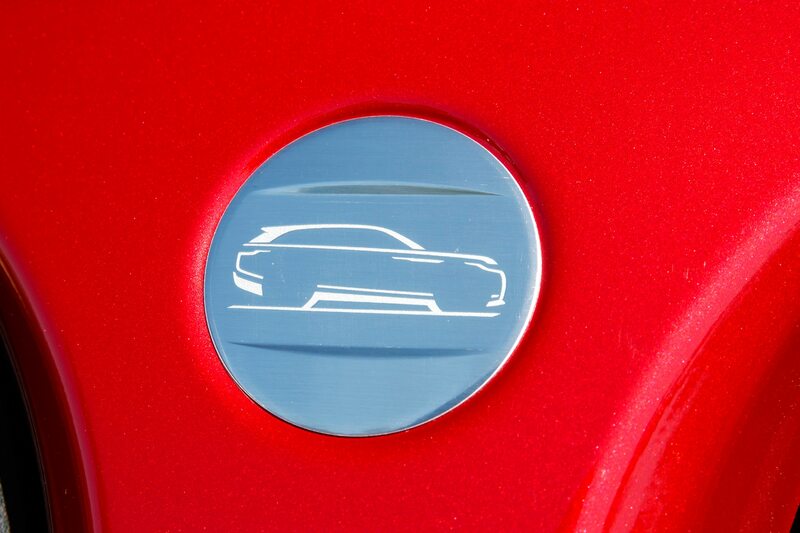 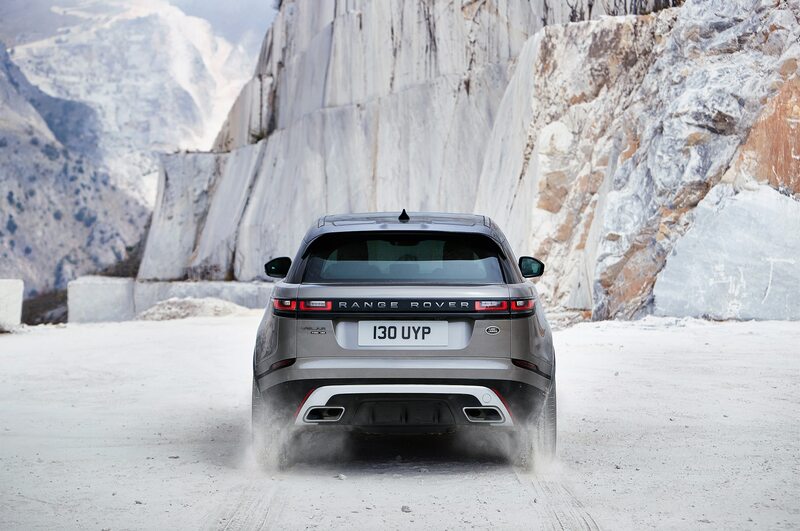 First and foremost, of course, is the extra torque on offer. 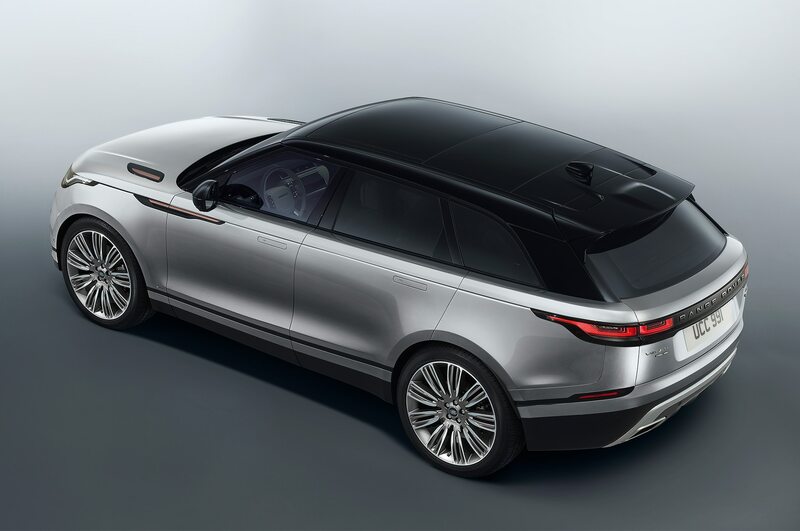 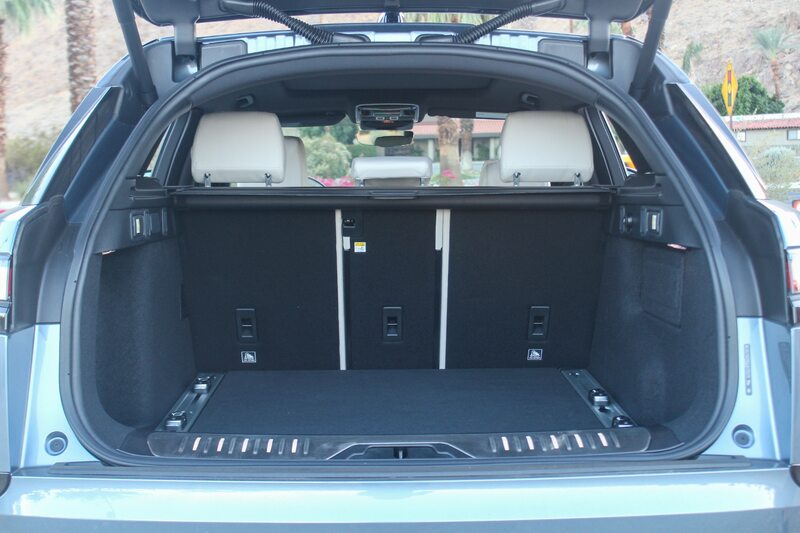 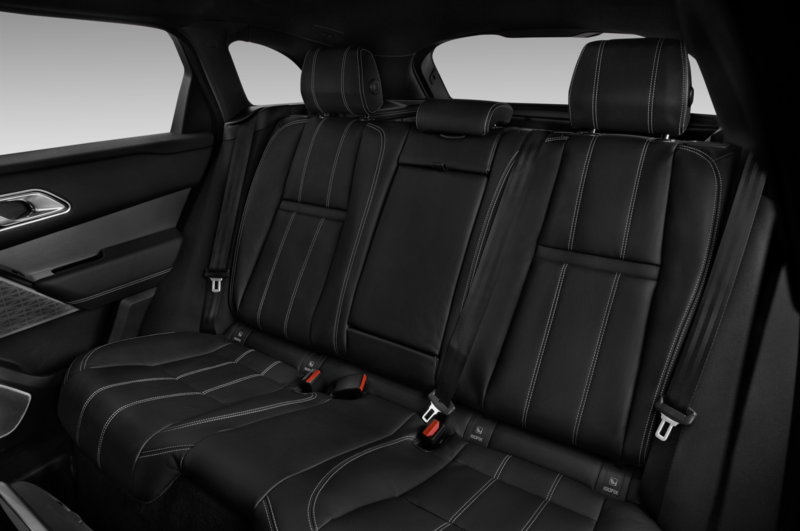 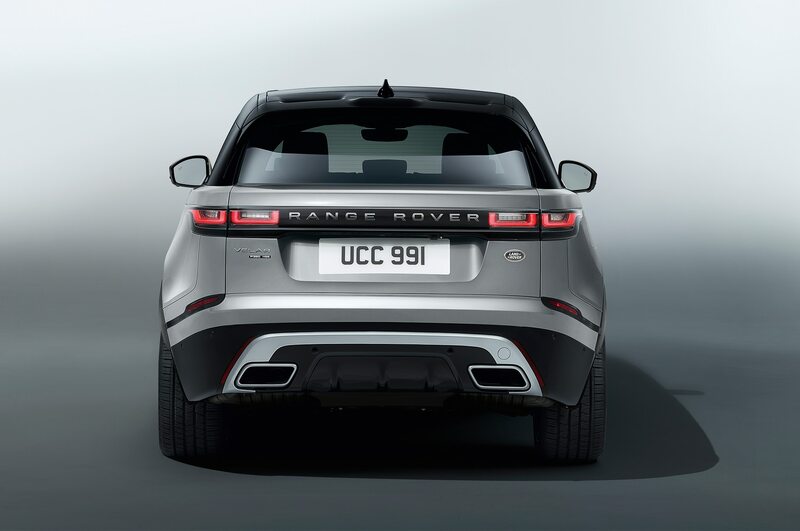 Second is the adjustable air suspension, which comes standard on all V-6-powered Velars; it makes for a bouncier ride on-road than the traditional coil spring suspension, but whereas a Velar with the standard coil suspension only has 8.4-inches of ground clearance, with the air suspension, the adjustable suspension-equipped one gets to boast as much as 9.9-inches at speeds up to 32 mph. 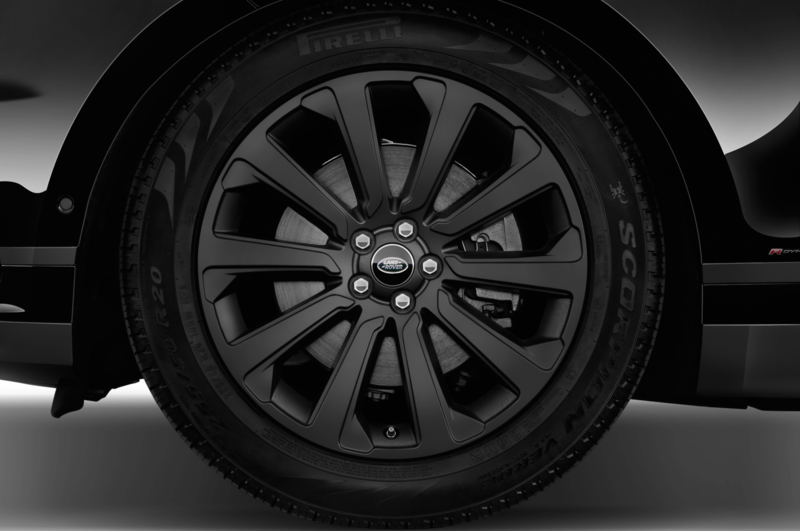 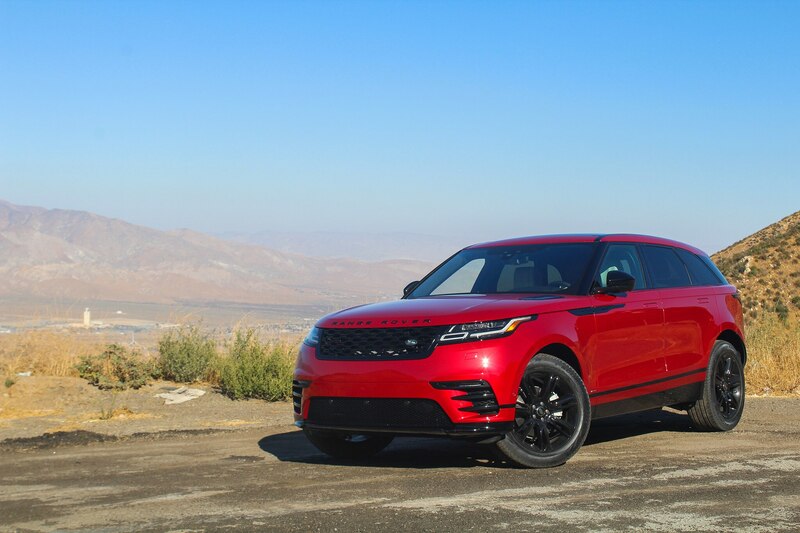 Third, the optional Active Locking Rear Differential is only available on V-6 models; unlike traditional locking differentials, it doesn’t actually lock, but rather allocates torque distribution based on load transfer and friction. 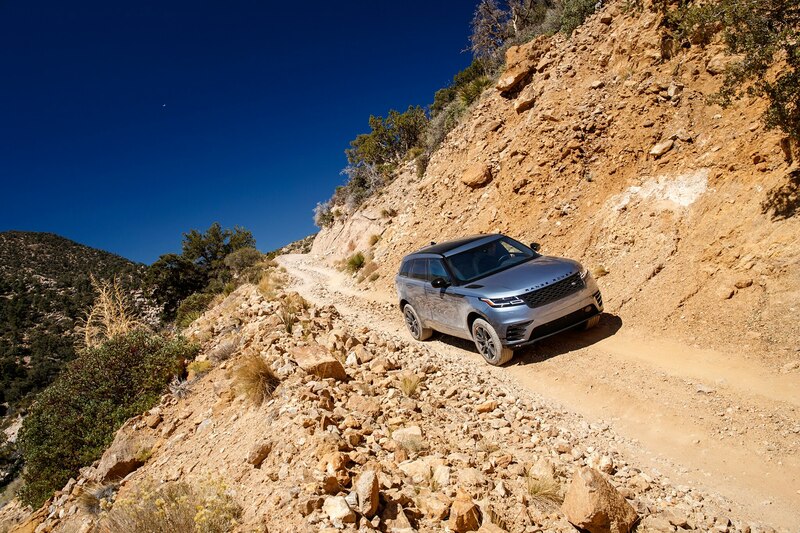 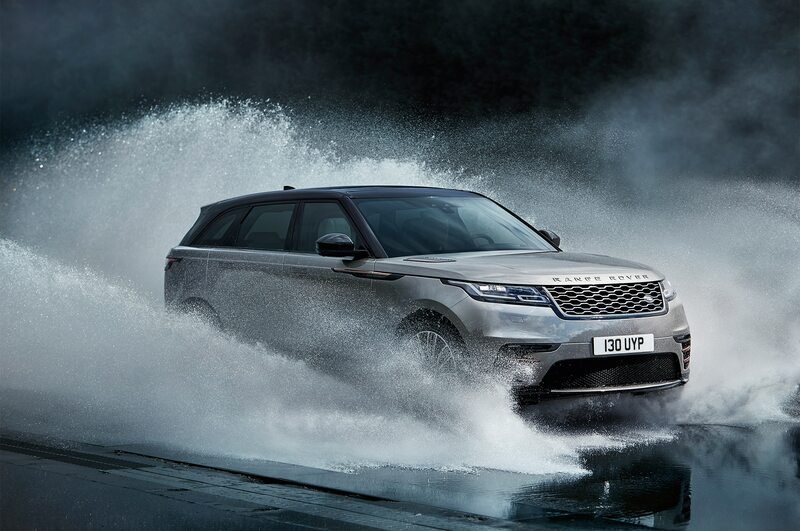 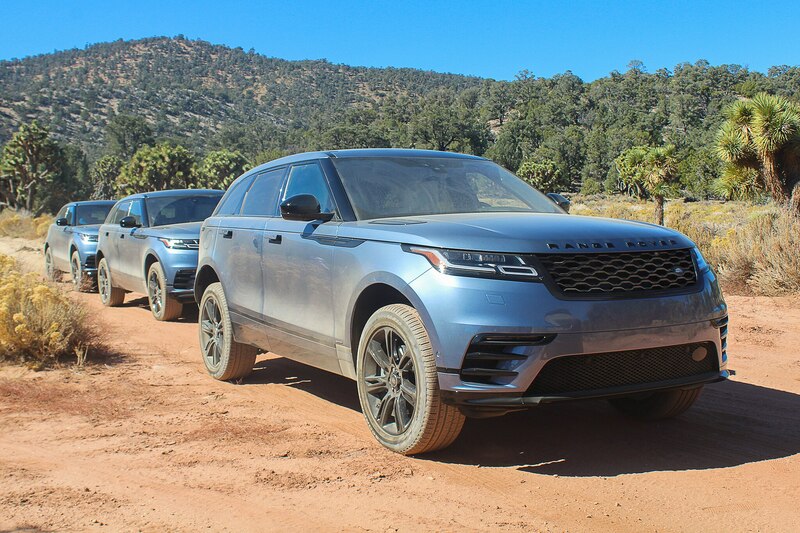 Throw in Land Rover’s Terrain Response and All Terrain Progress Control systems and what you have is a Range Rover with the off-road ability of, well, a Range Rover. 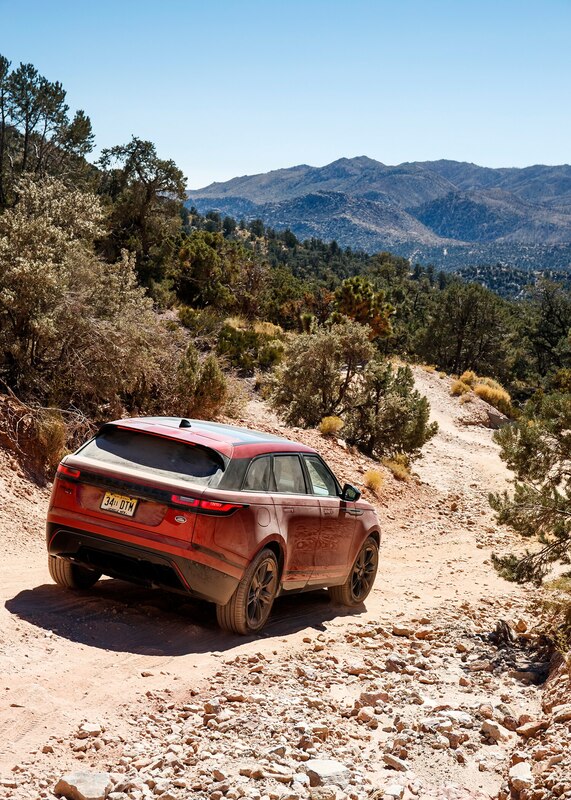 Despite the soft-looking sheetmetal, this rig doesn’t go soft when the road gets hard, even while wearing its stock Pirelli Scorpion Verde all-seasons, sized 255/50R20 on the midrange Velar R-Dynamic SE we occupied (wheel sizes range from 18 to 22 inches, depending on the trim). 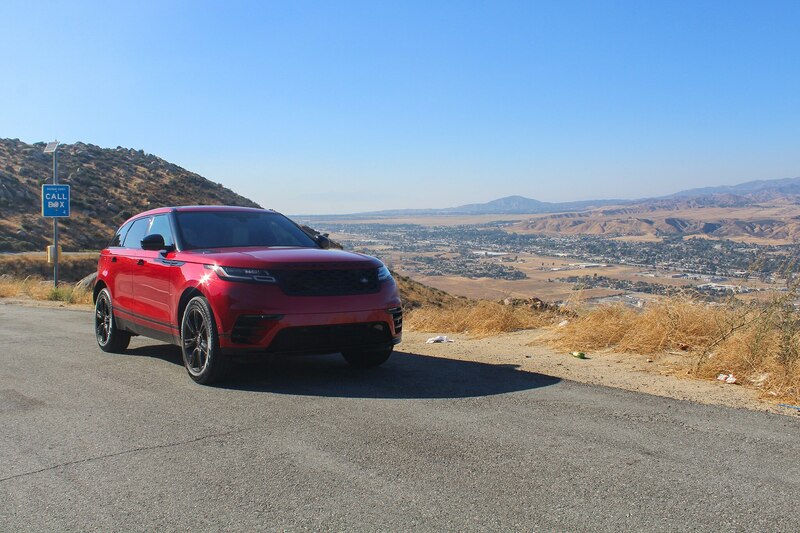 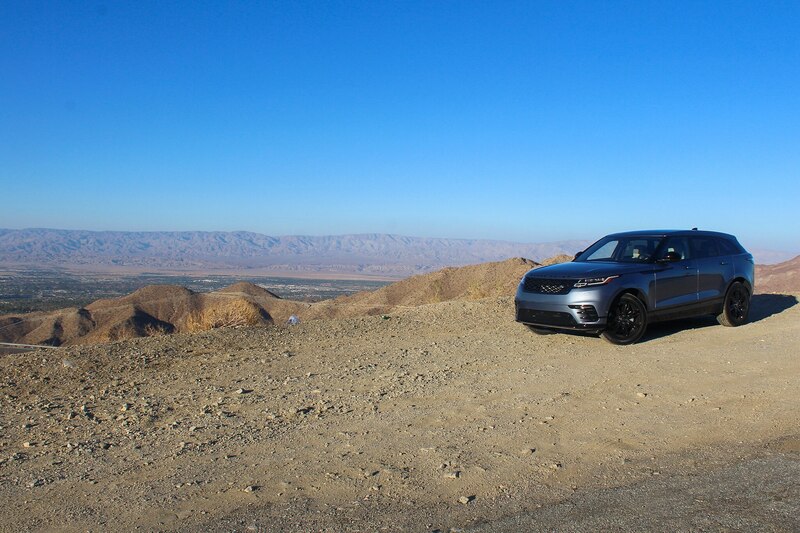 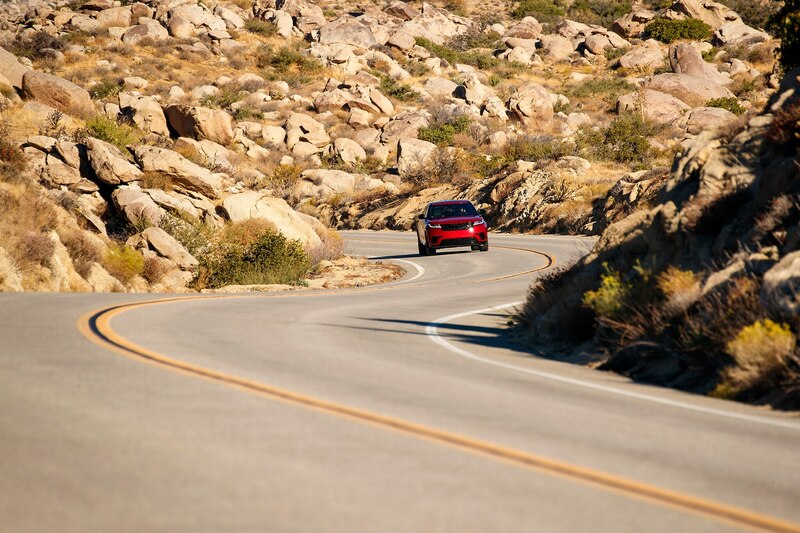 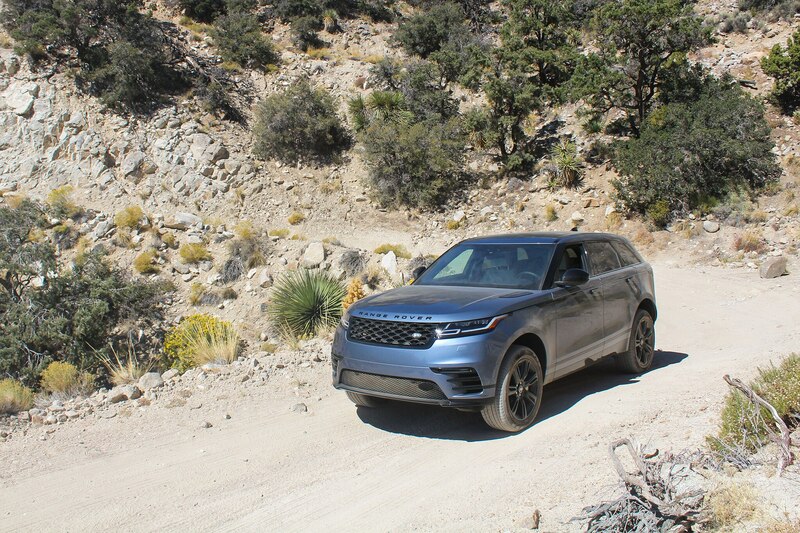 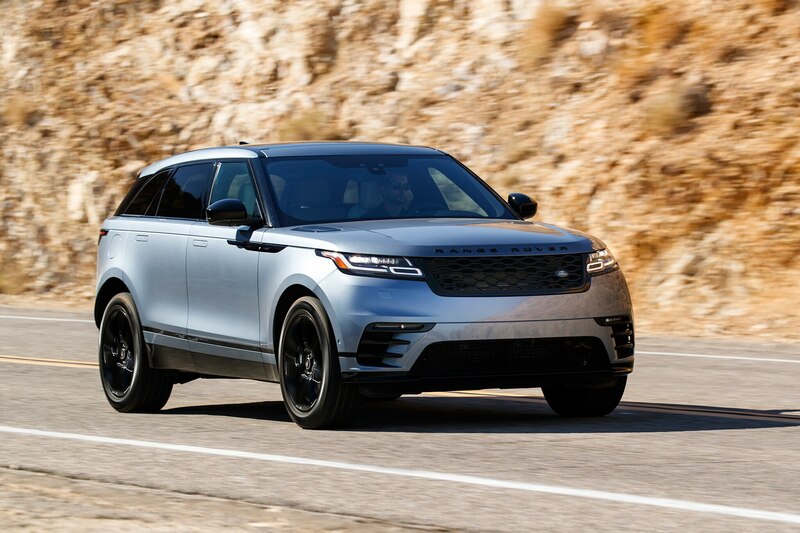 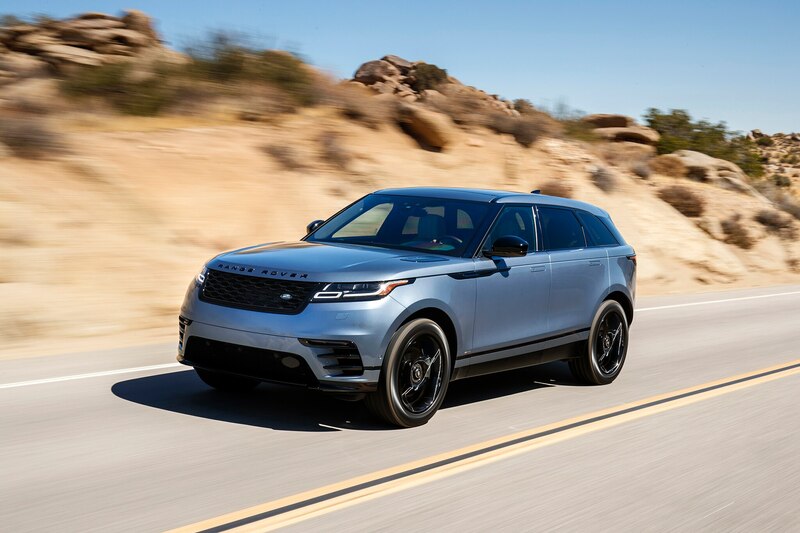 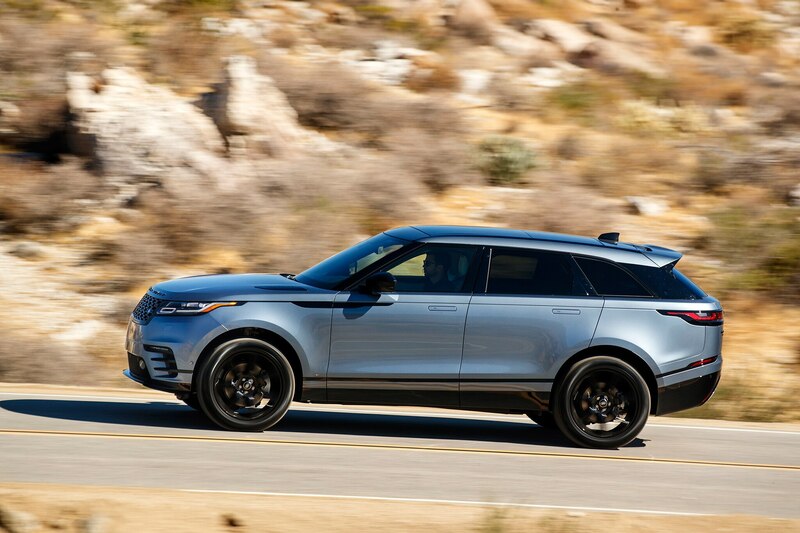 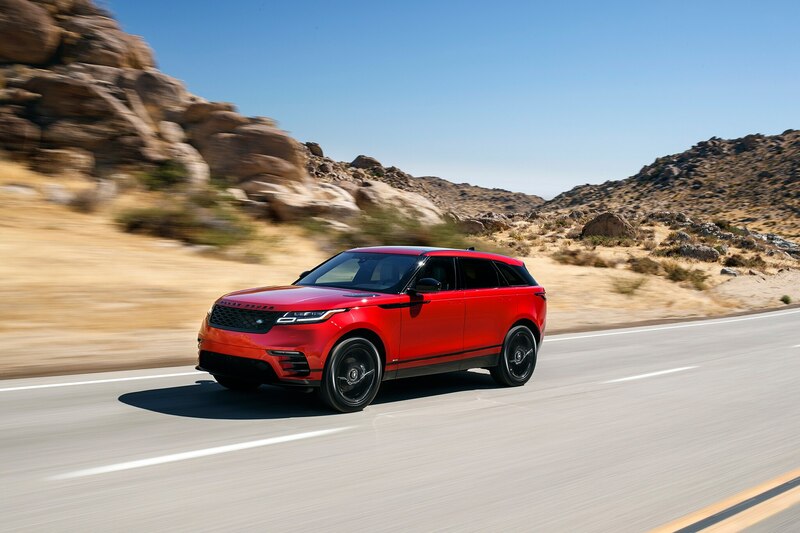 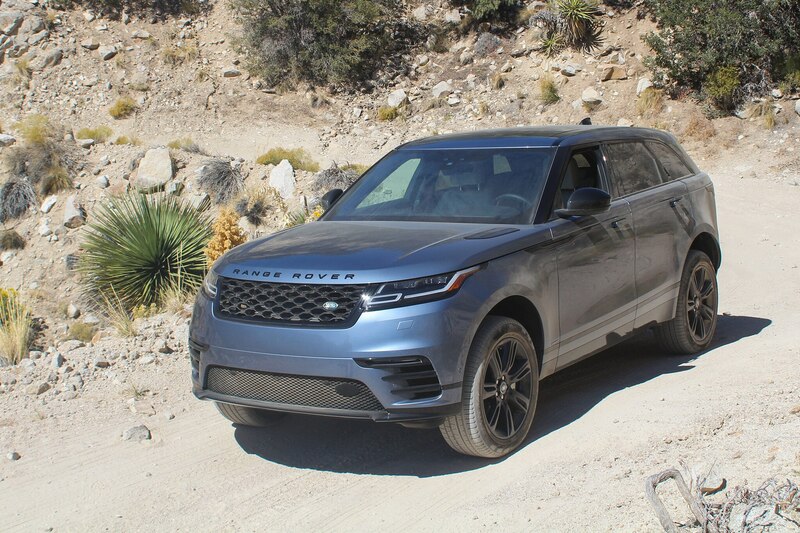 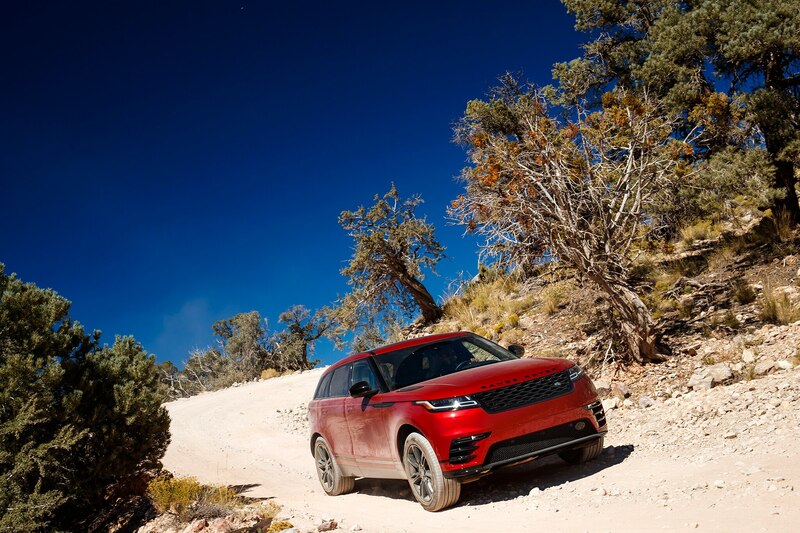 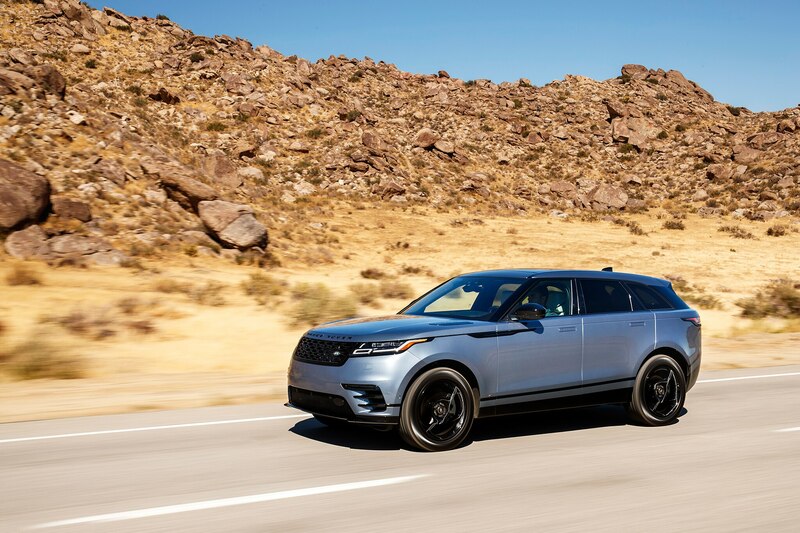 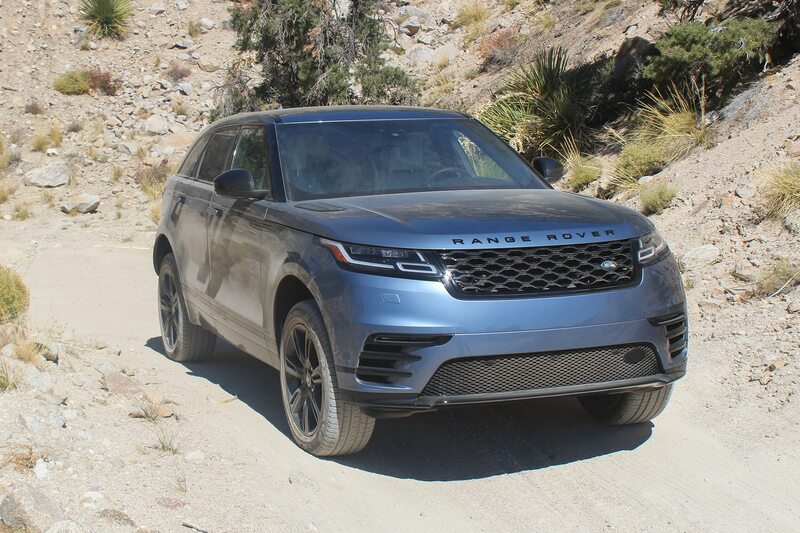 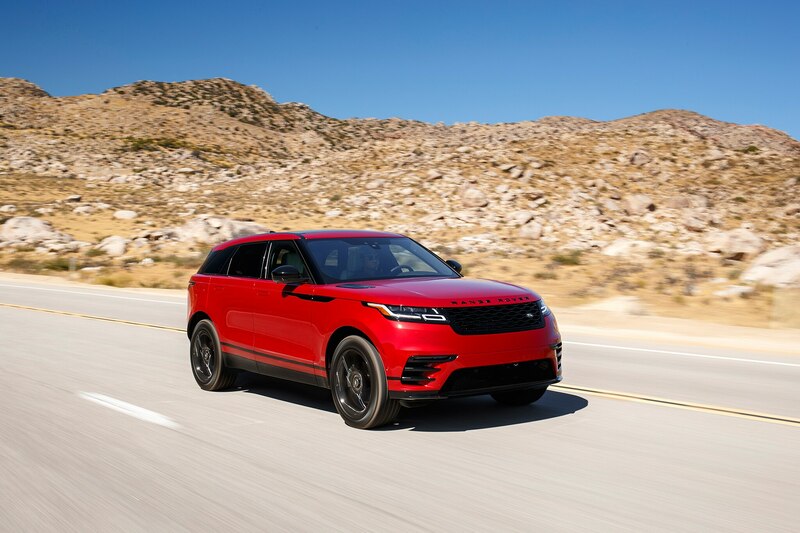 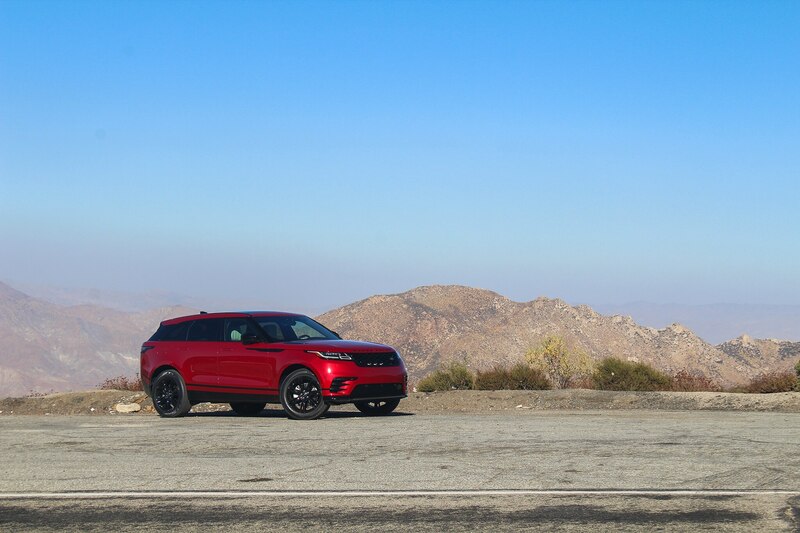 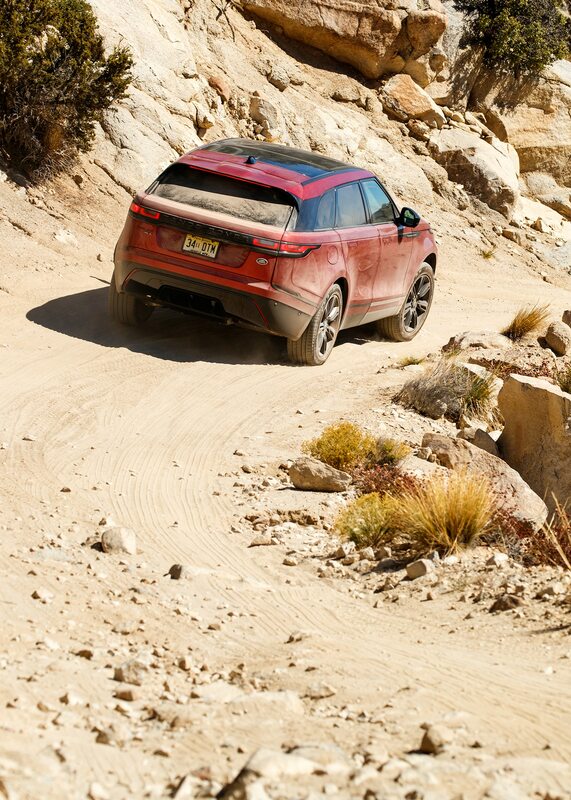 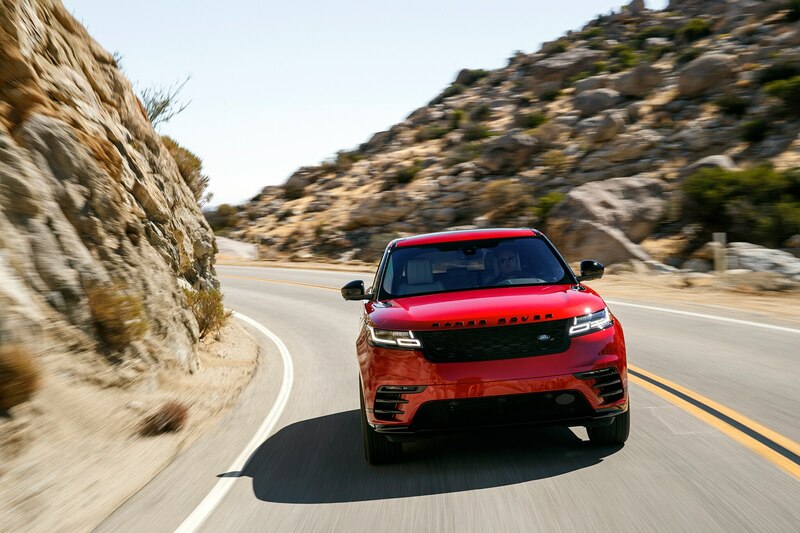 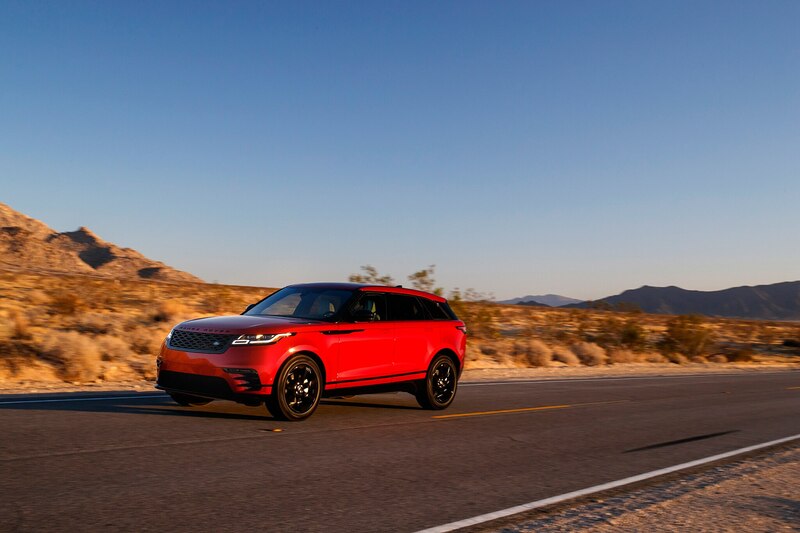 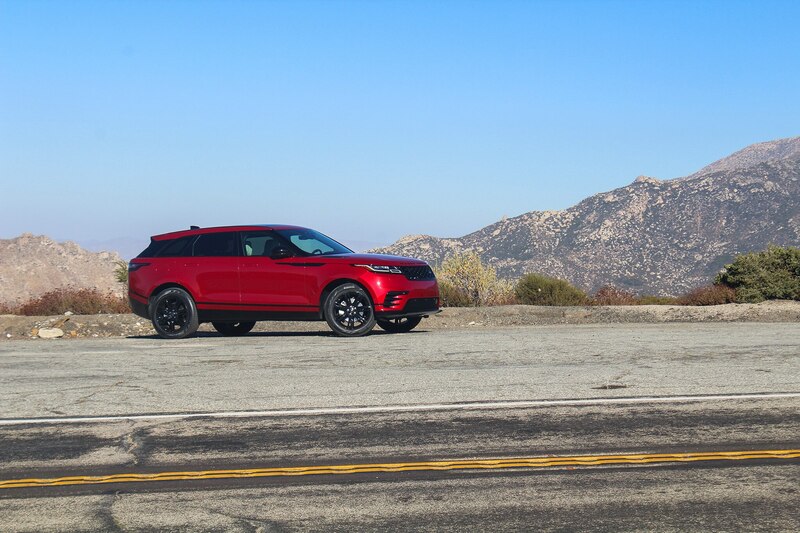 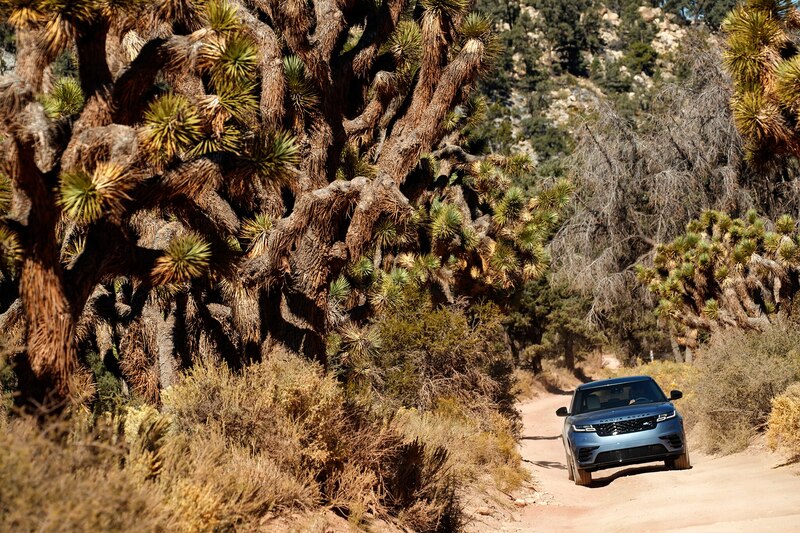 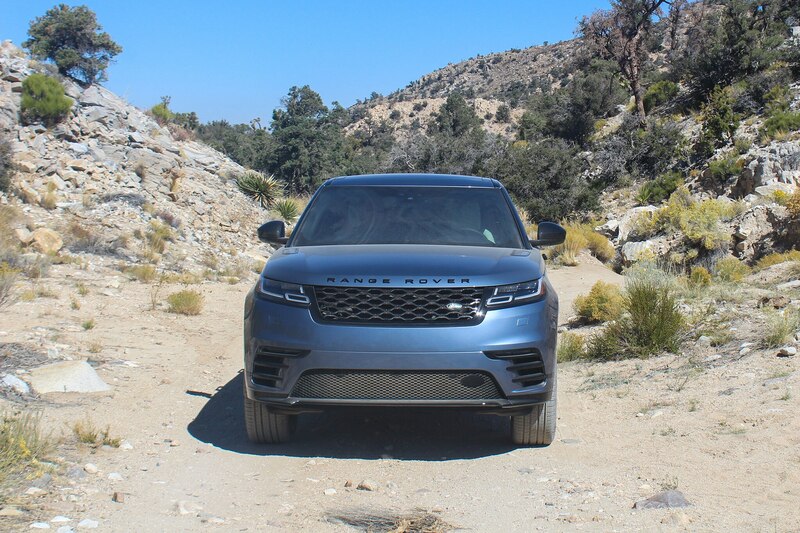 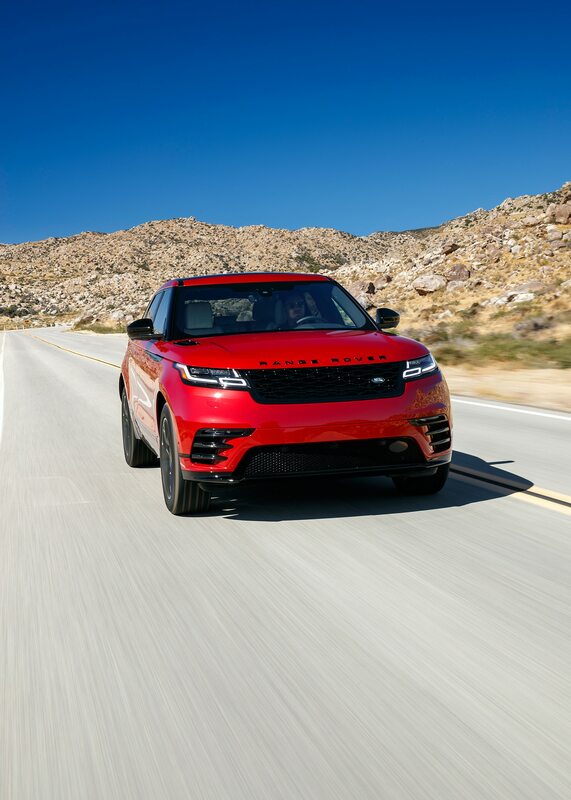 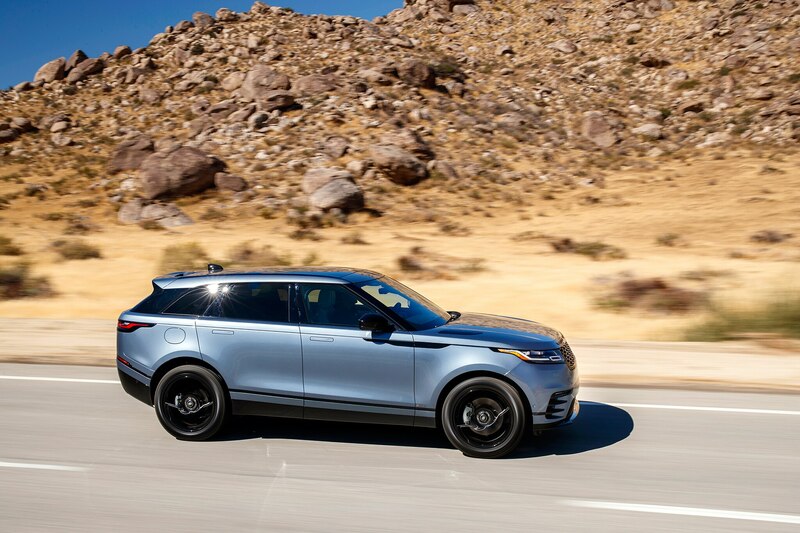 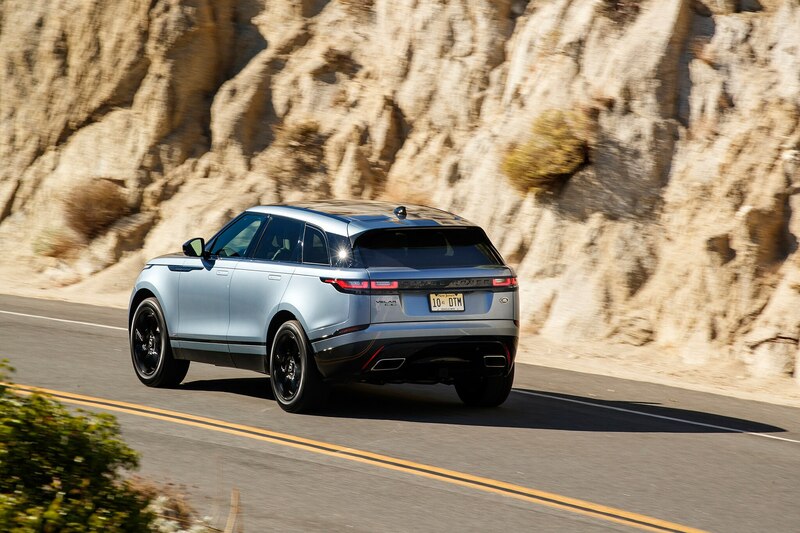 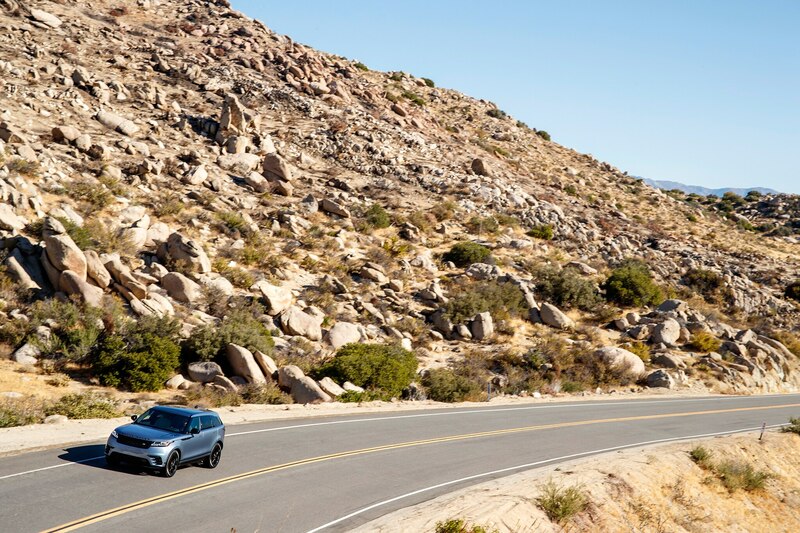 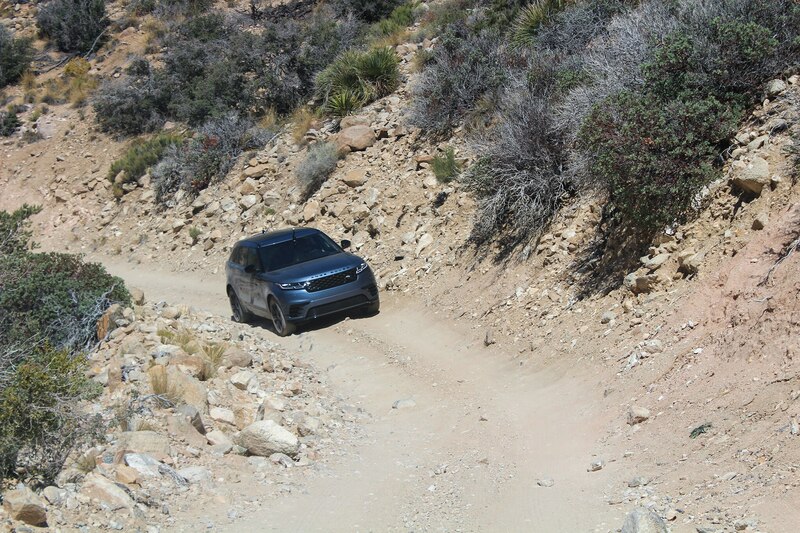 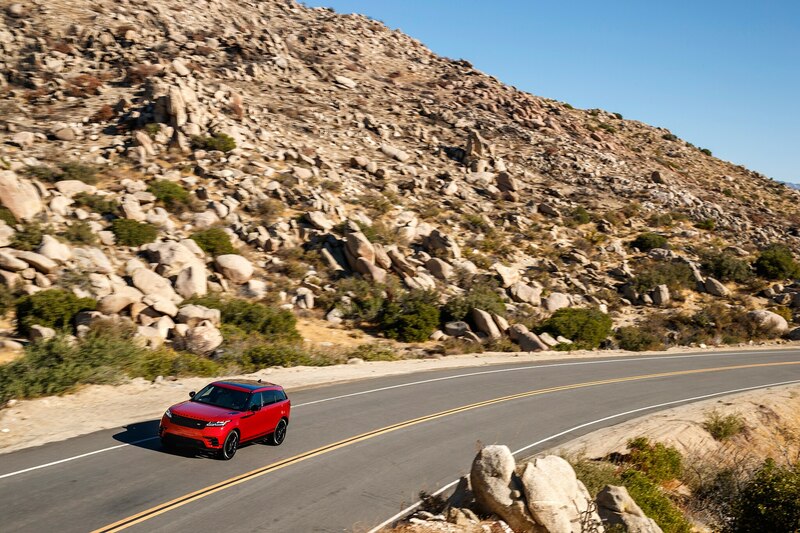 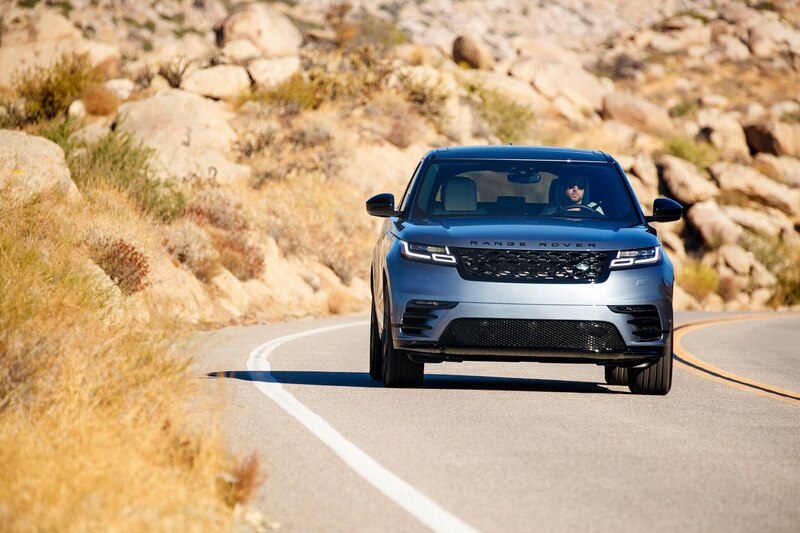 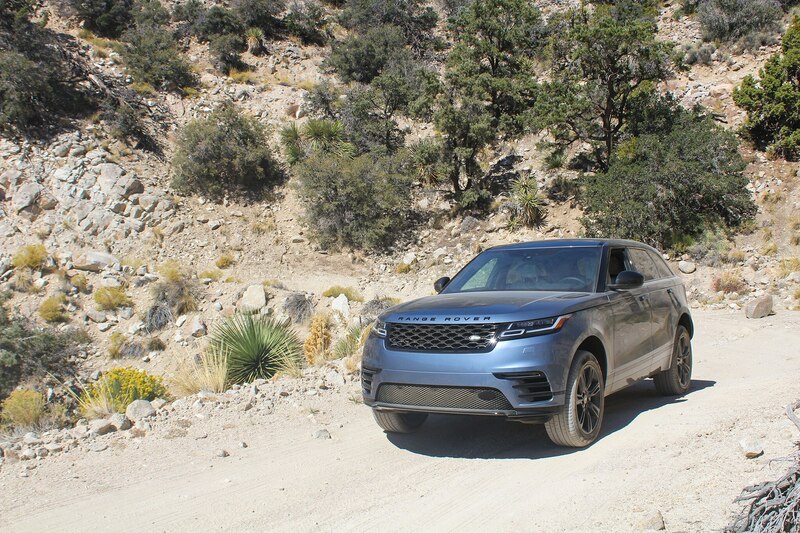 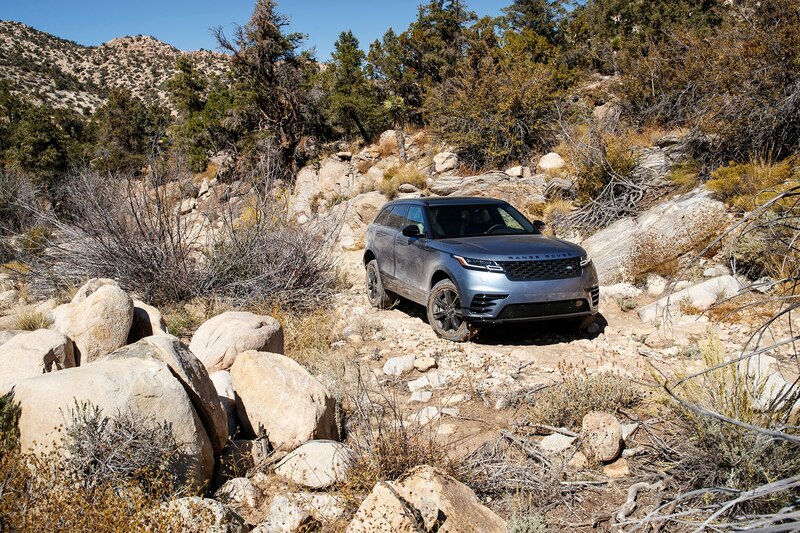 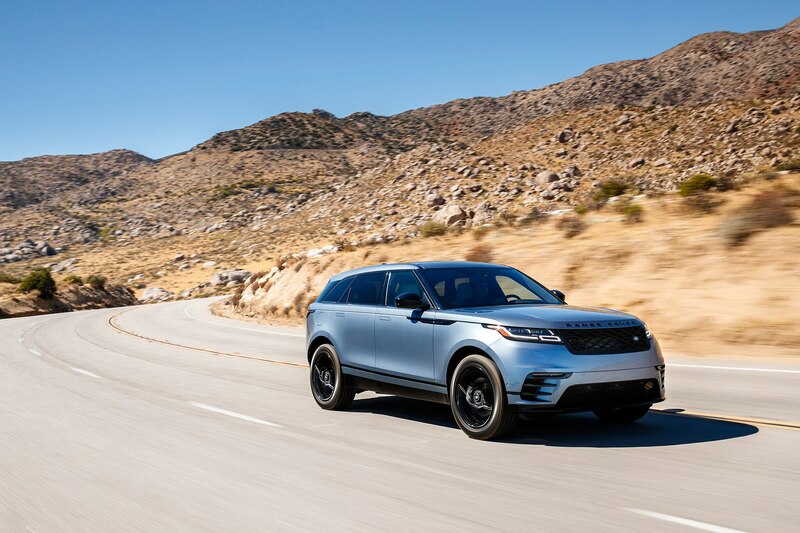 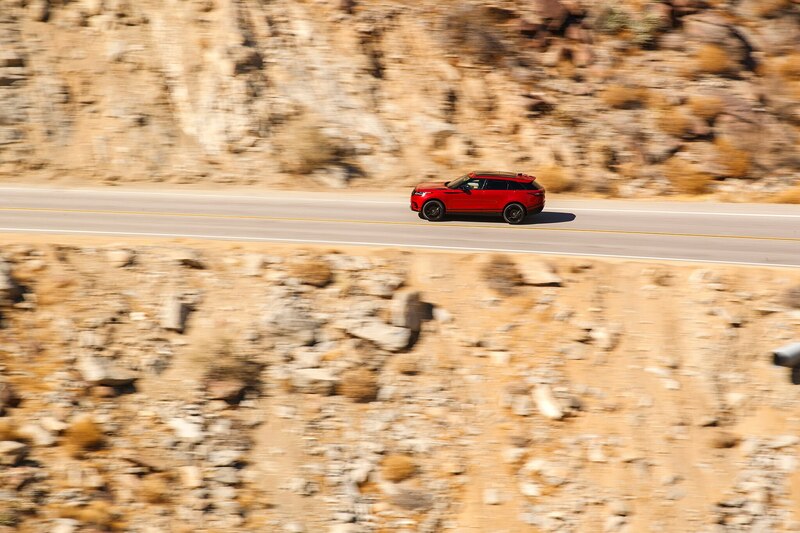 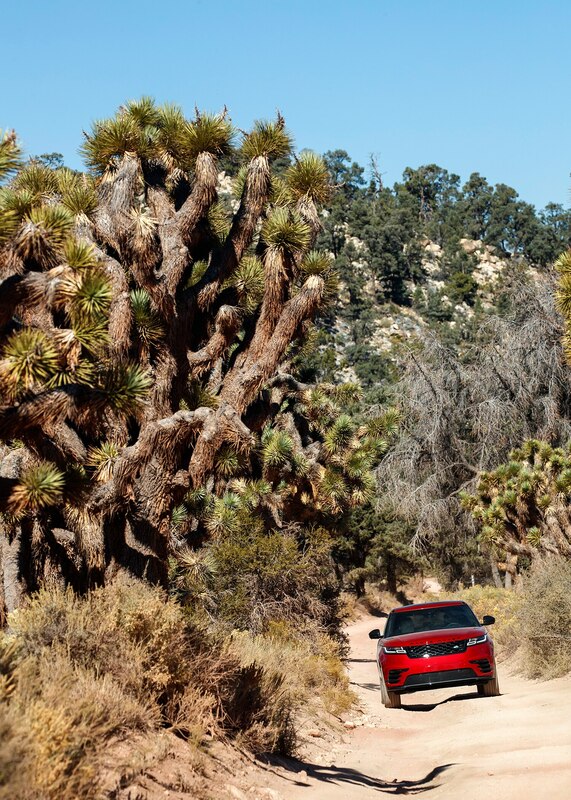 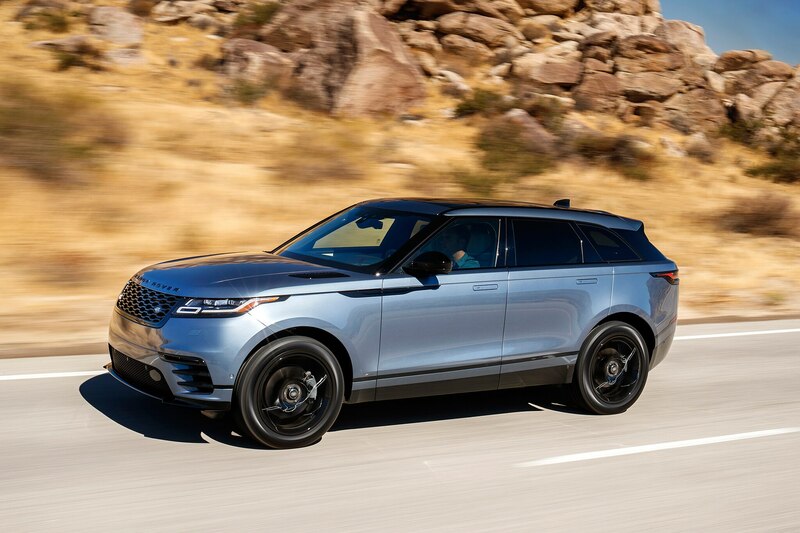 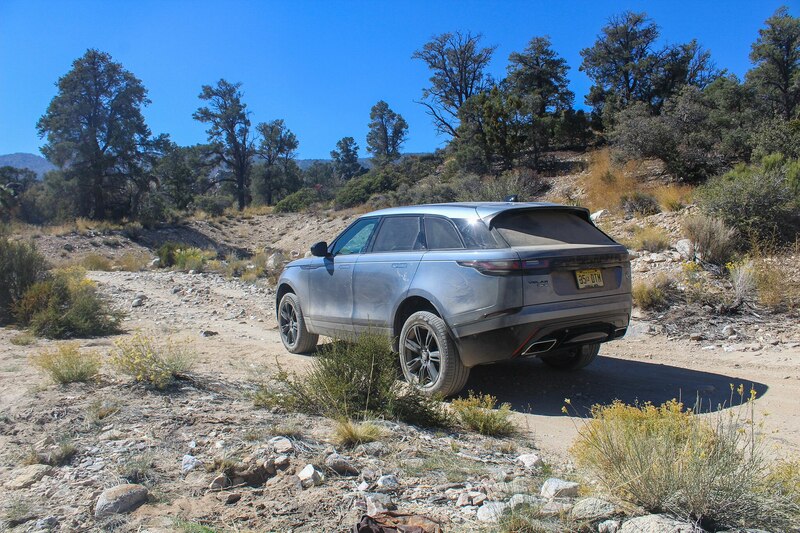 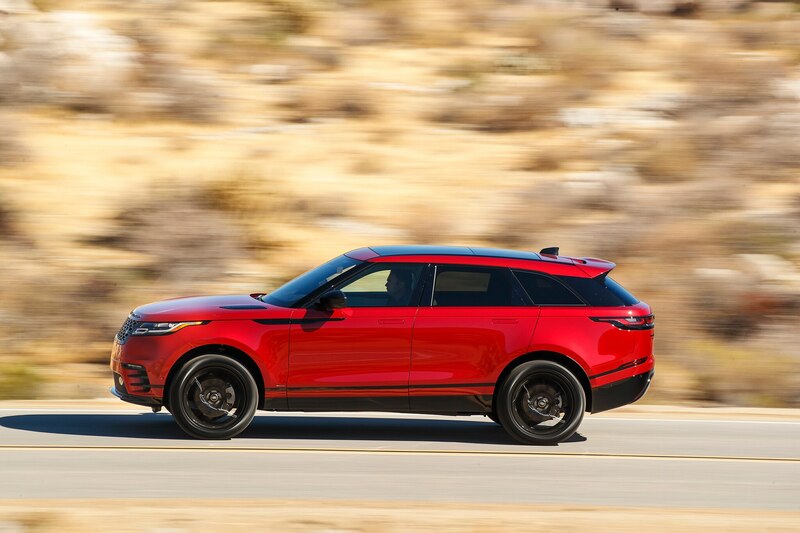 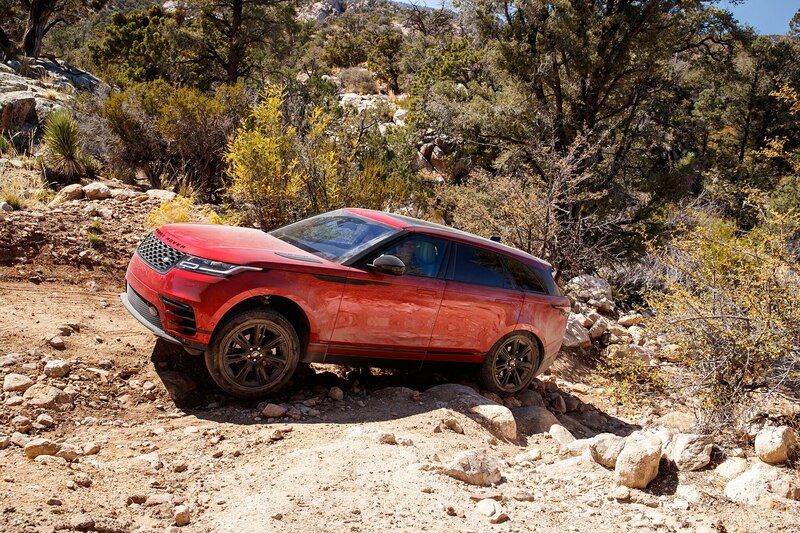 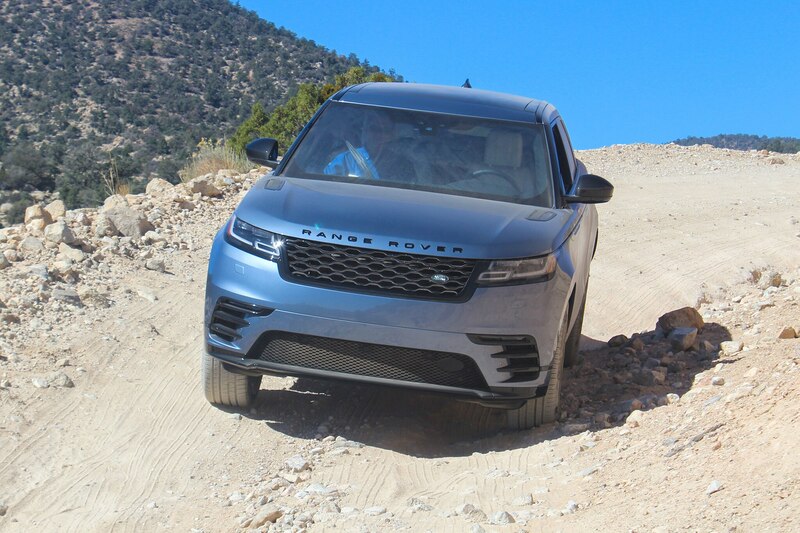 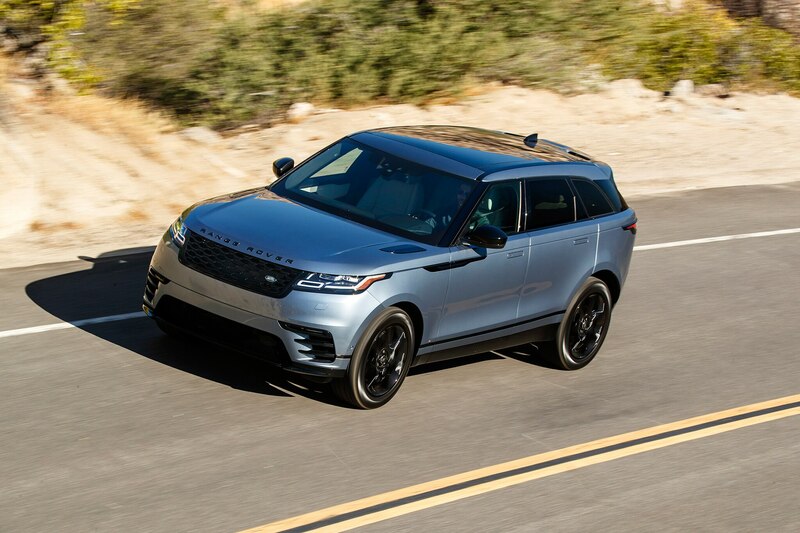 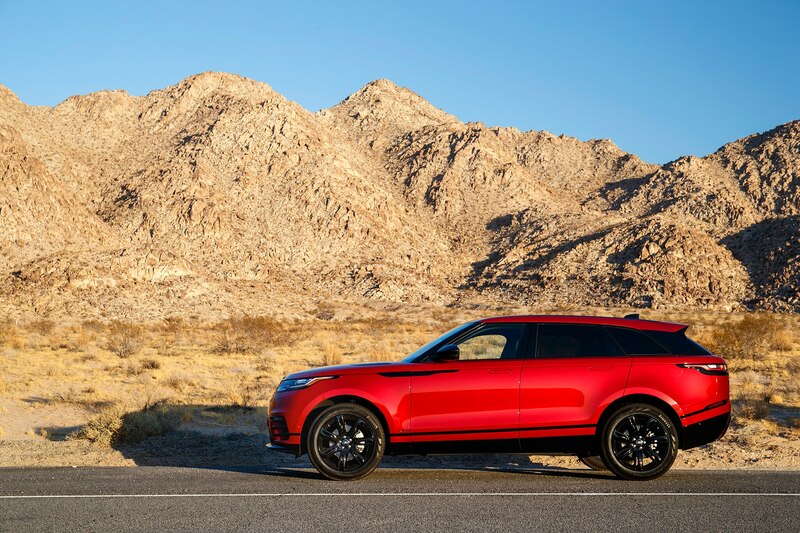 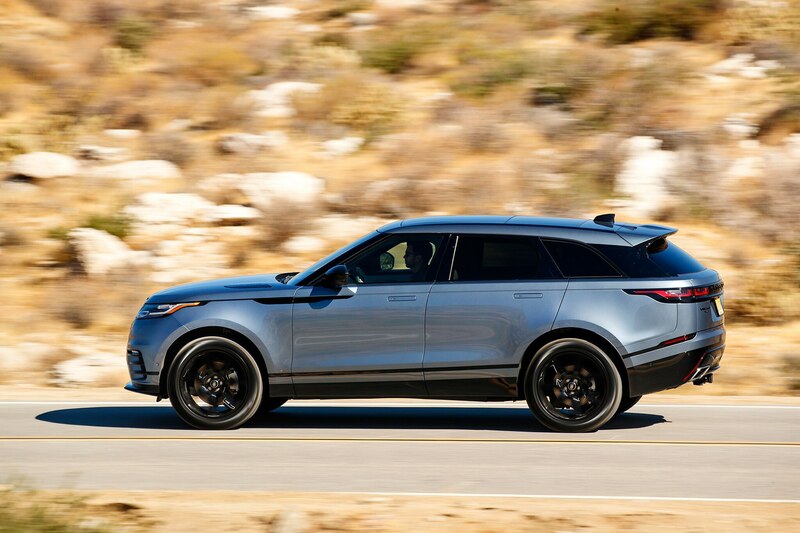 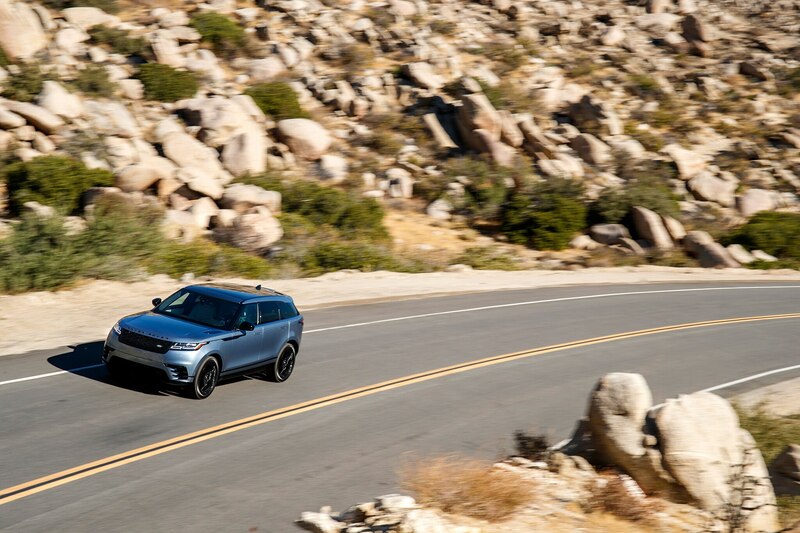 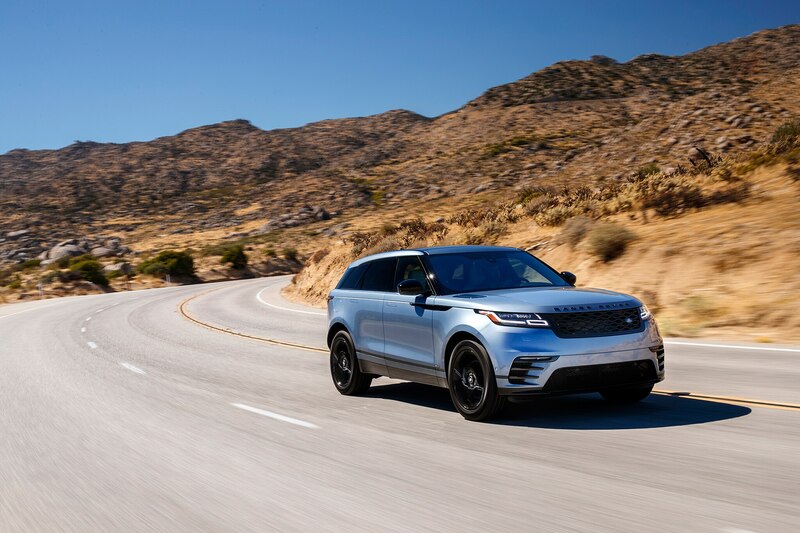 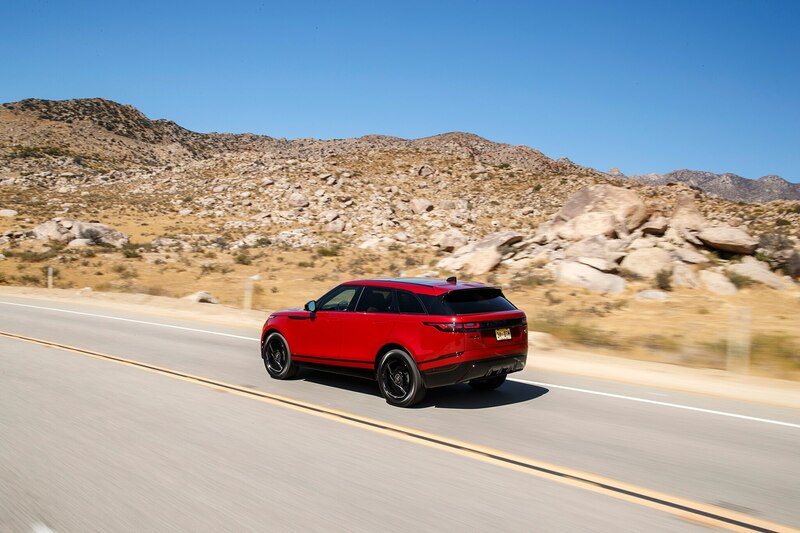 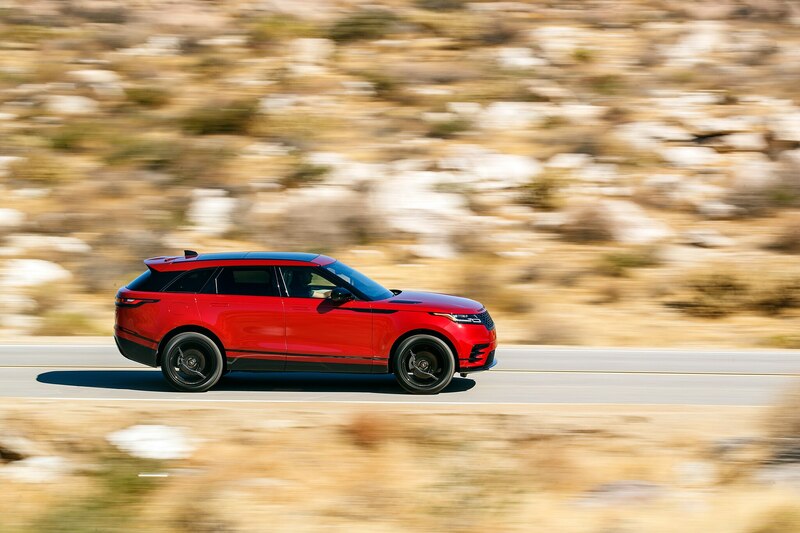 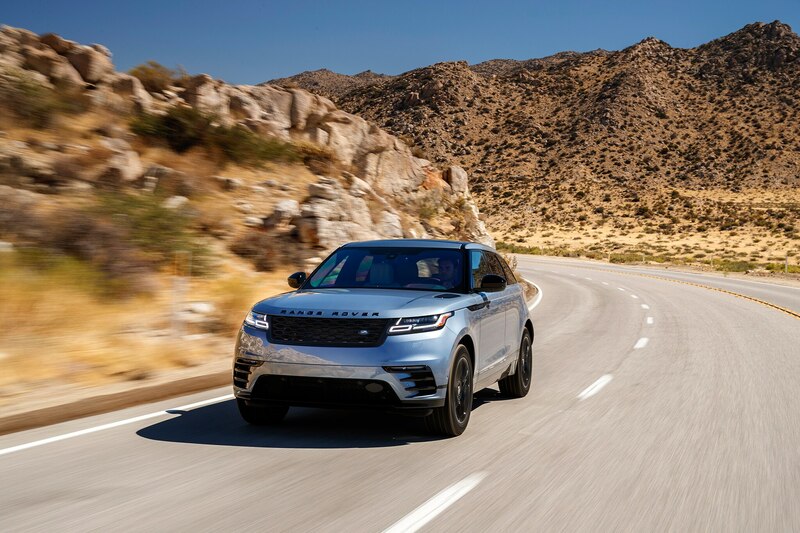 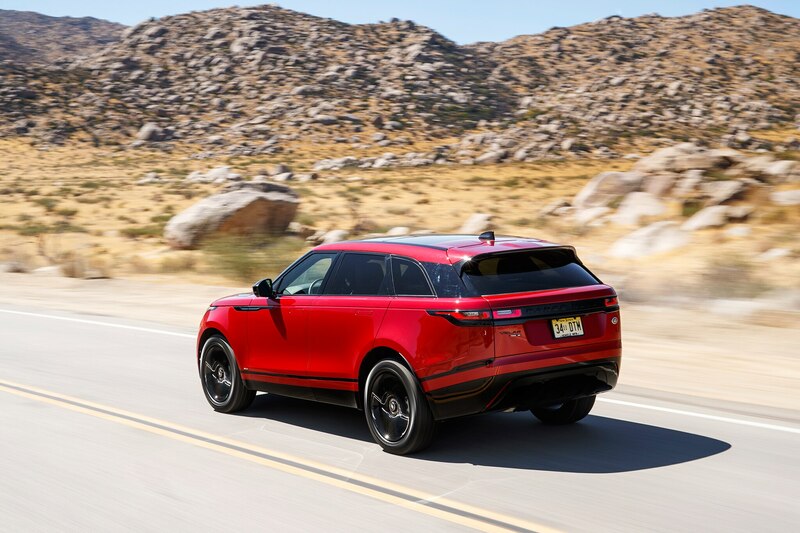 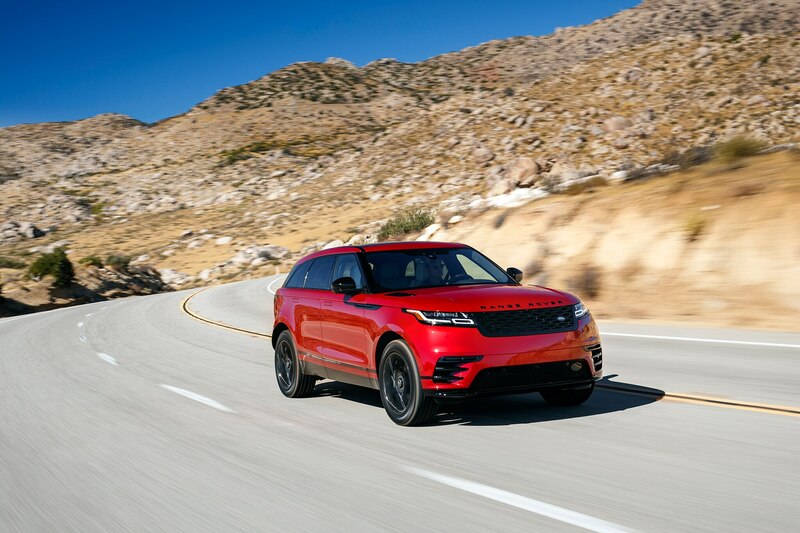 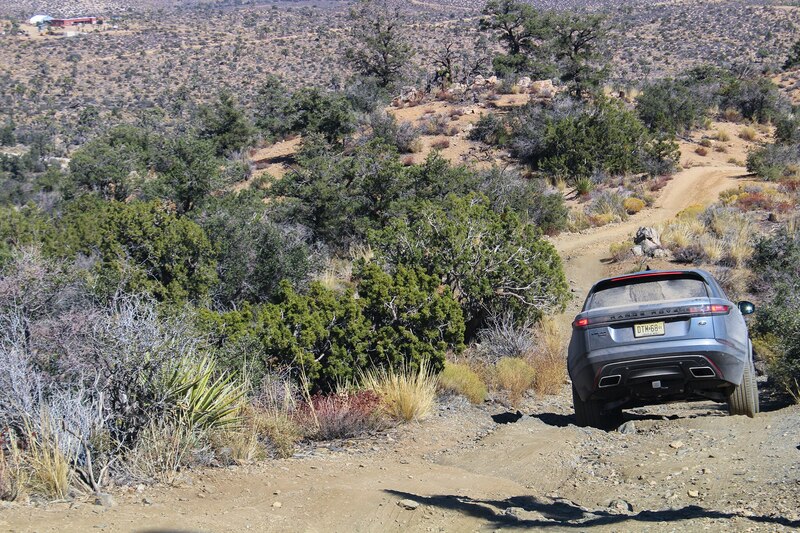 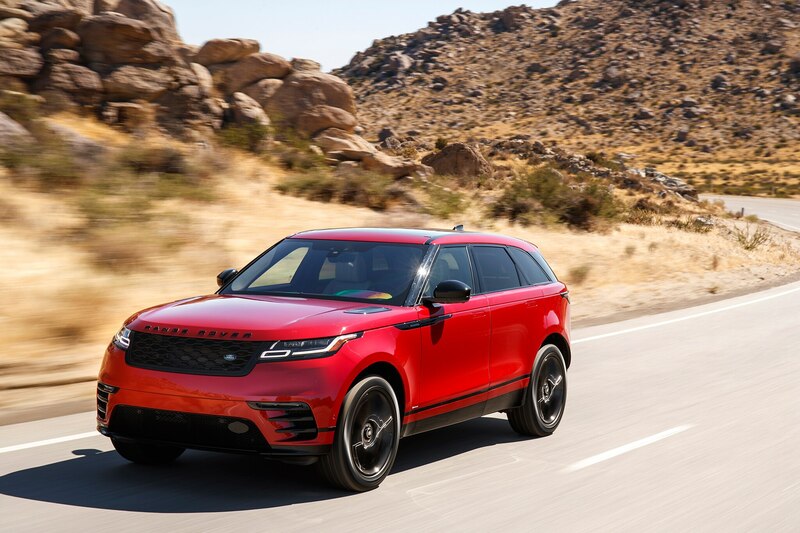 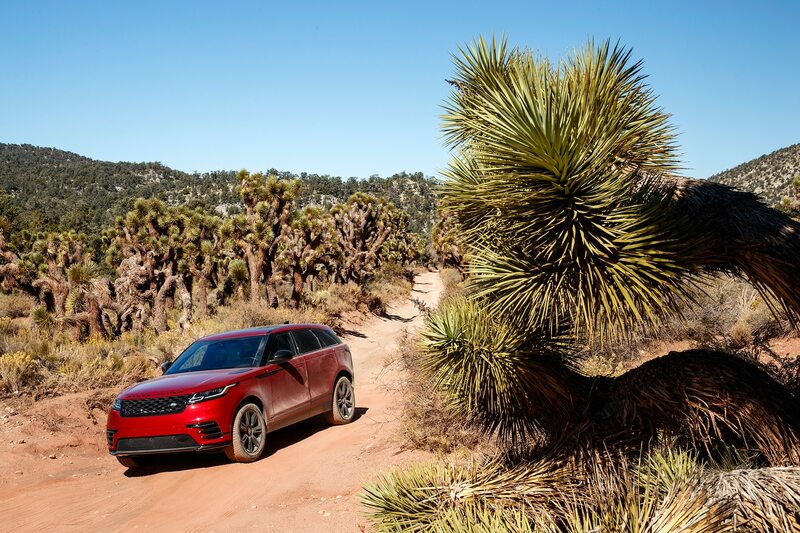 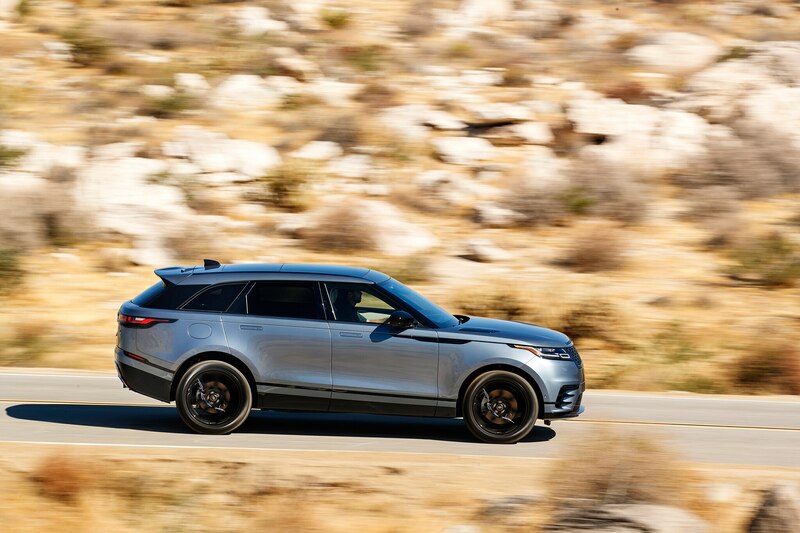 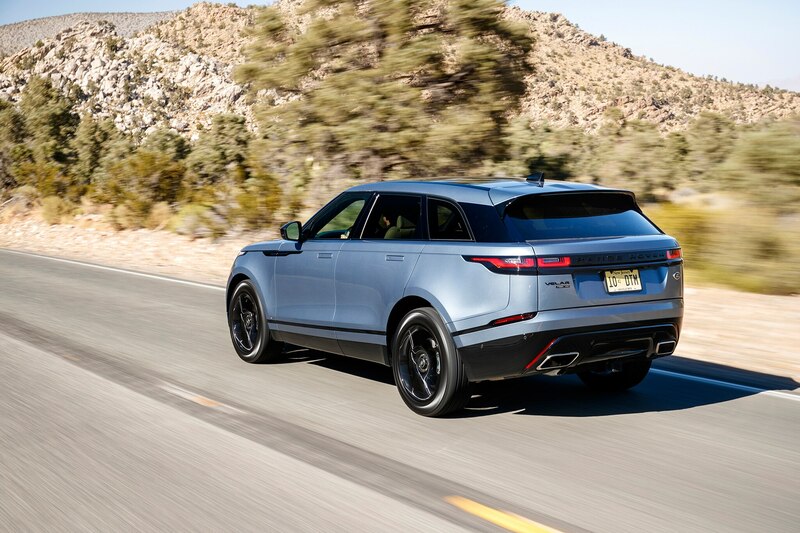 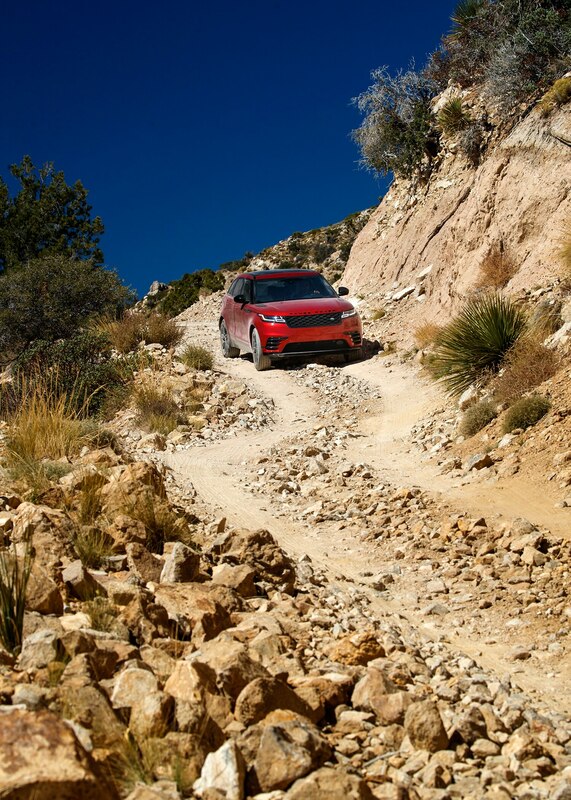 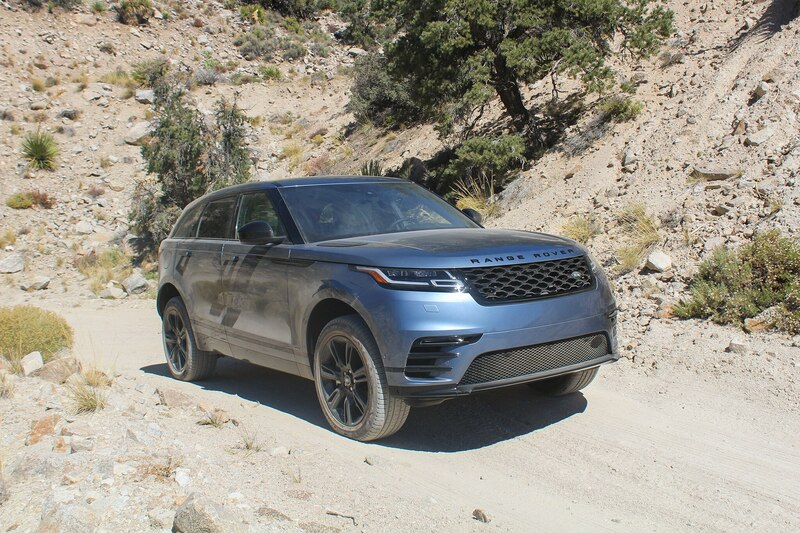 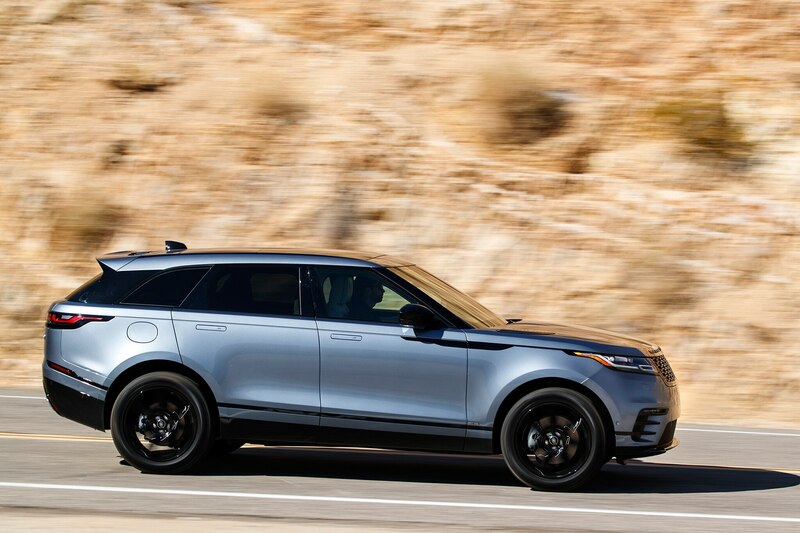 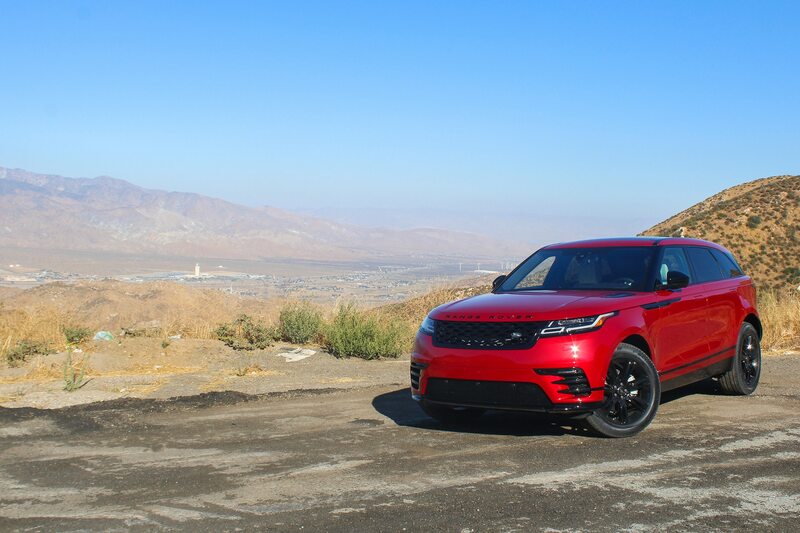 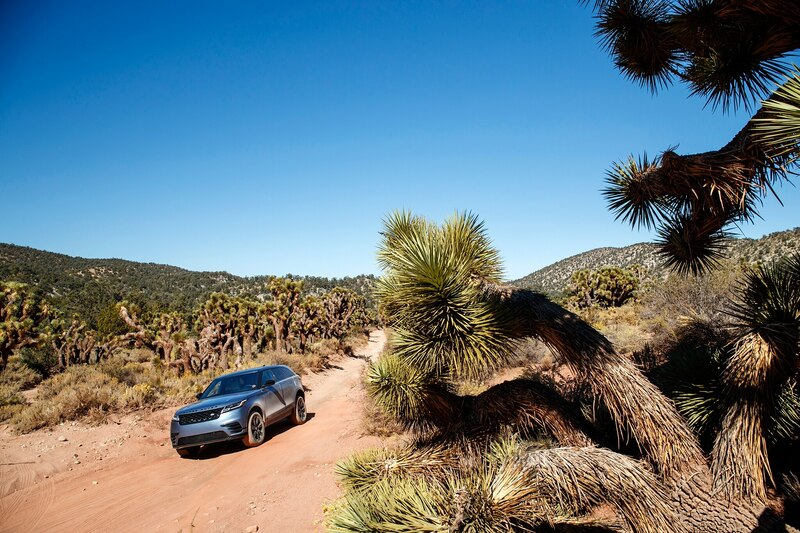 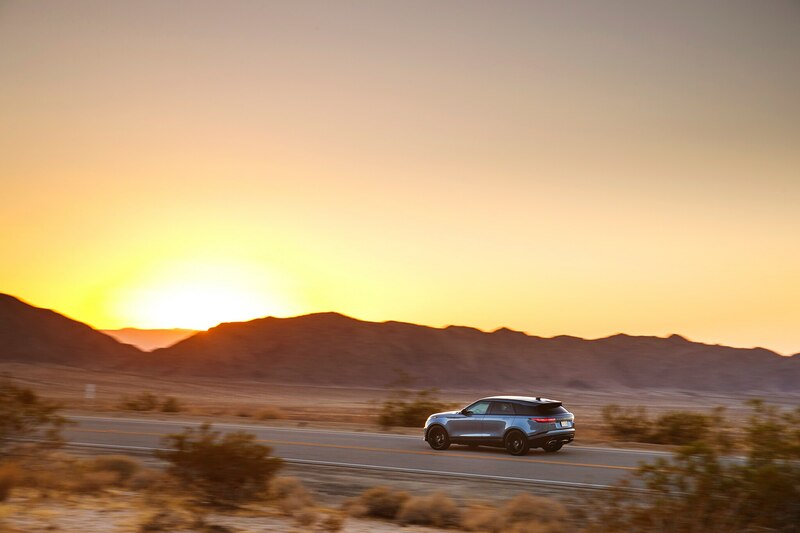 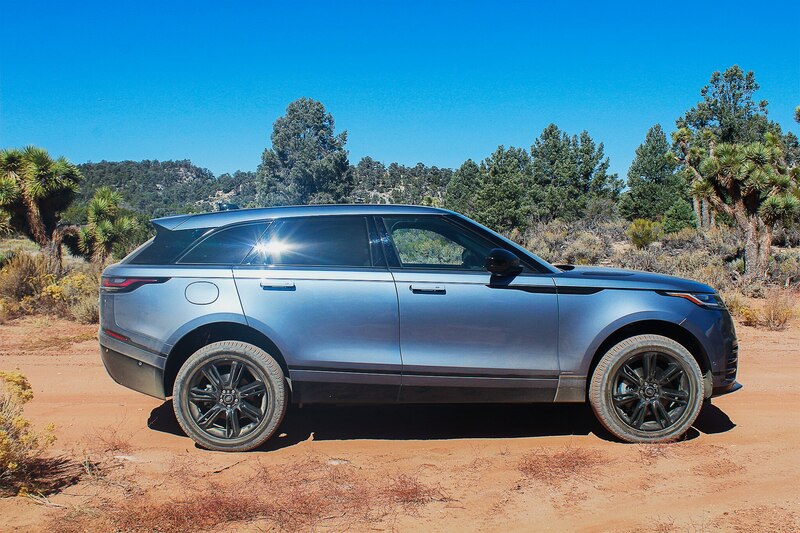 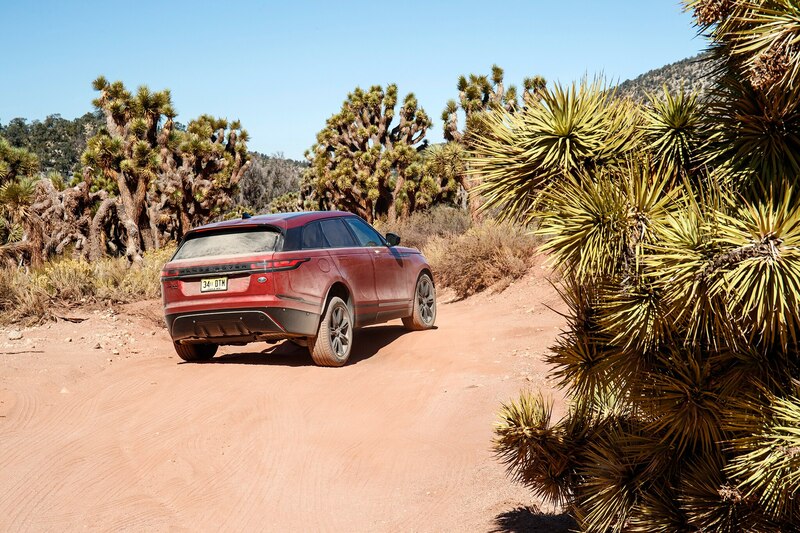 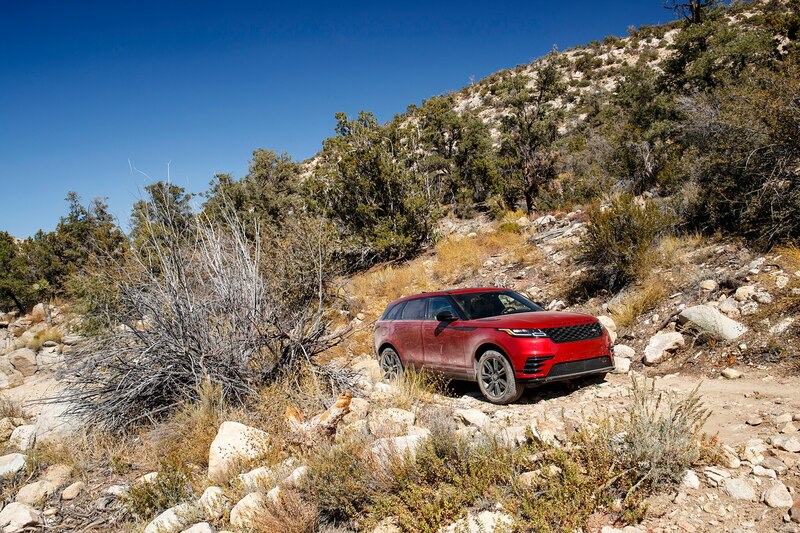 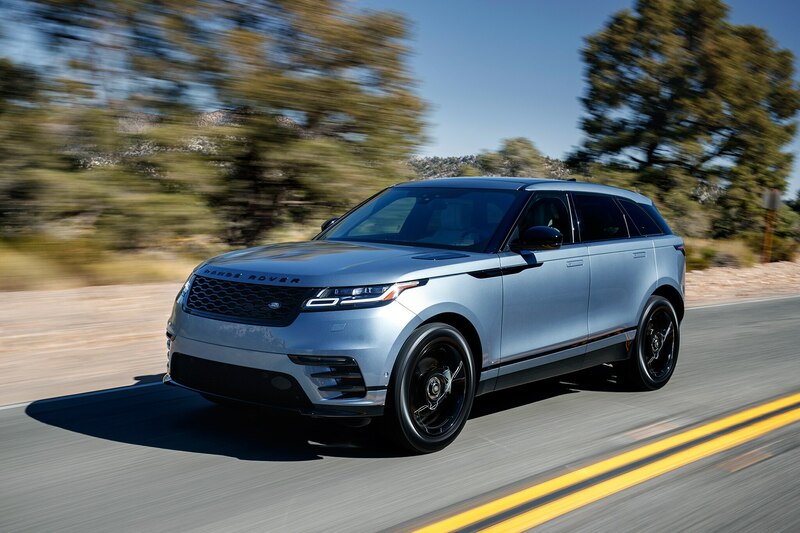 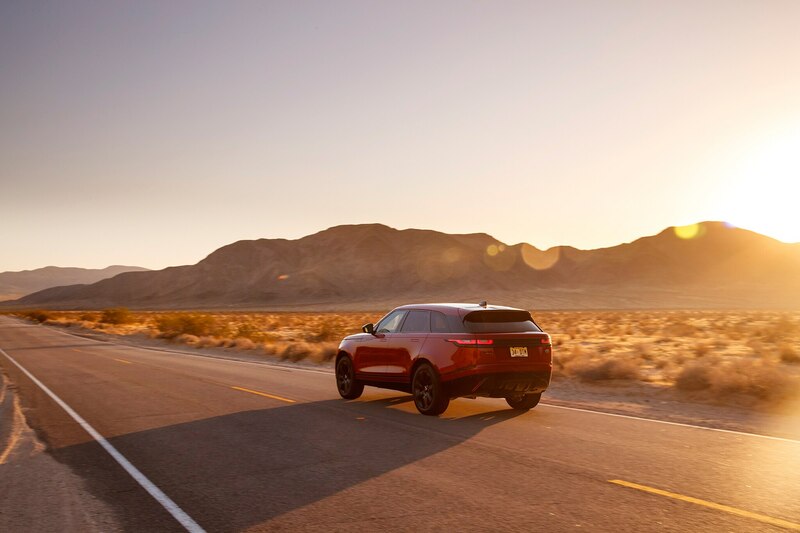 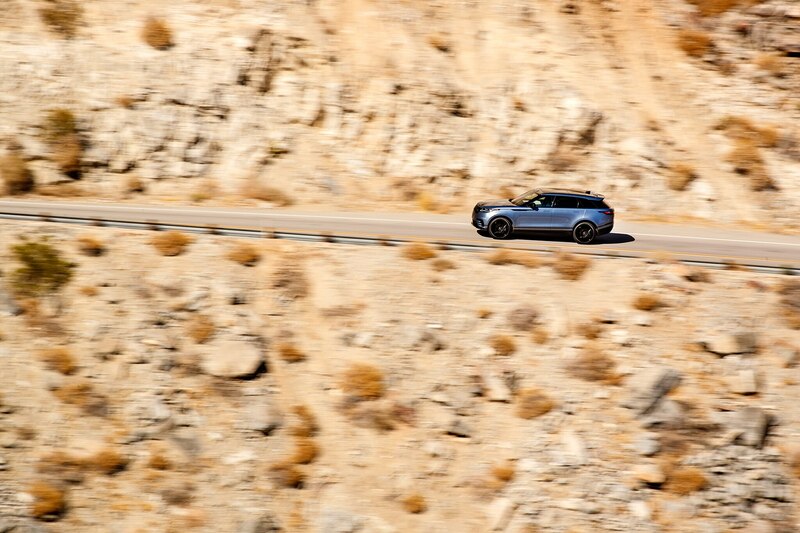 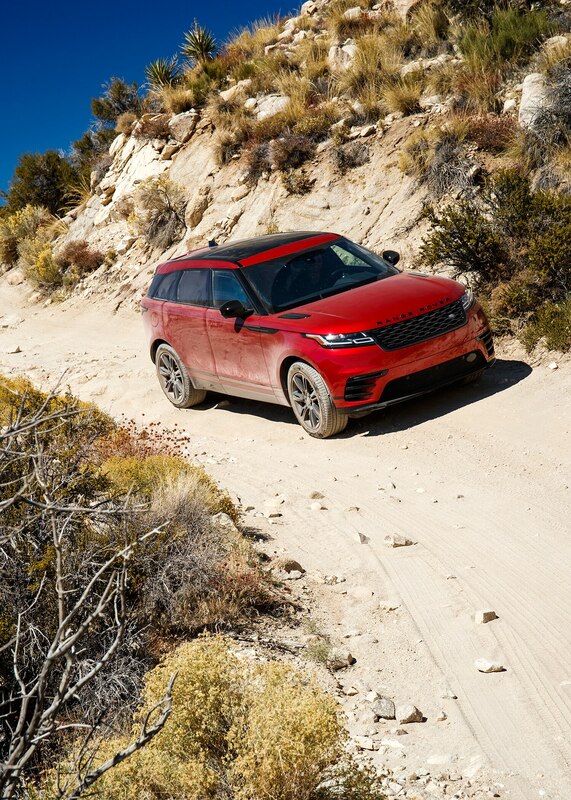 The Velar expertly and confidently handled the tricky trail through the eastern San Bernardino Mountains, its forward progress easily managed either by human inputs or the ATPC, which will crawl you along at your chosen speed within its operational range of 2.2 mph and 18 mph. 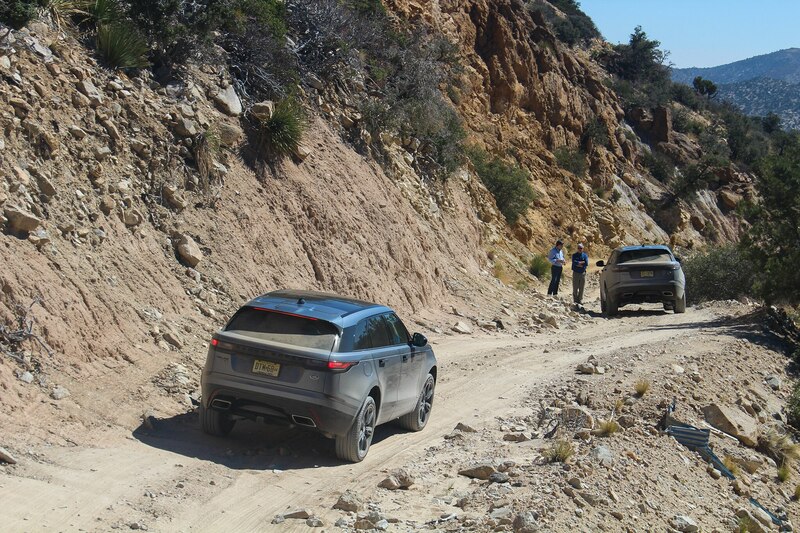 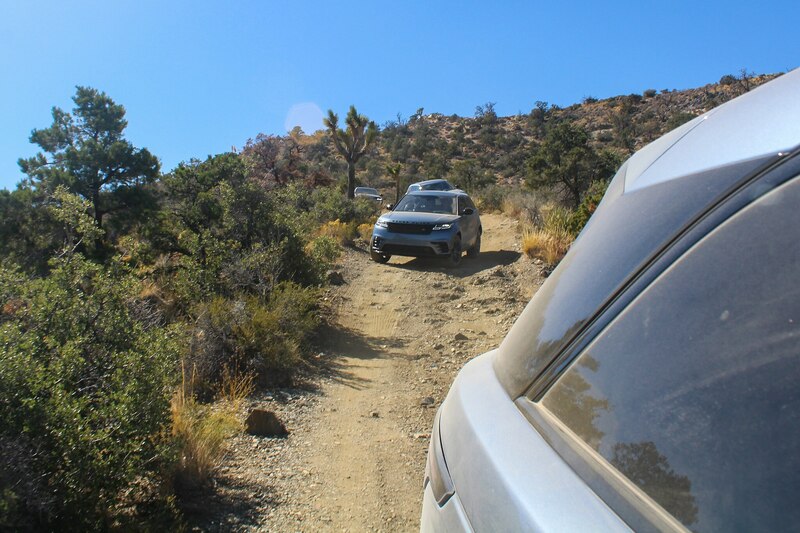 Even some of the hardened off-roaders on-hand appeared impressed, and I’m not talking about the instructors charged with making sure we journalists kept the cars shiny and smooth. 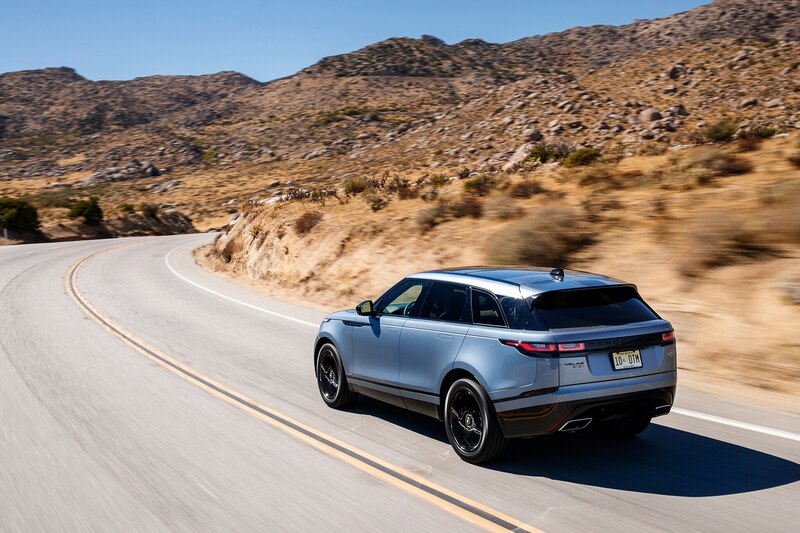 Out of the hills and back in the land of cell reception, the Velar offered a comfortable and luxurious cruise, soaking up bumps and keeping wind and tire noises outside the cabin where they belong. 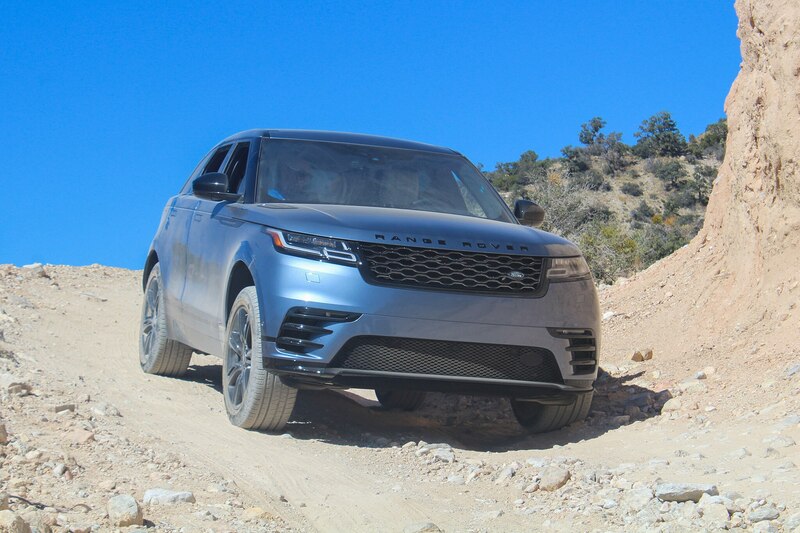 As mentioned earlier, the air-sprung V-6 felt bouncier on uneven pavement, and seemed to offer a bit more body roll through the turns. 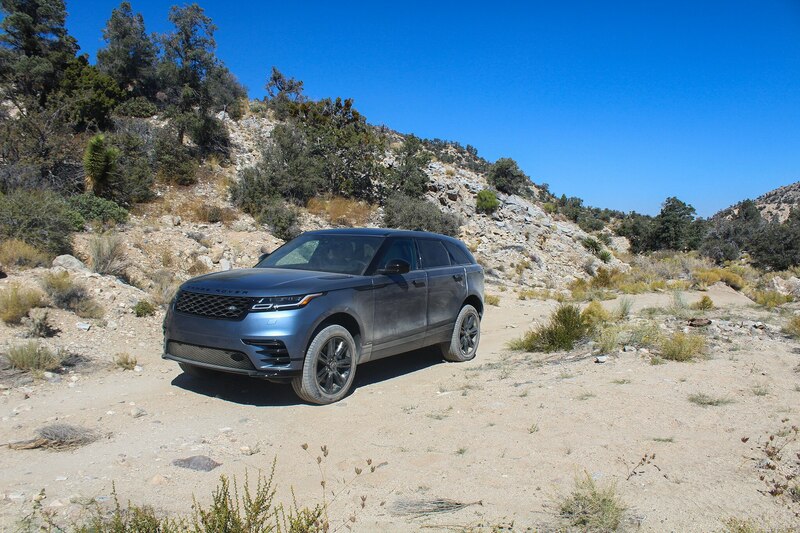 Neither setup offered as much confidence as that of our Jaguar F-Pace, and steering leans toward the looser side of things, but sporty driving isn’t the Velar’s mission, either. 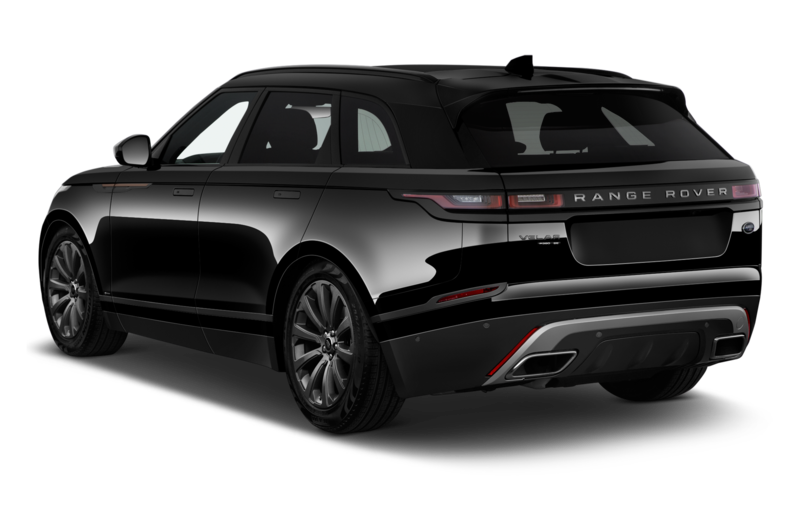 Still, it’ll happily manage a mountain road at the posted speed limit without making the rear passengers decorate the leather with their lunches on the way up to the ski chalet. 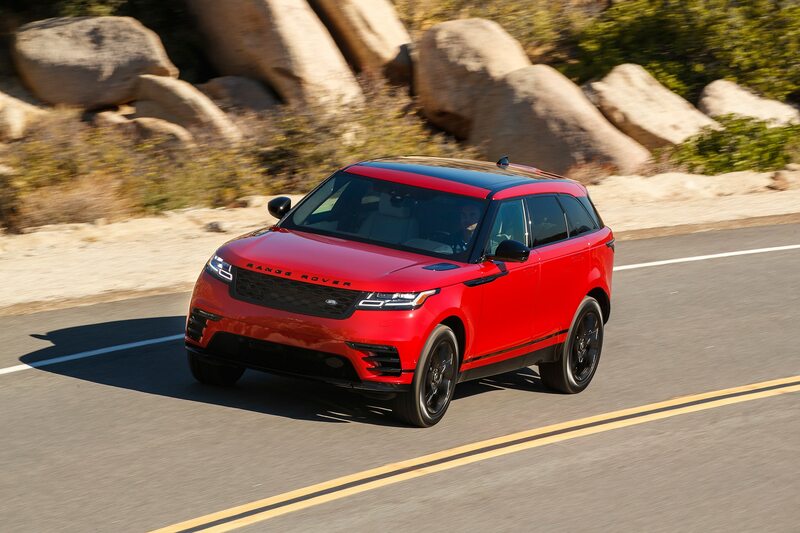 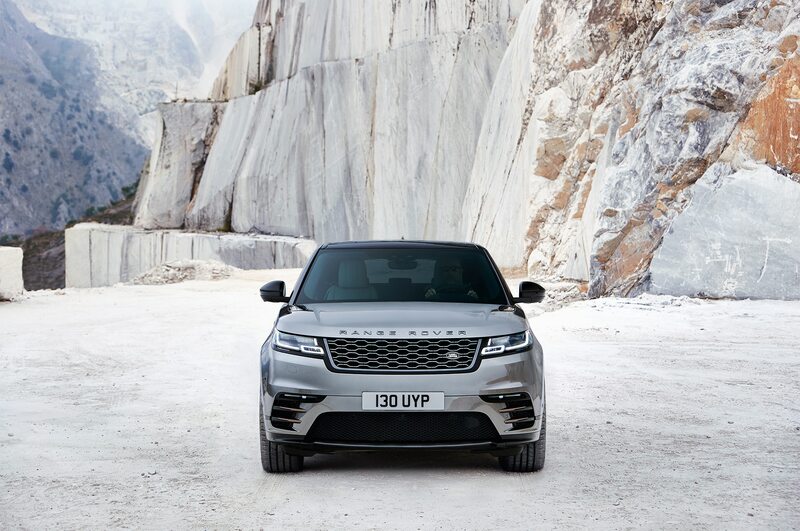 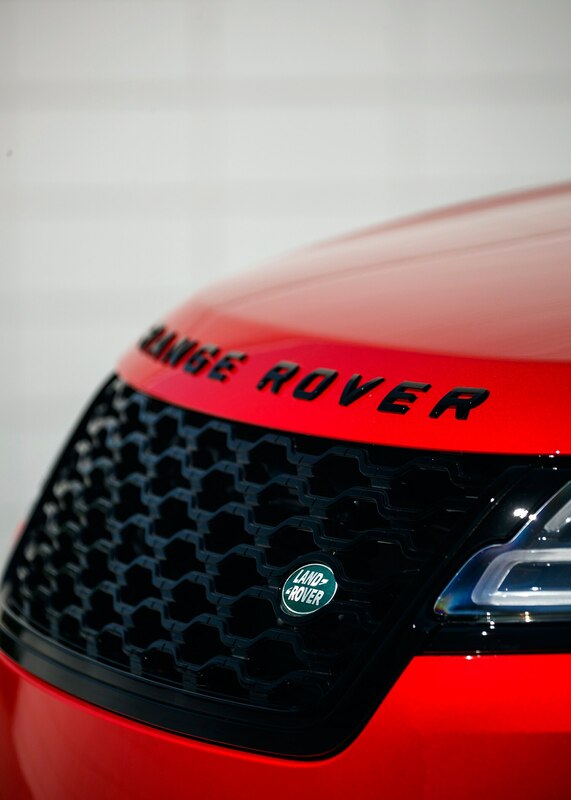 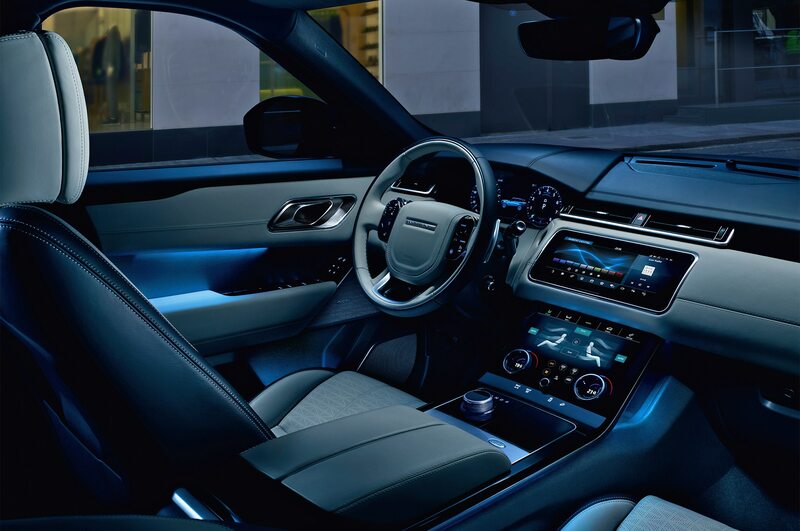 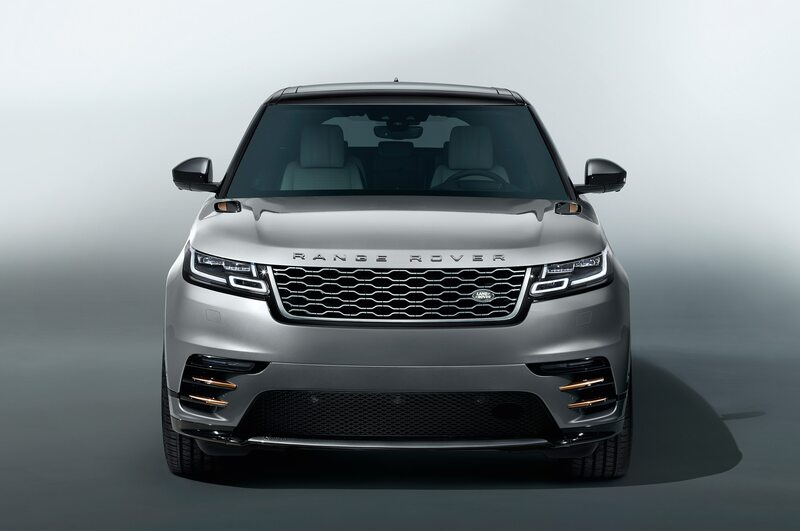 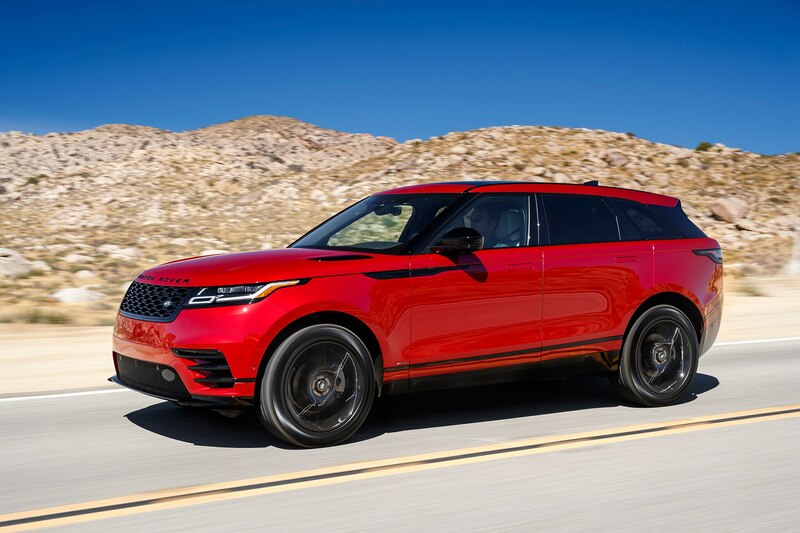 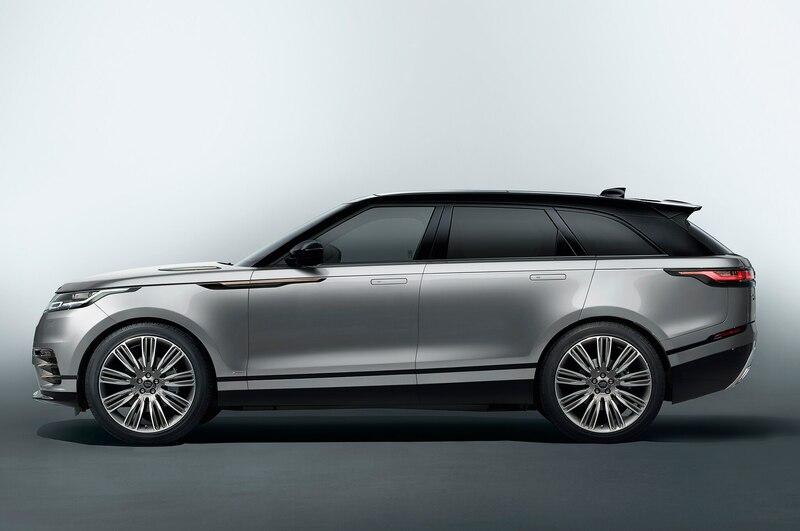 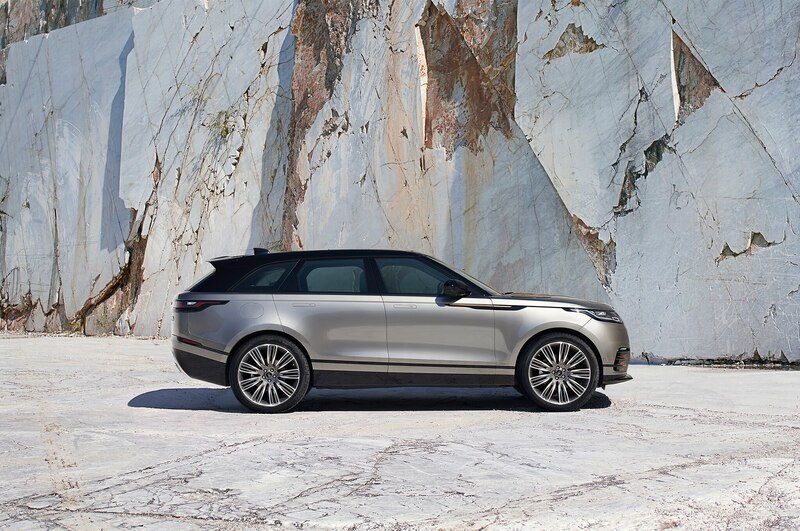 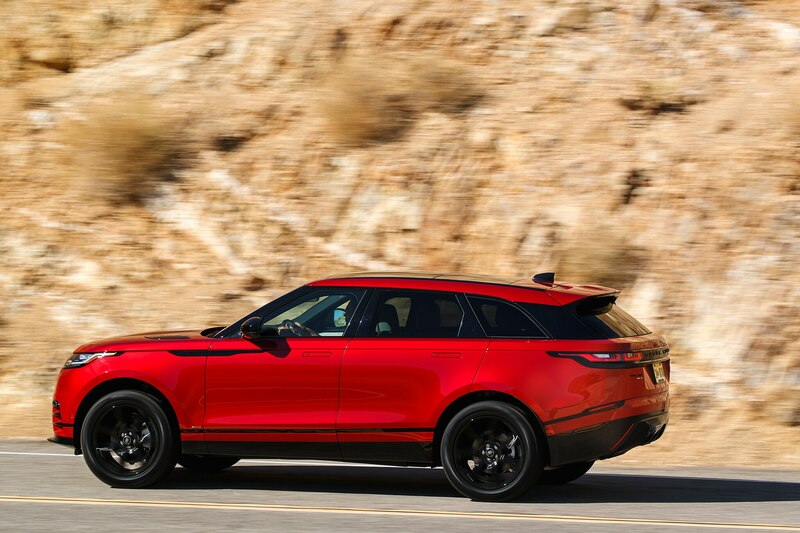 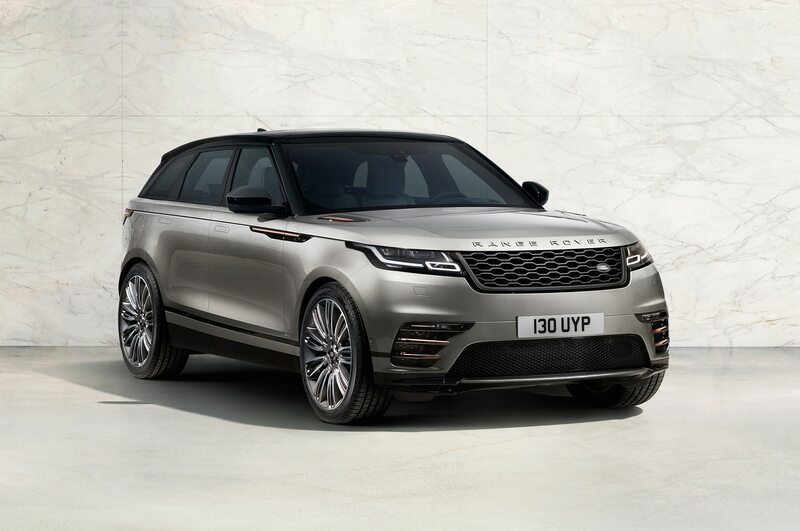 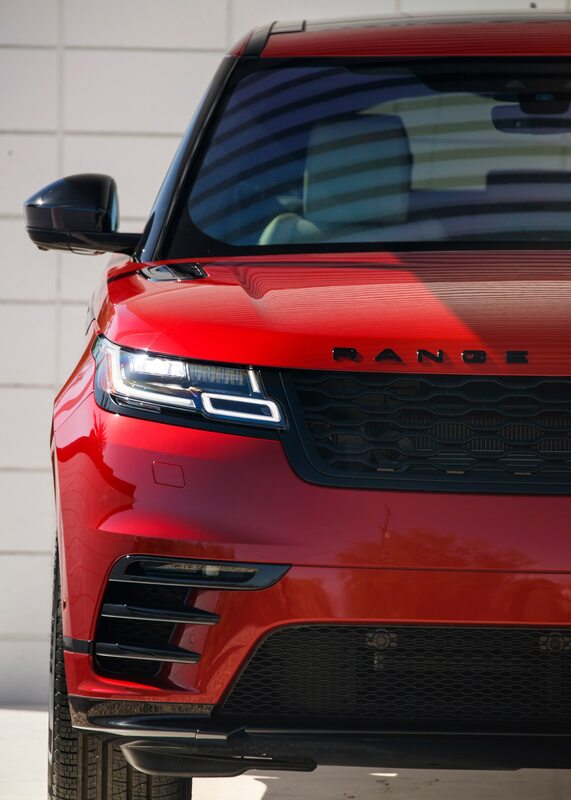 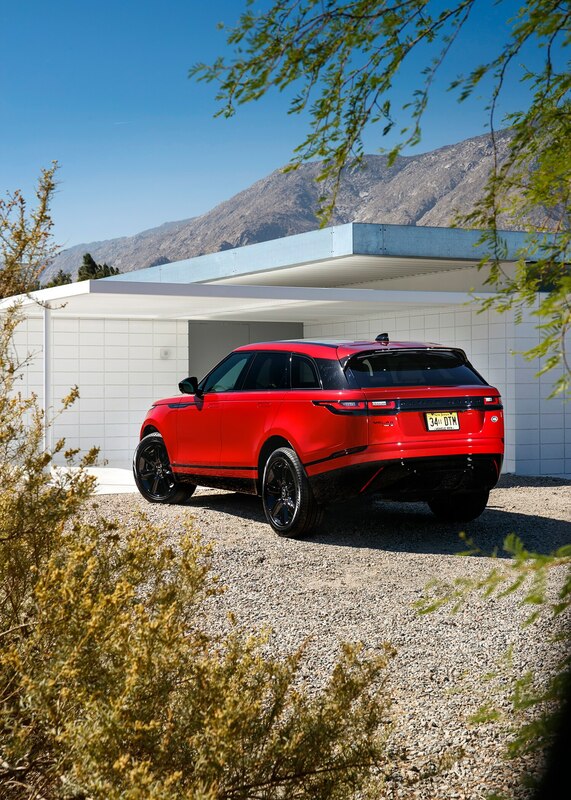 While some may find the Velar’s design to be so smooth that it lands in their personal uncanny valley, there is no question that this Range Rover is smartly positioned and well-executed. 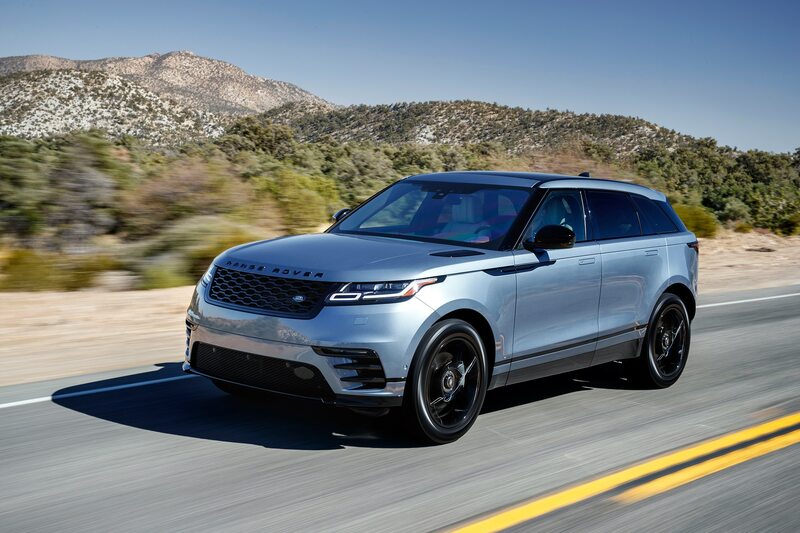 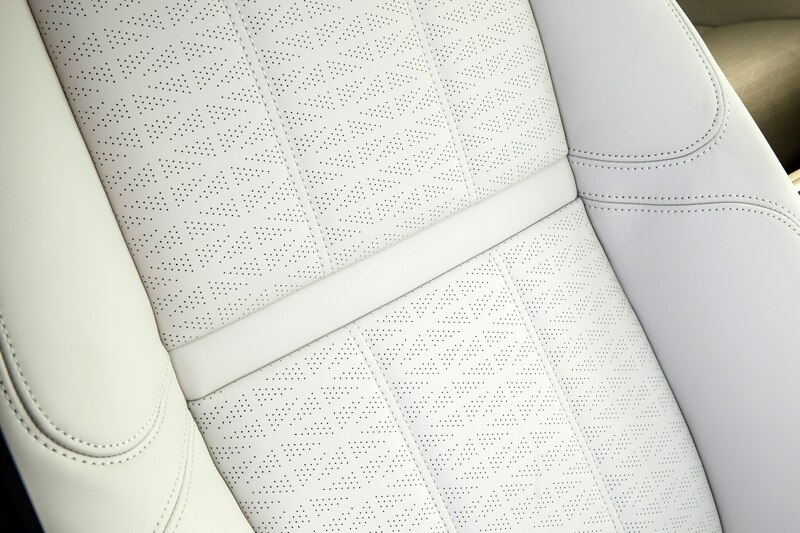 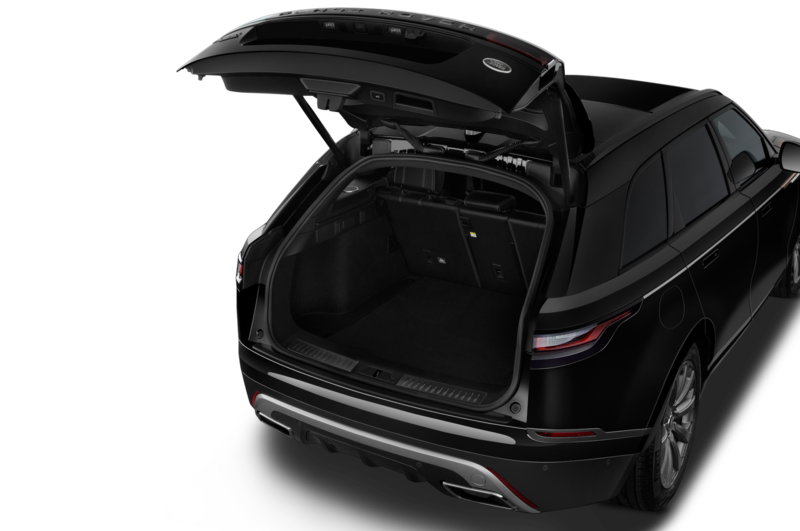 It checks all of the important luxury SUV boxes and neatly fills the $50k-$70k gap for the company’s lineup, giving Land Rover a dollar-for-dollar answer to the Porsche Macan, Mercedes-Benz GLE, and BMW X5. 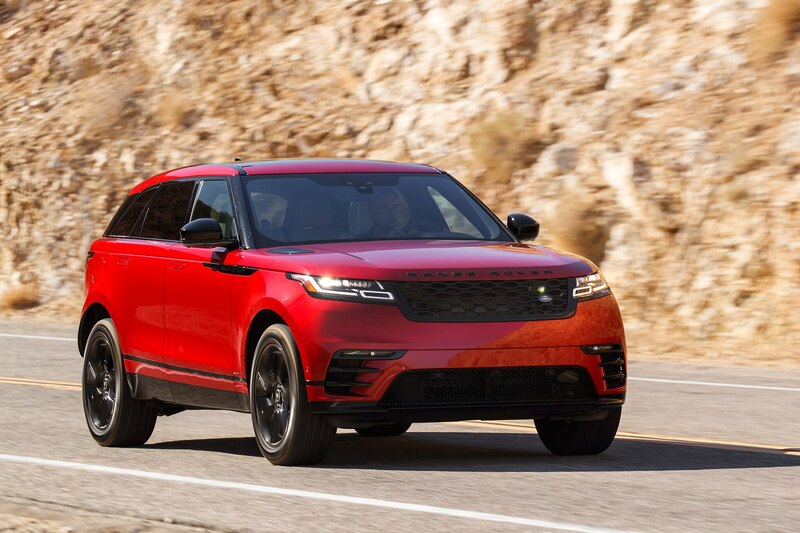 Given the appeal of the Range Rover brand and the Velar’s adherence to its brand values, this Brit should give the Germans plenty to worry about. 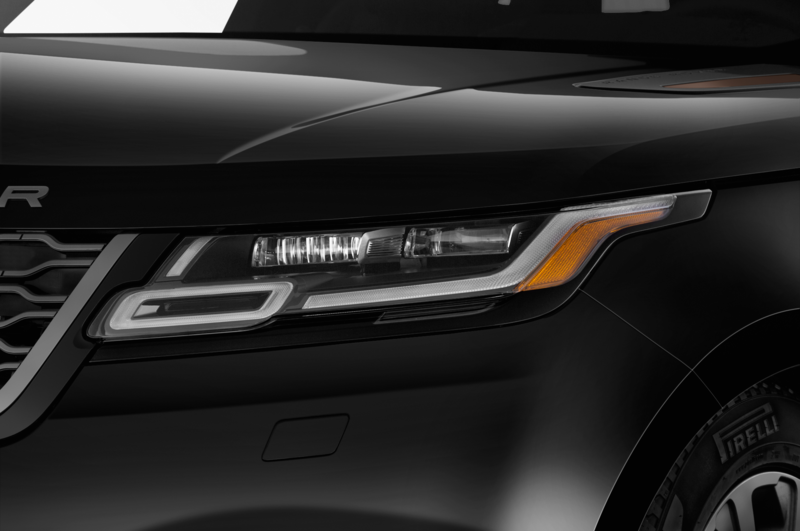 34 / 70 cu. 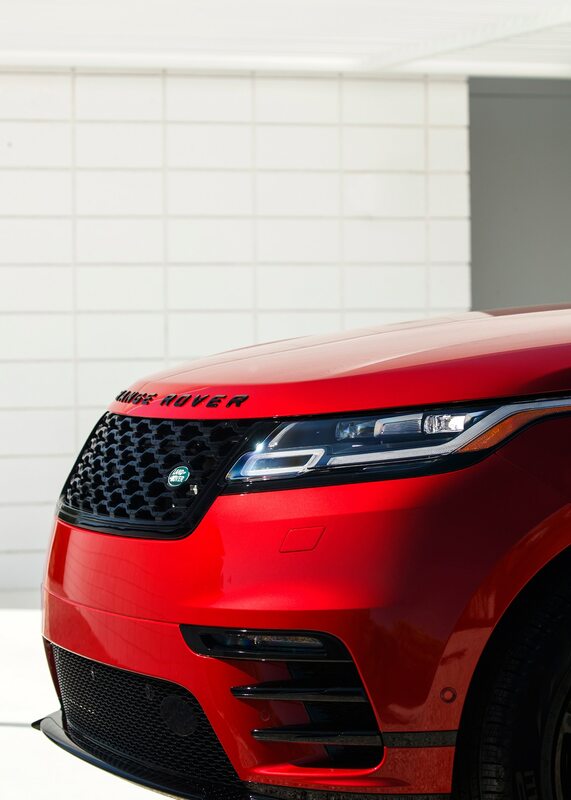 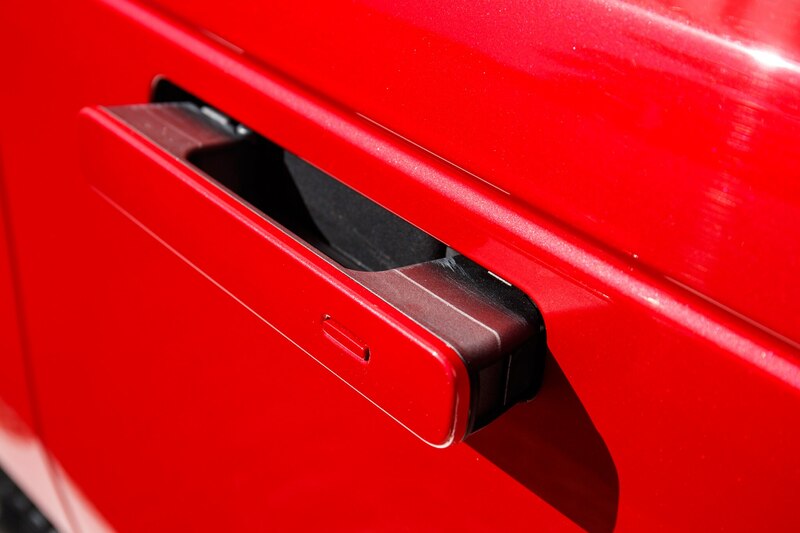 ft.
More range for your rover?